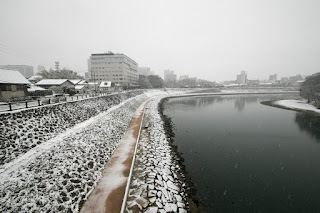 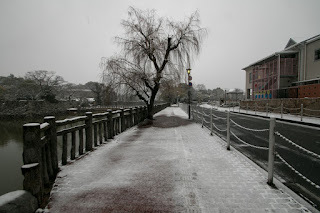 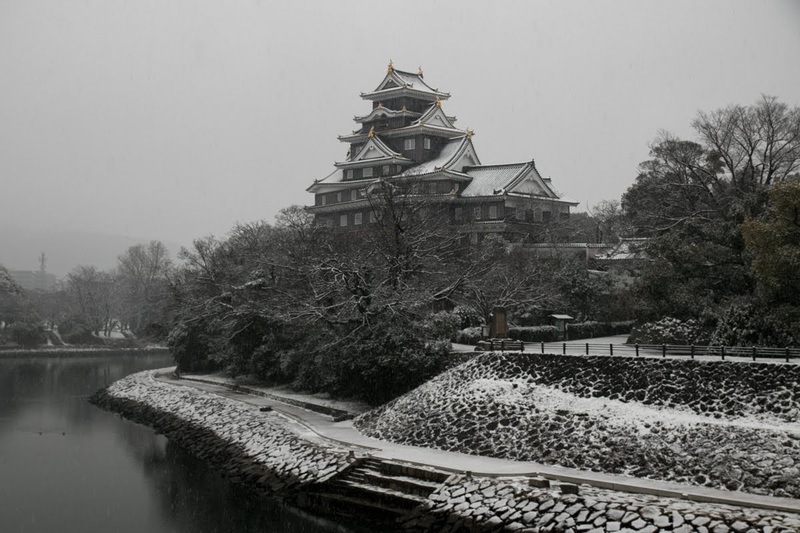 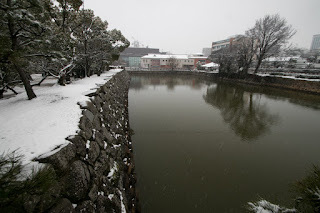 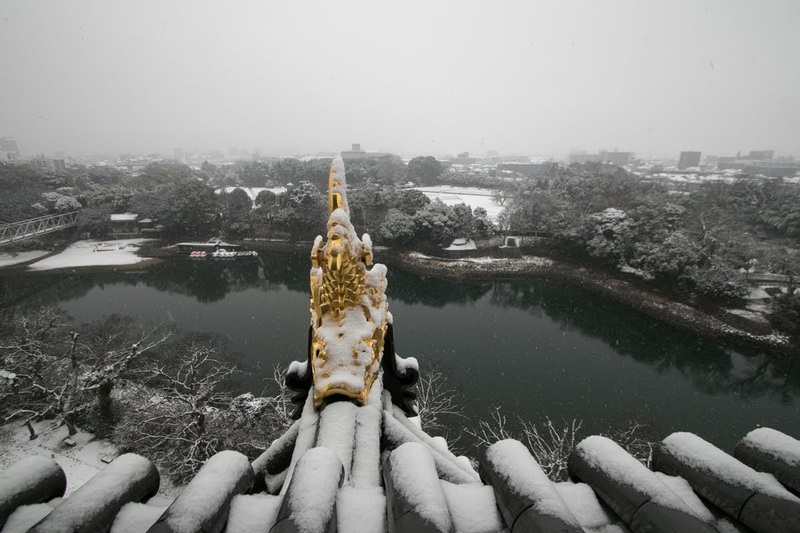 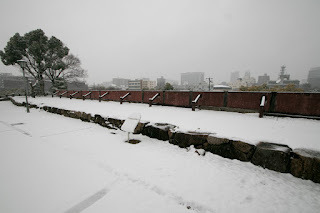 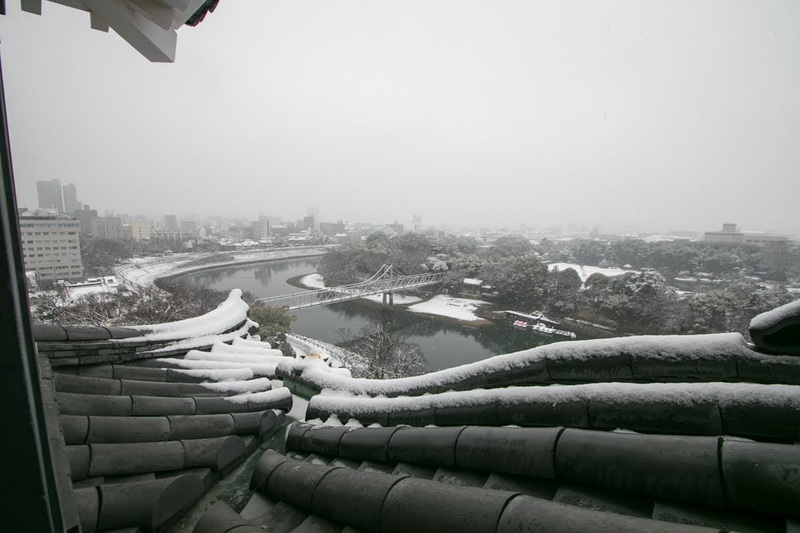 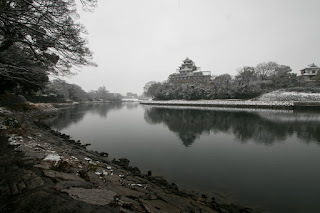 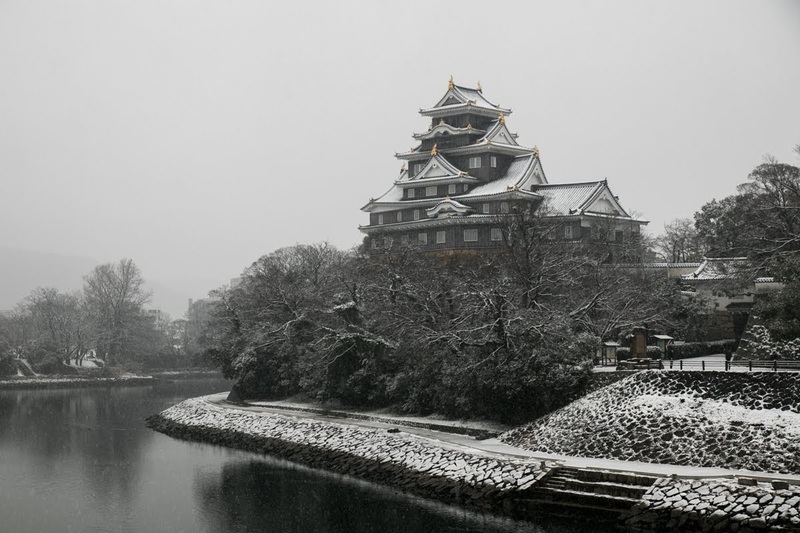 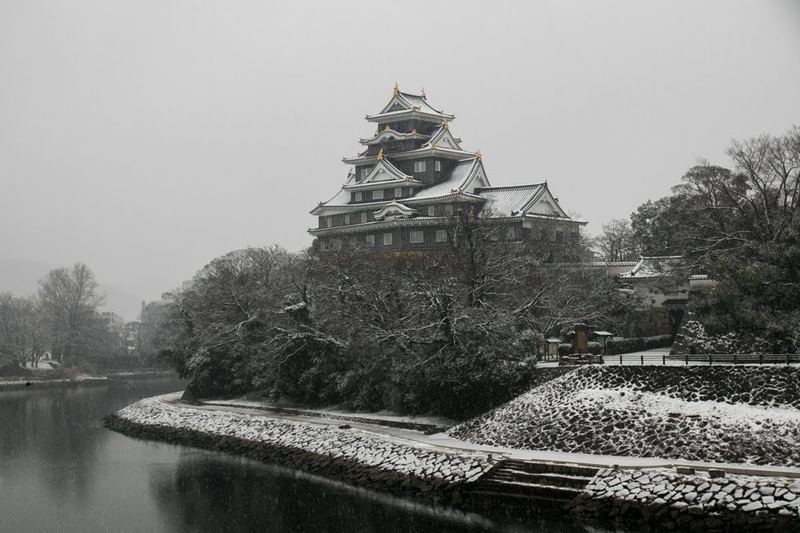 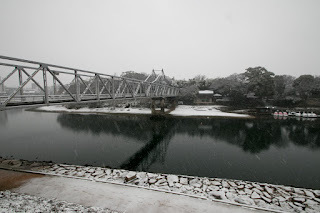 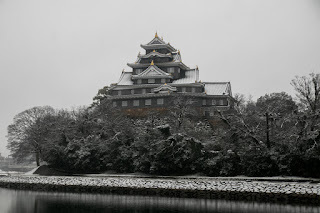 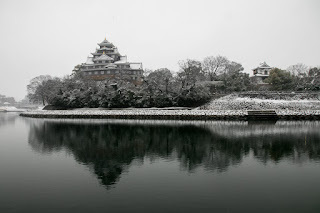 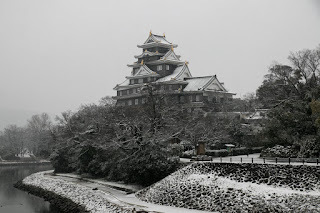 Okayama castle (岡山城) is located at the curving point of Asahigawa river, at the center of Okayama city. 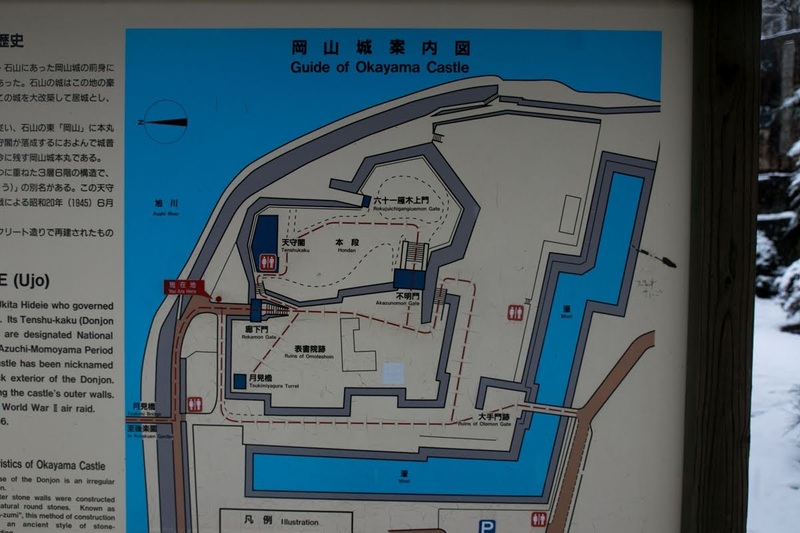 Okayama city spread over the Okamaya plain, and Okayama plain had been the center of this area with flat land and good port, from the era of ancient Kibi kingdom. But formerly Setonaikai Sea spread into the inside of the plain, and the site of Okayama castle was a delta area of Asahigawa river. 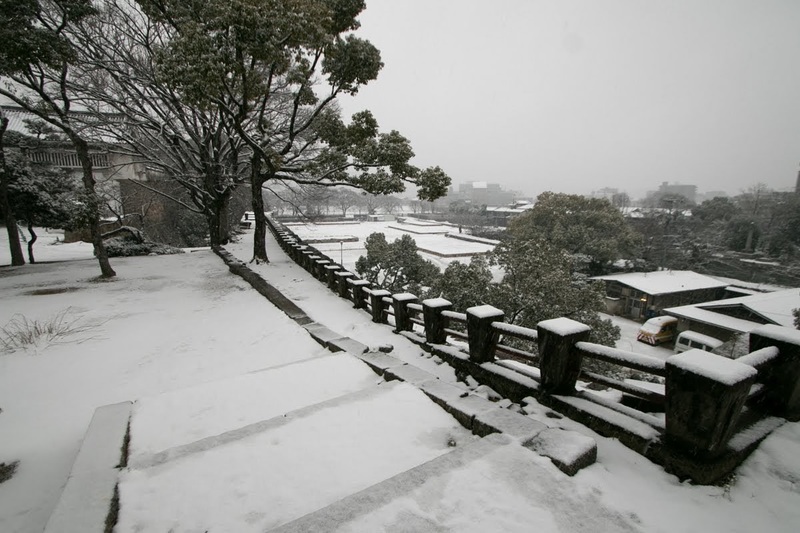 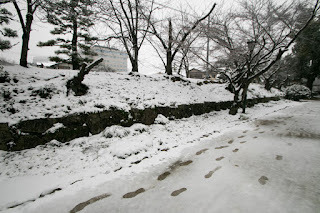 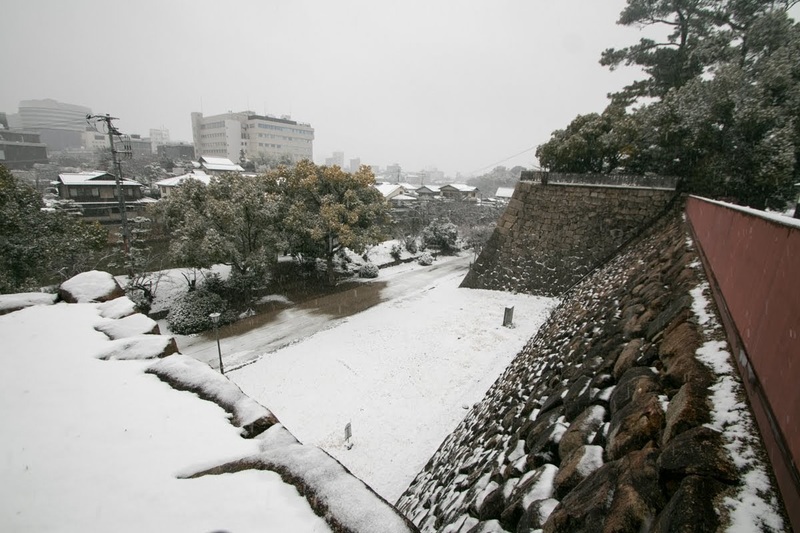 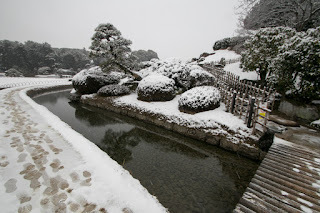 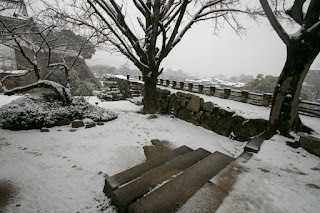 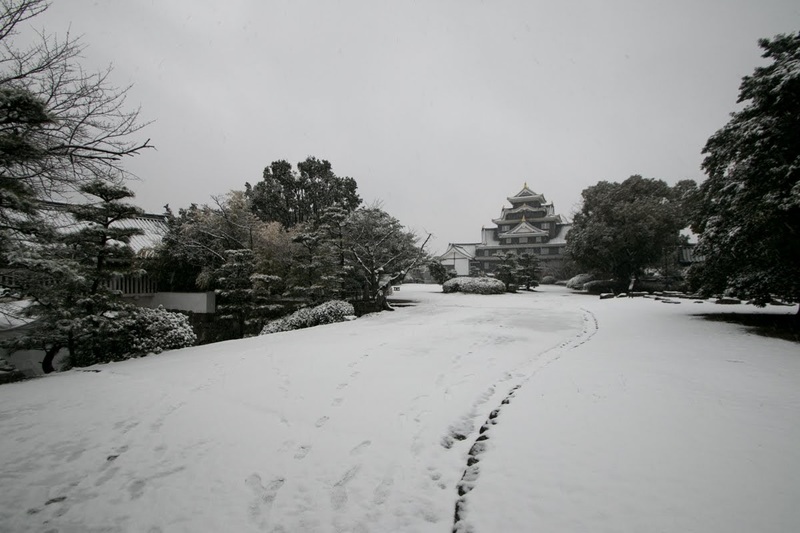 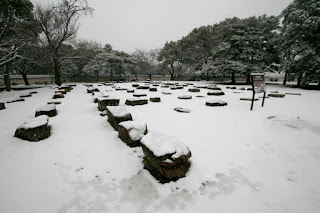 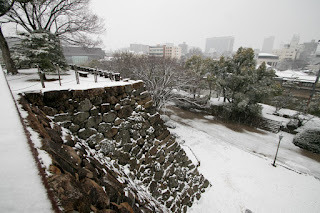 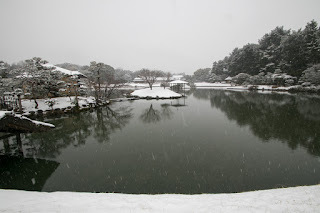 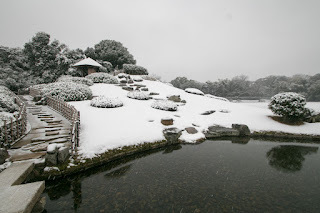 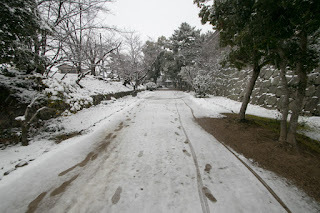 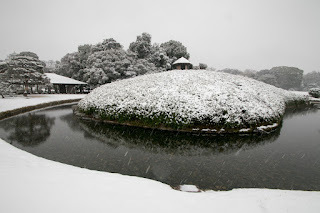 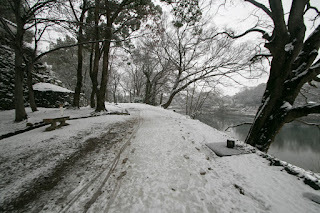 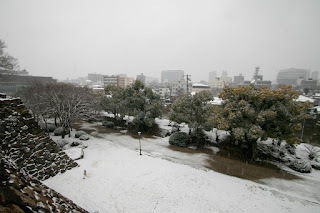 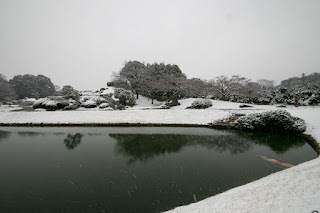 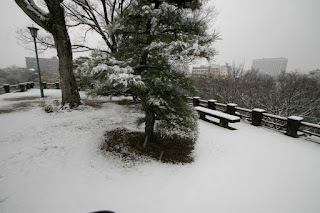 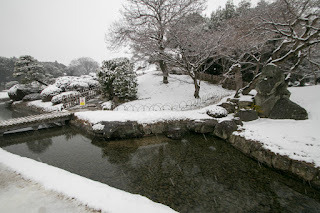 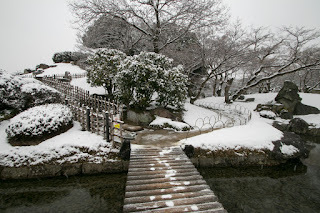 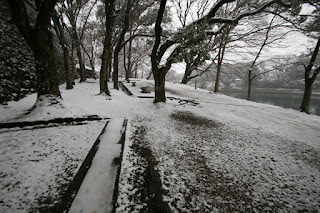 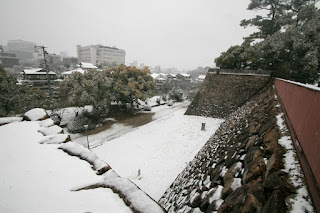 Okayama castle spread small hills located at a small height beside Asahigawa river. 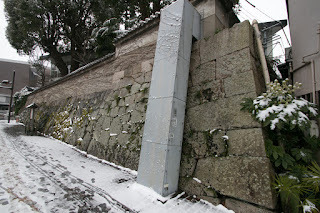 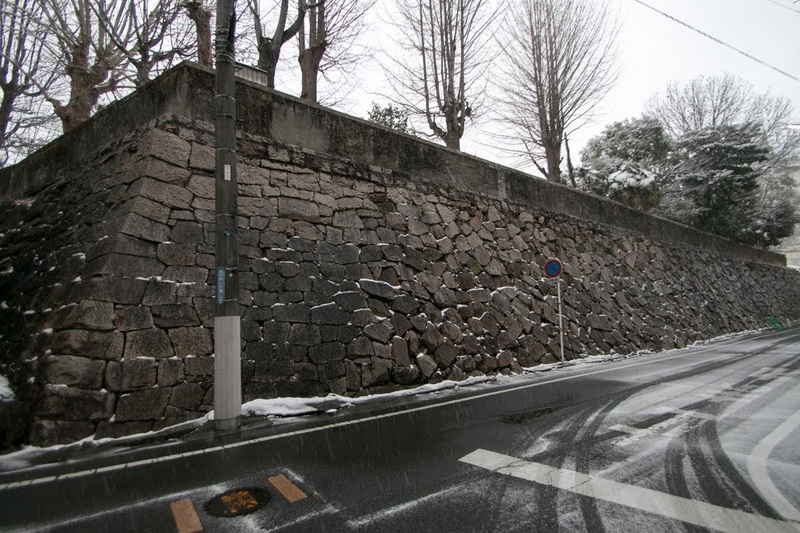 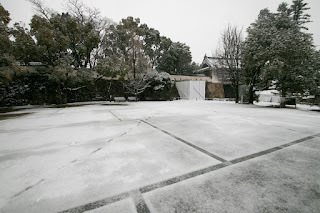 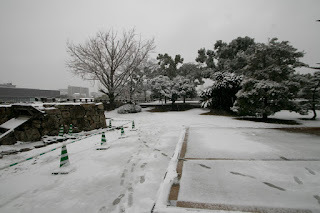 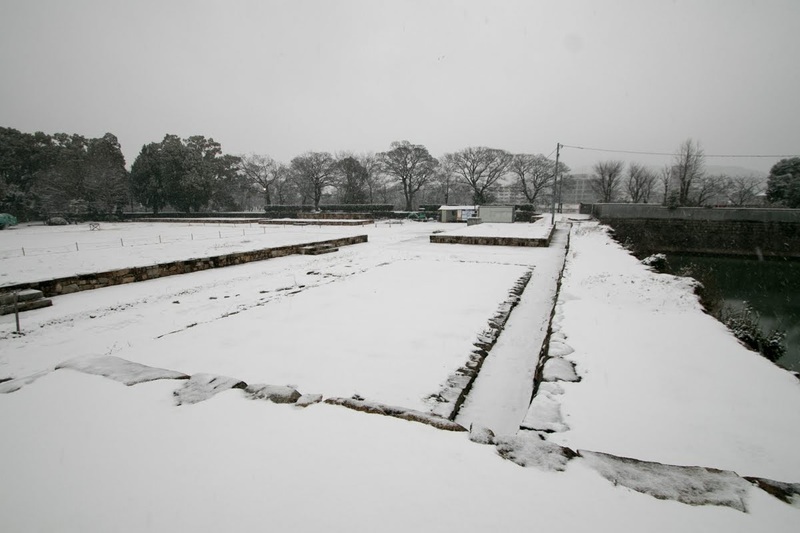 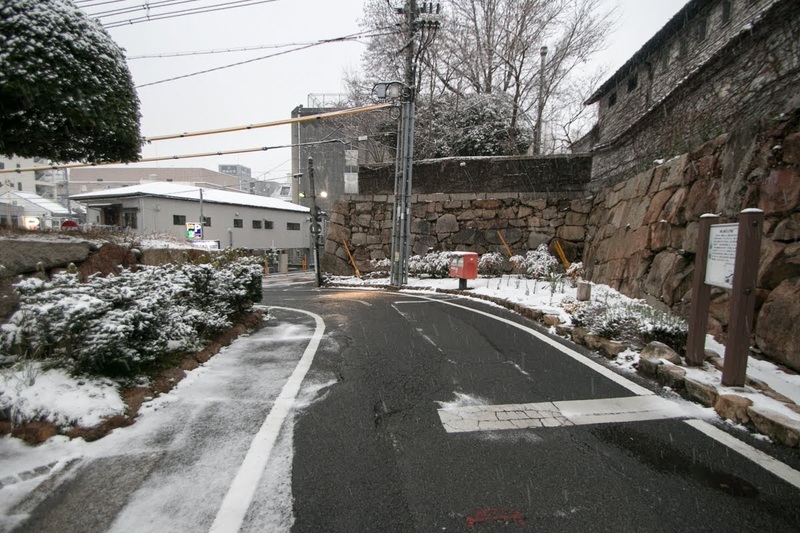 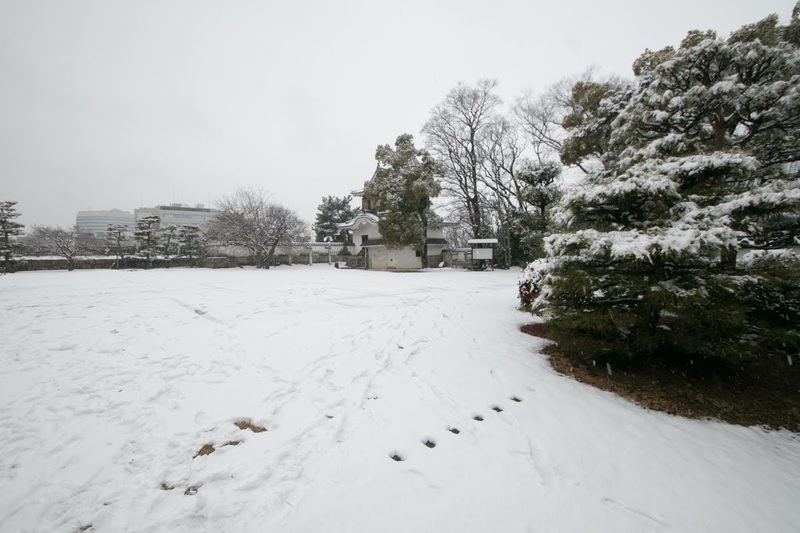 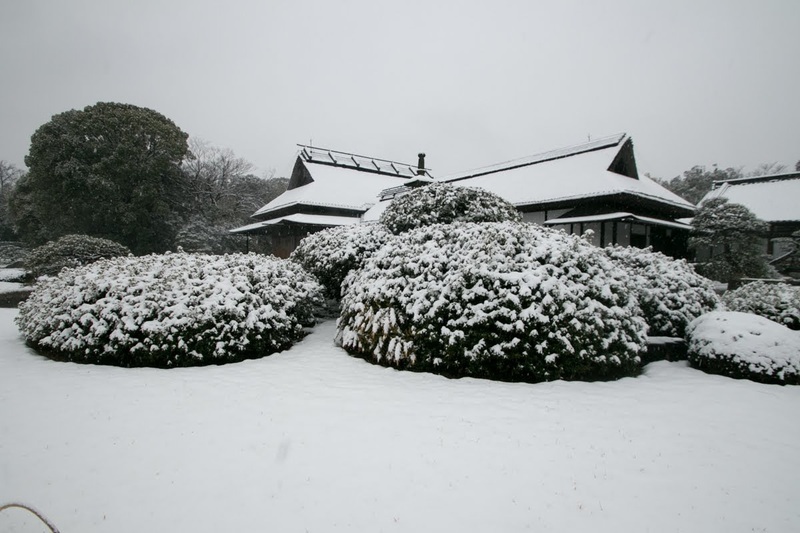 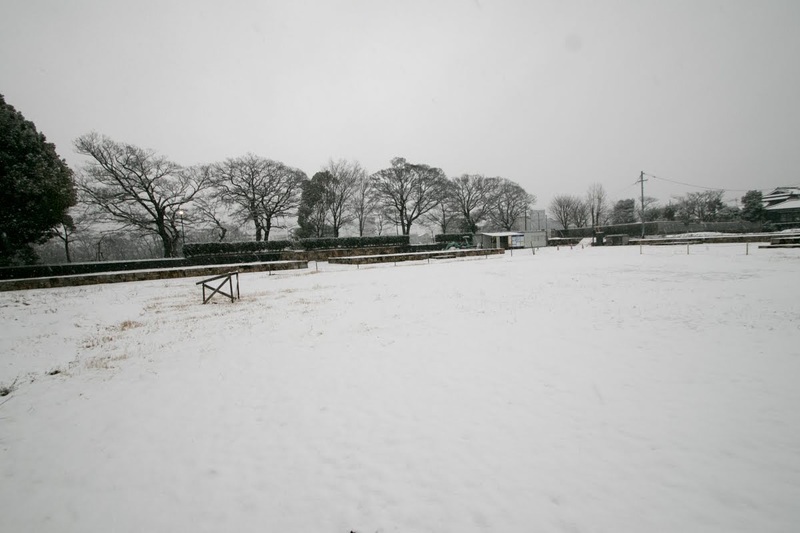 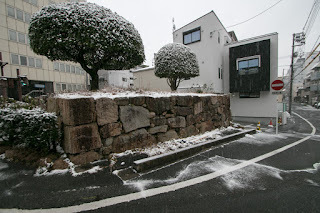 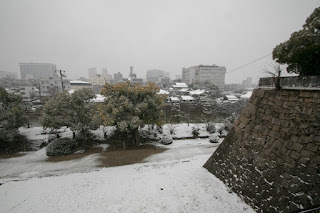 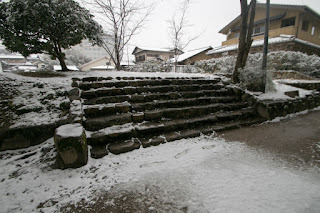 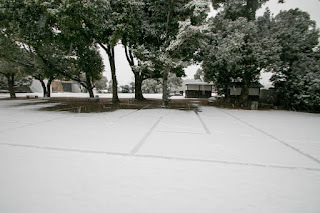 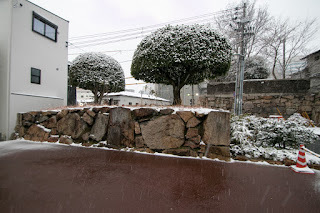 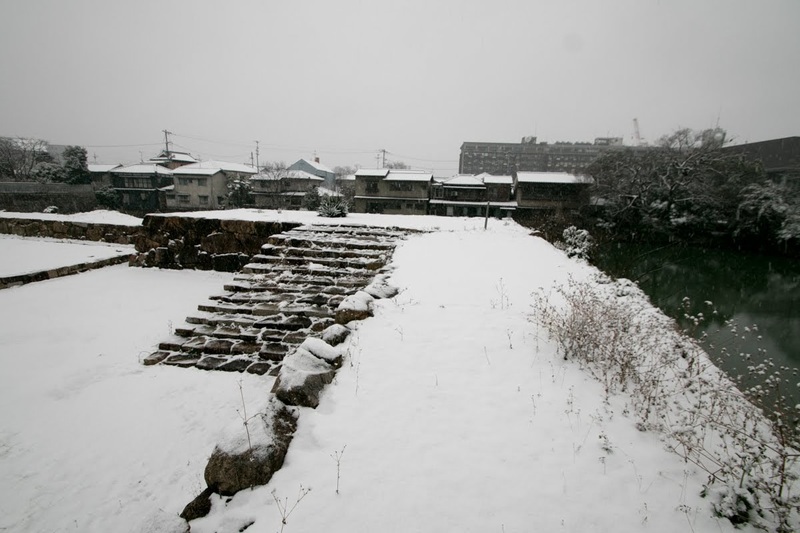 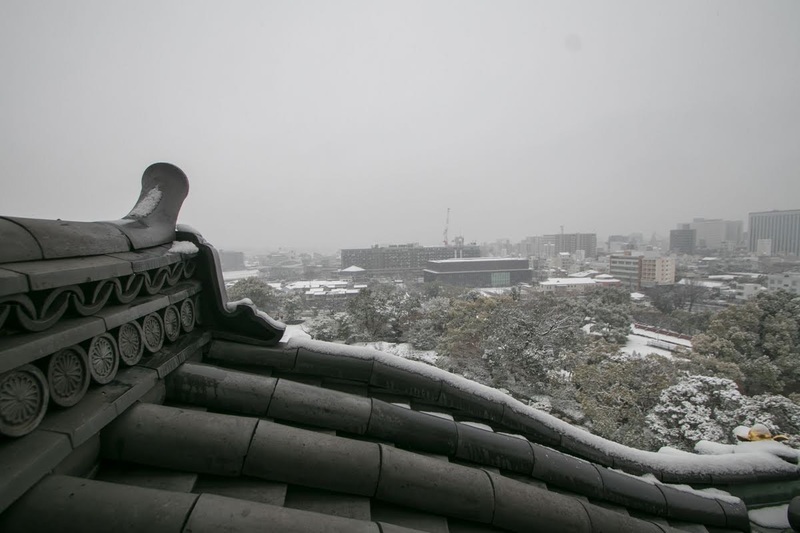 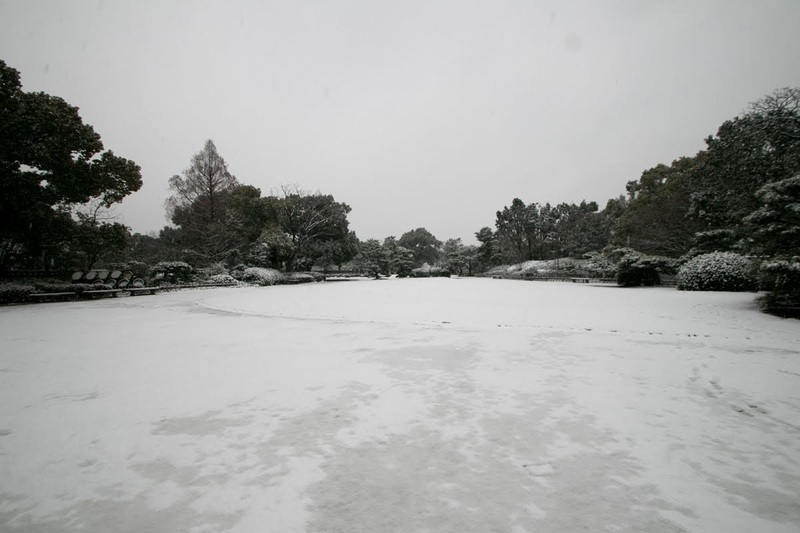 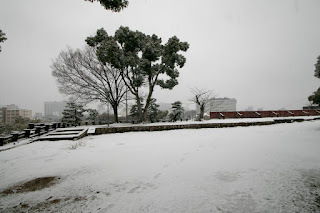 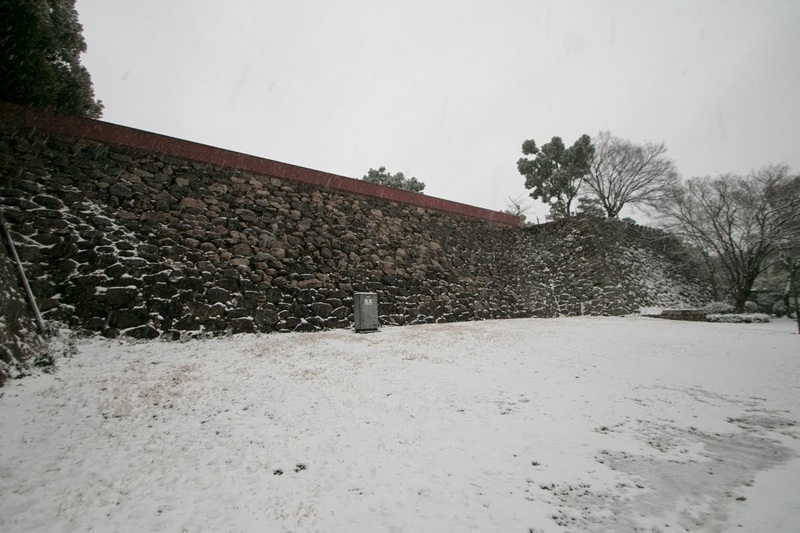 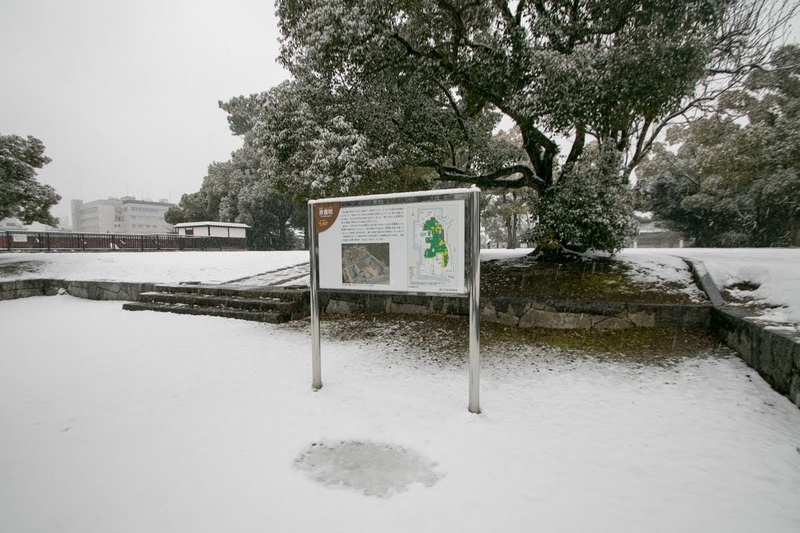 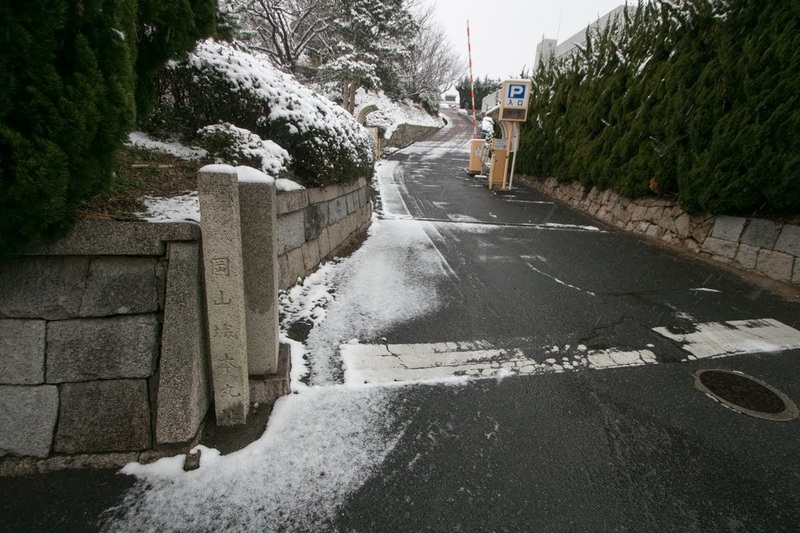 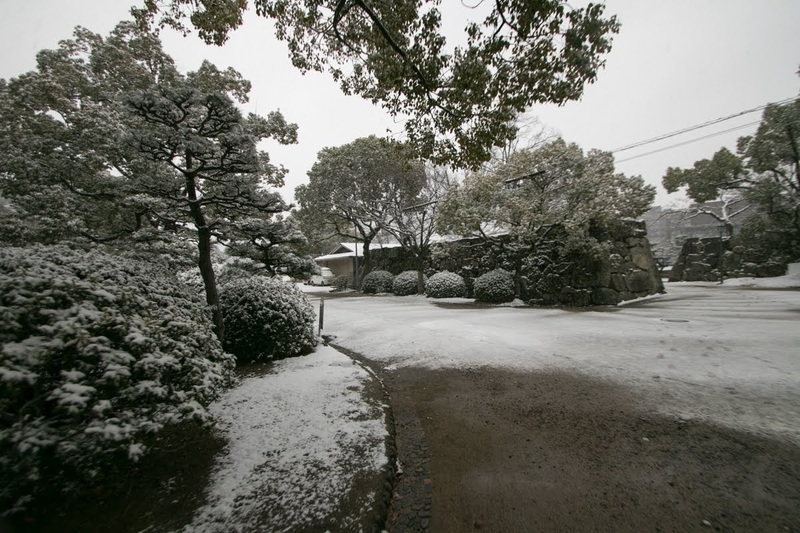 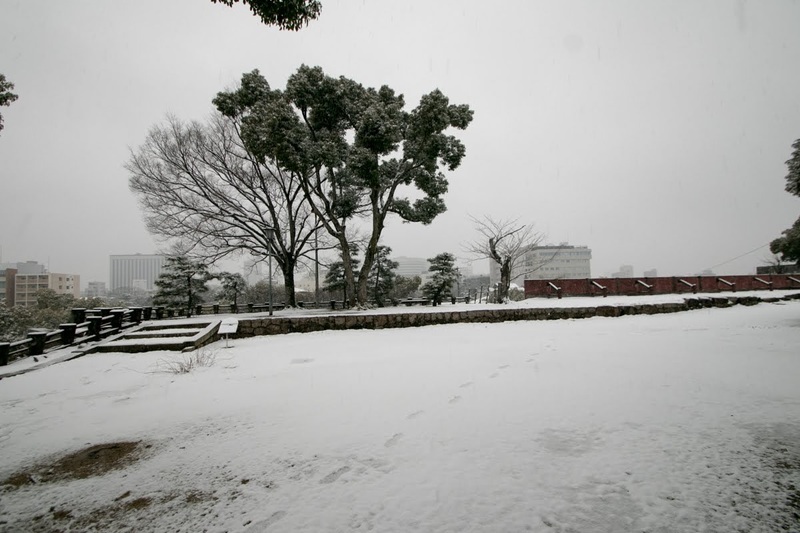 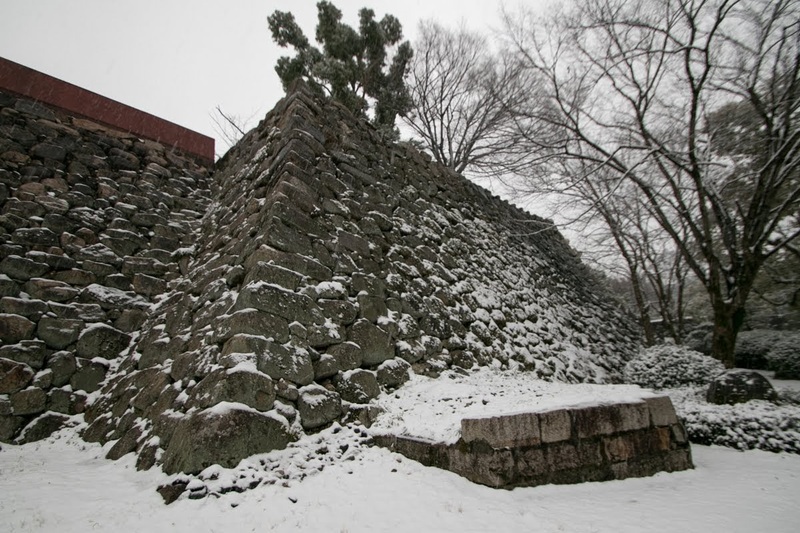 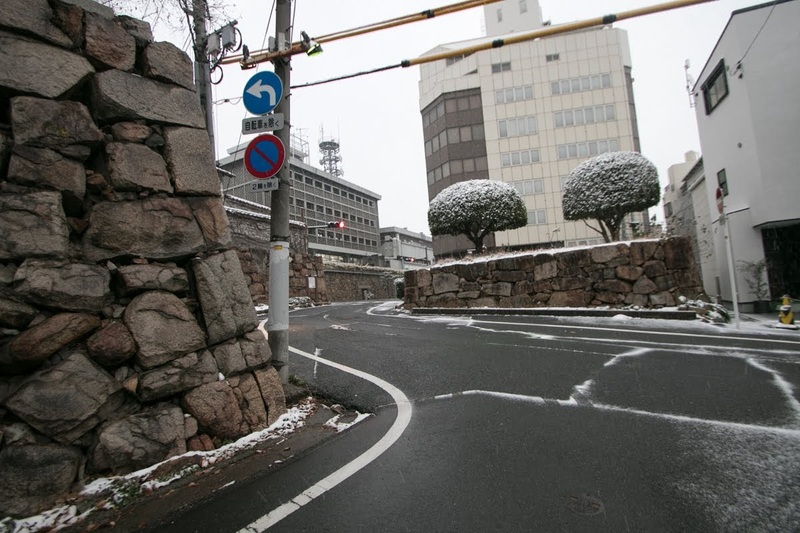 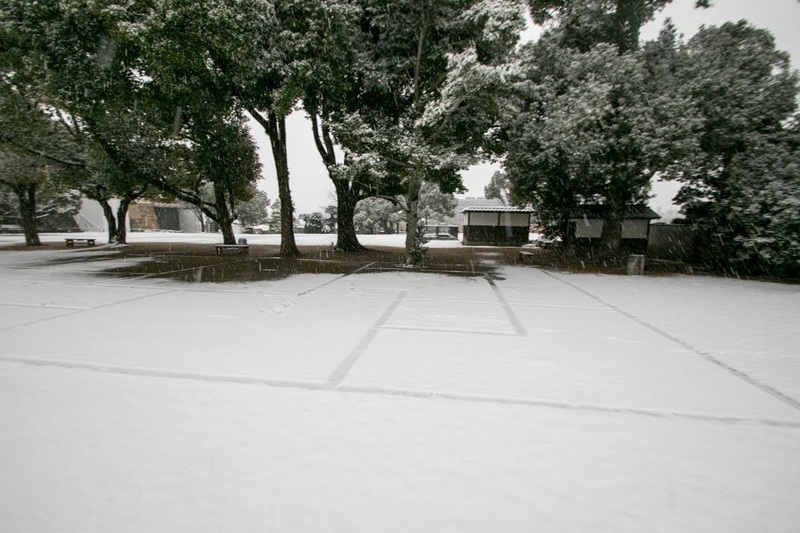 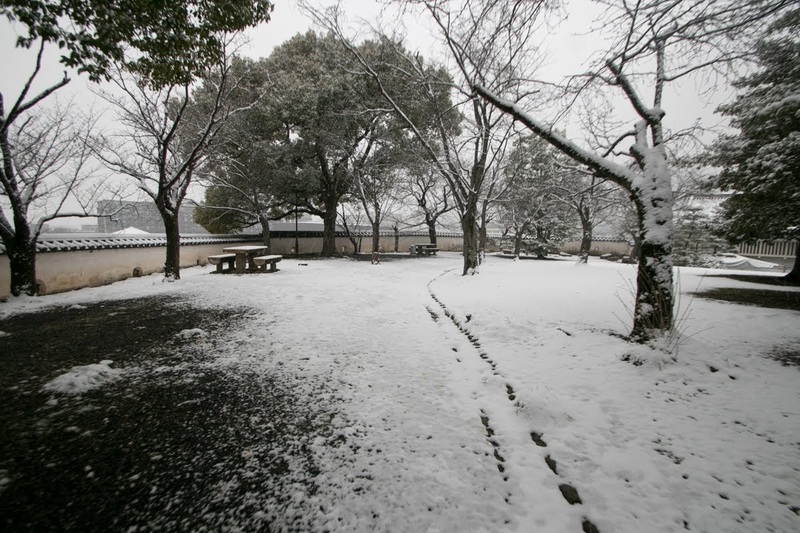 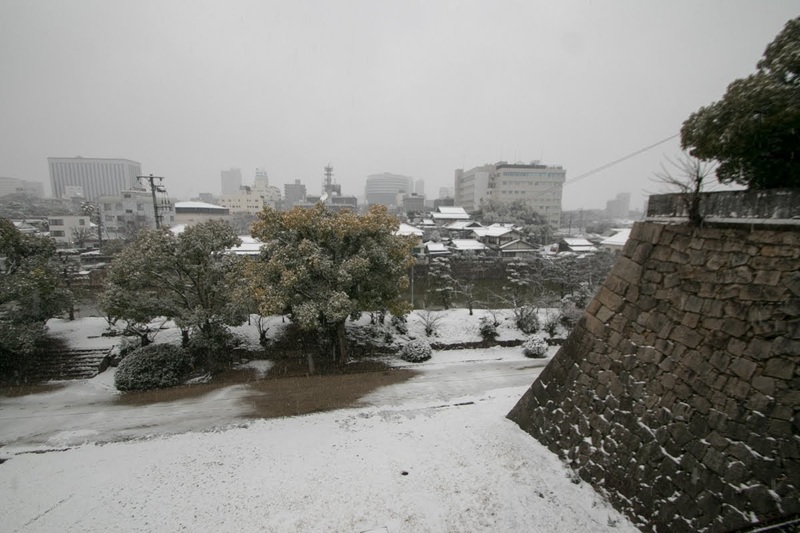 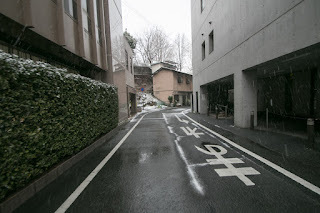 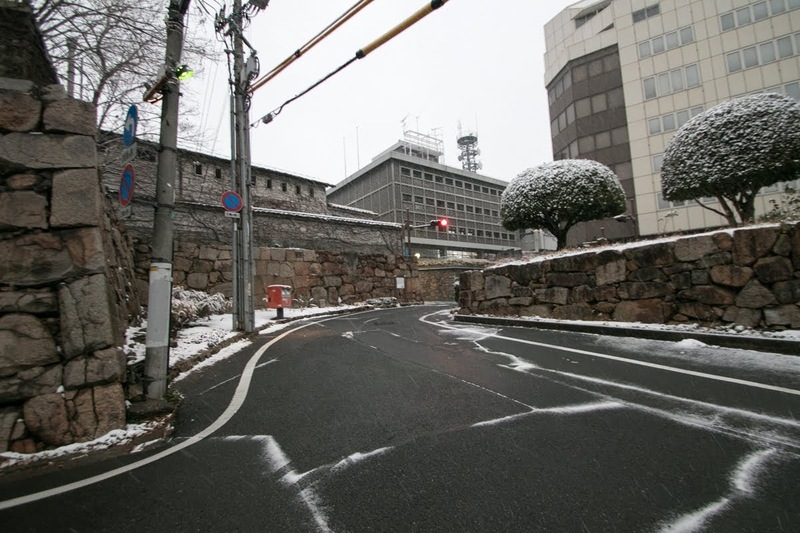 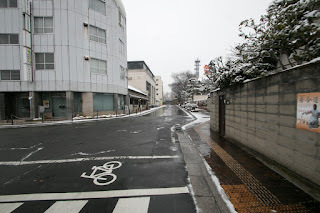 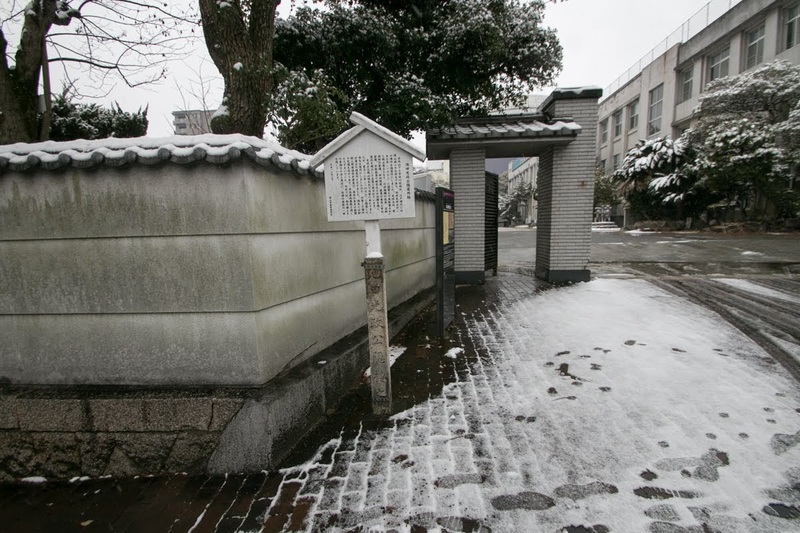 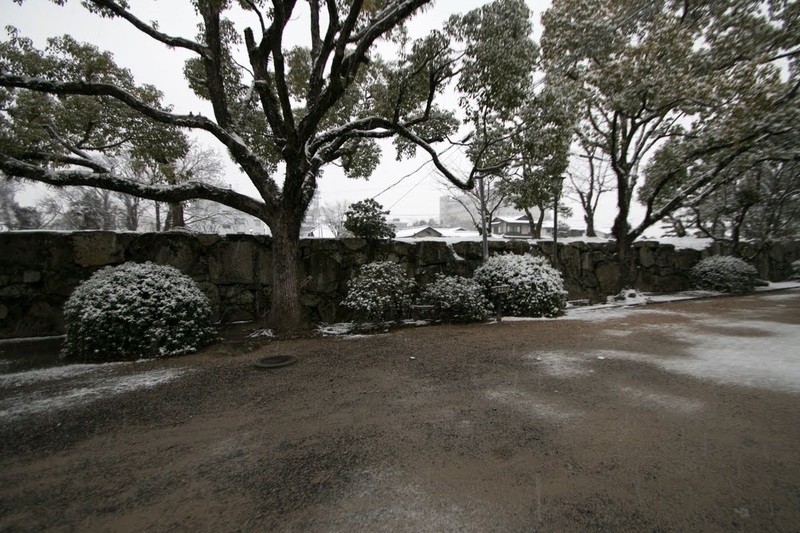 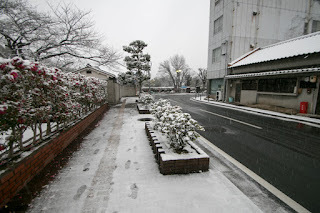 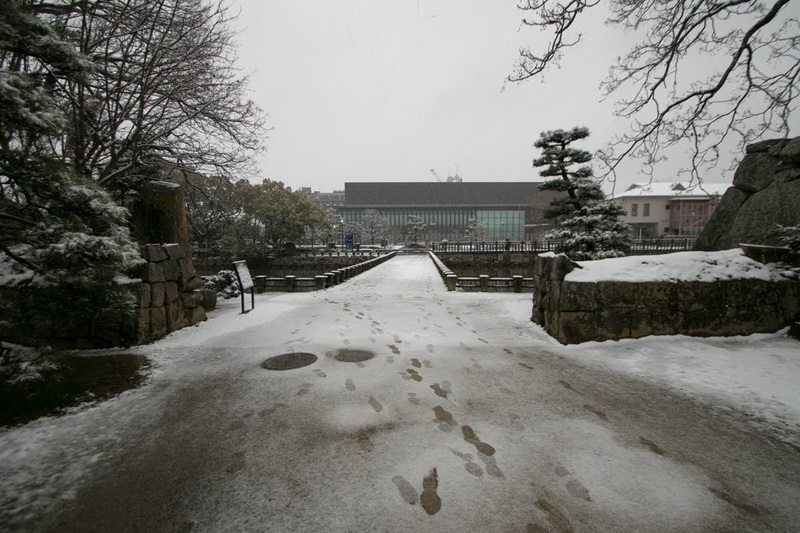 Originally there was a small castle named Ishiyama castle at the site of current Nishinomaru area. 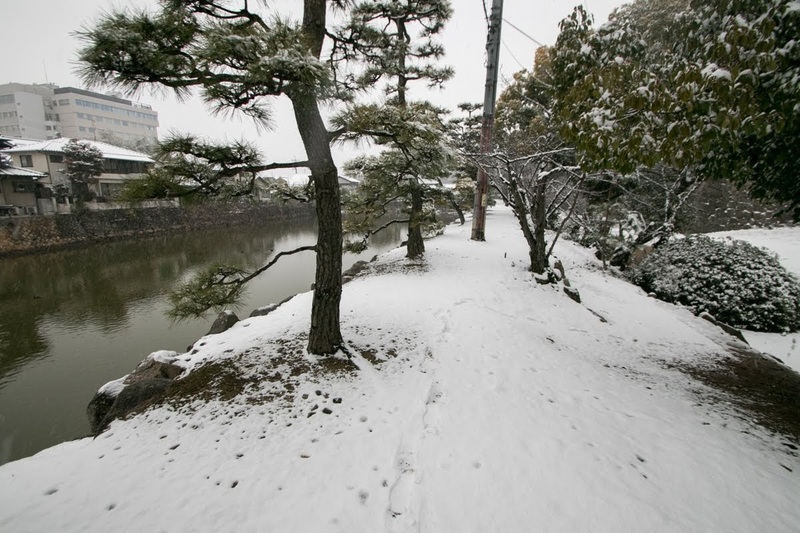 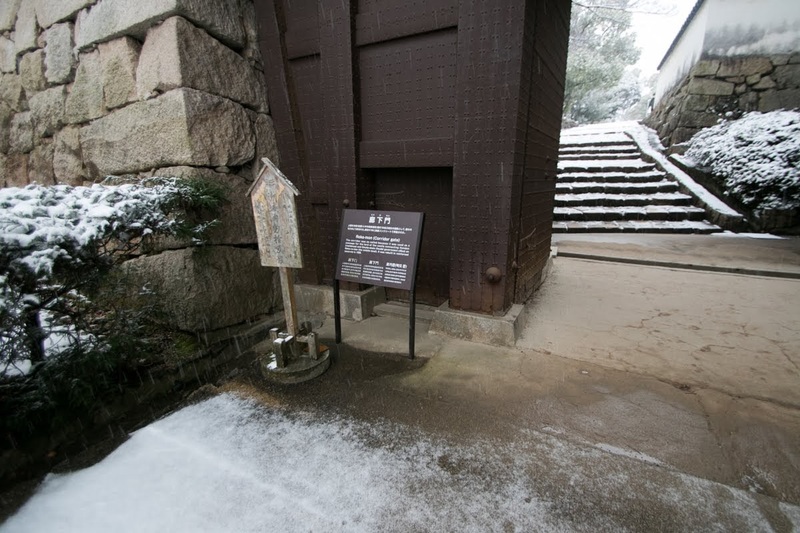 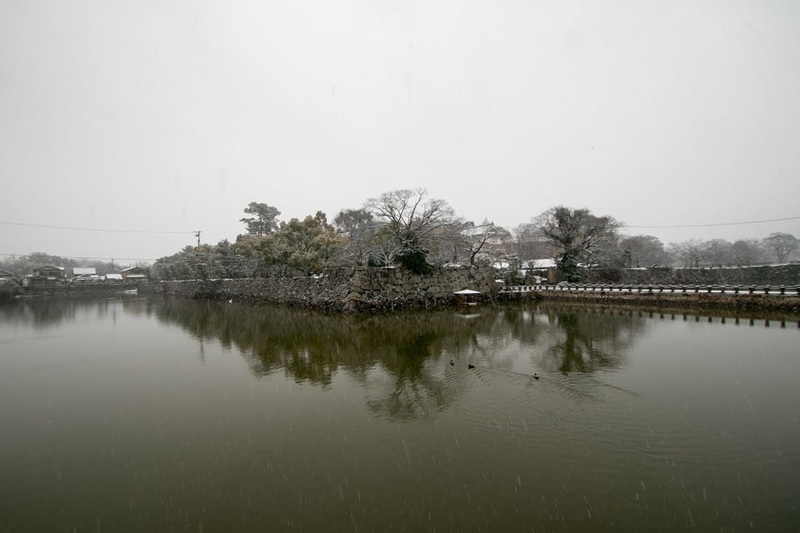 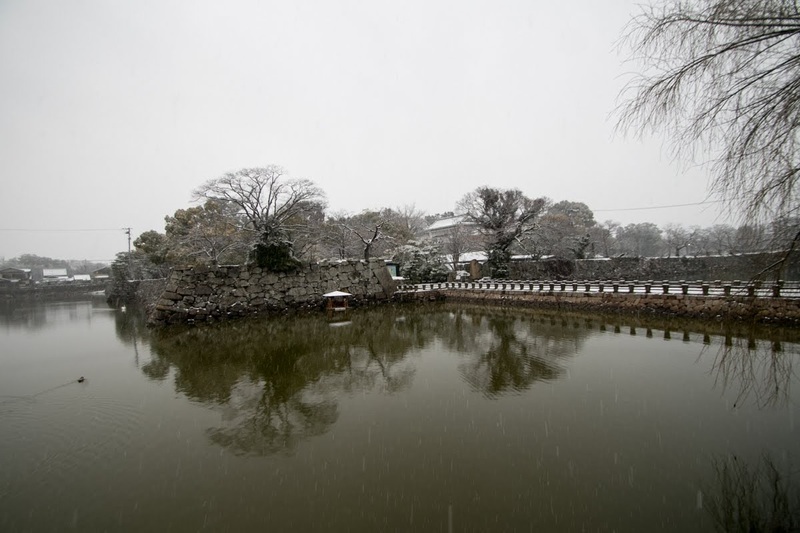 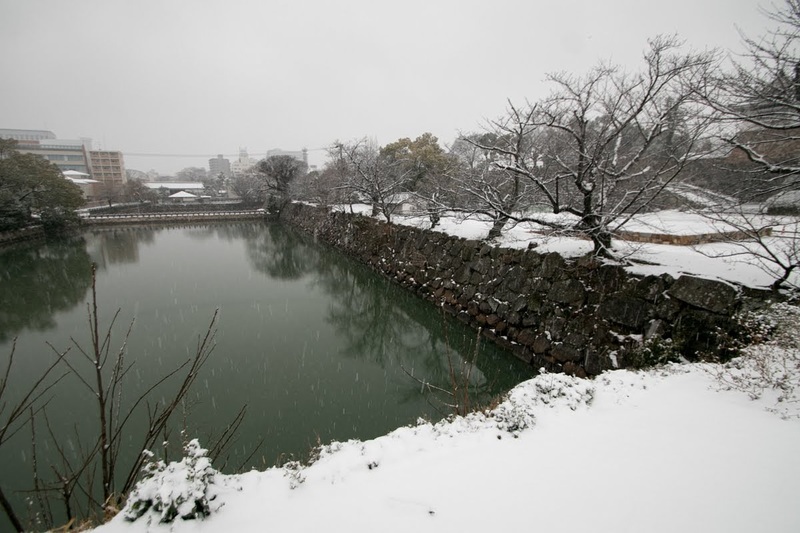 Originally Asahigawa river flew between current central area and Nishinomaru area, thus Ishiyama castle was a secure castle guarded its backside by Asahigawa river. 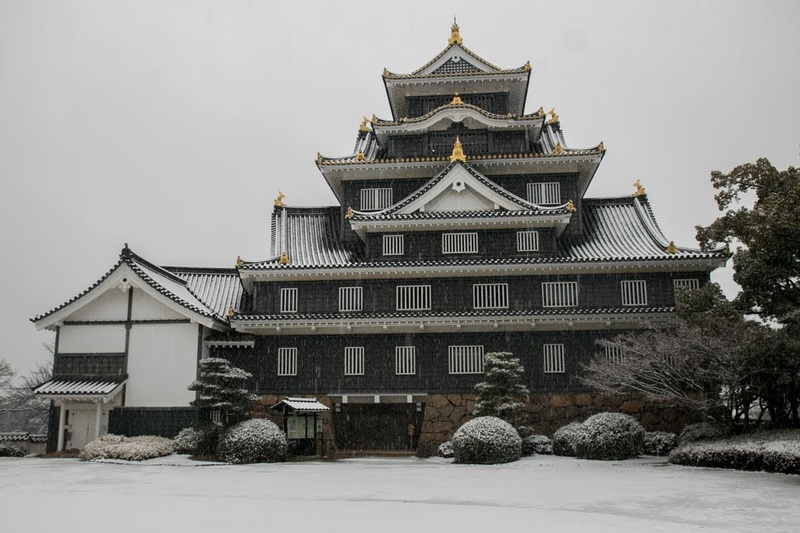 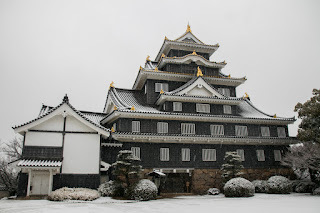 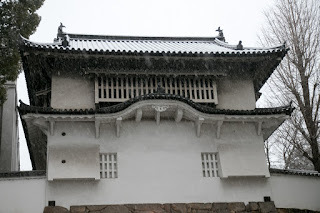 At the beginning of 16th century this Ishiyama castle was held by Kanamitsu clan, who was the retainer of Matsuda clan, a strong local lord of Bizen country (southern part of Okayama prefecture). 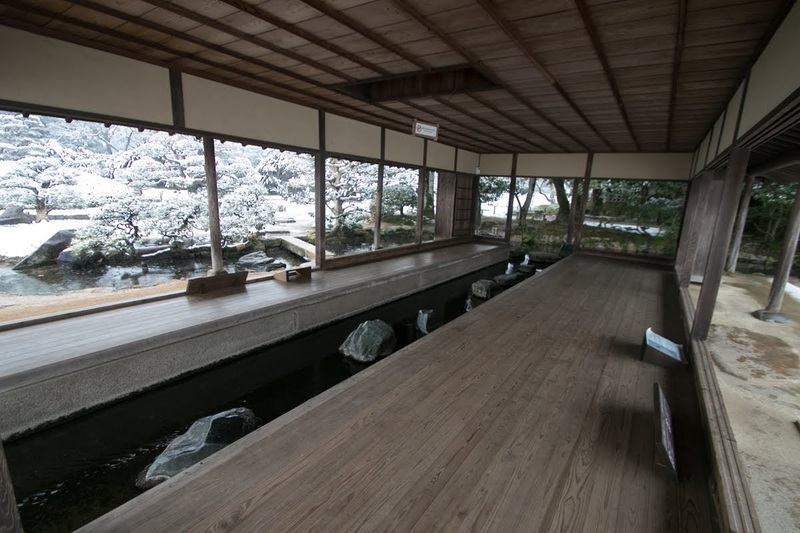 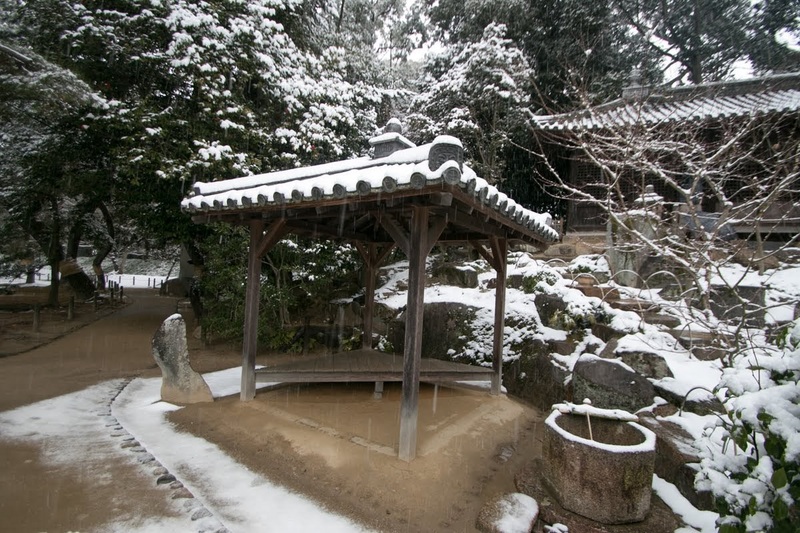 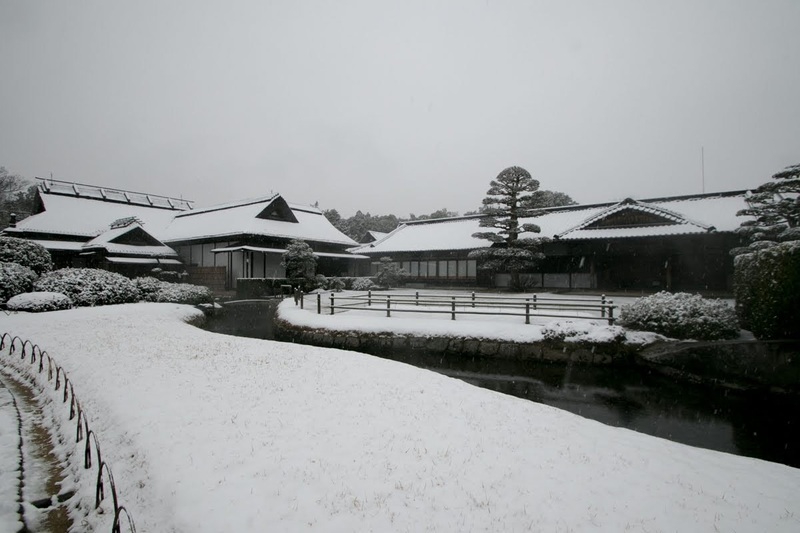 At the beginning of 16th century, the governor of Bizen country was Akamatsu clan. 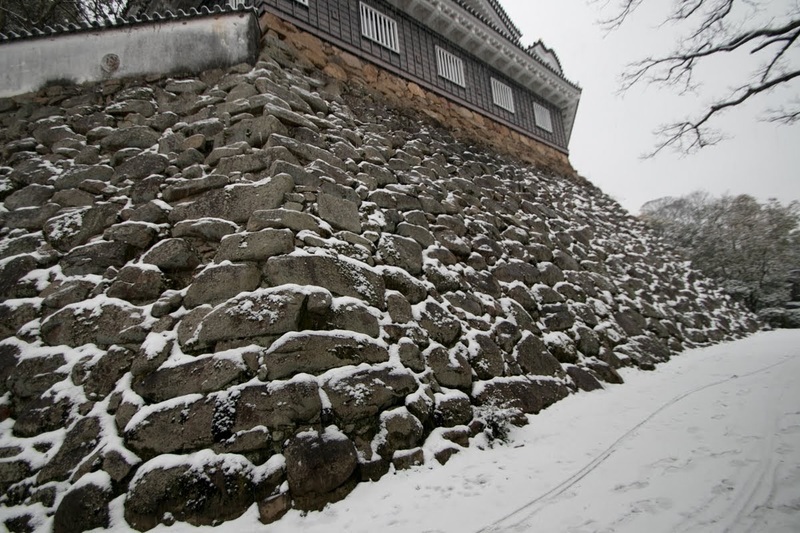 But Uragami clan, the deputy governor of Bizen country, gradually expanded their power and seek independence from Akamatsu clan. Akamatsu clan and Uragami clan fiercly struggled, but around 1520 Uragami clan defeated Akamatsu clan and substantially seized Bizen country, Mimasaka province (north part of Okayama prefecture). Uragami clan built Tenjinyama castle (Okayama prefecture) near the east border of Bizen province, and aimed at expansion into Harima province (Hyogo prefecture). 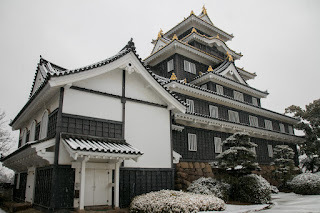 At the same time, Matsuda clan still resisted to Uragami clan, thus Uragami clan let their important retainer Ukita clan to attack Matsuda clan. The origin of Ukita clan is unknown, but since 15th century Ukita clan served to Uragami clan and resided at the east end of Okayama plain. Yoshiie Ukita (?-1534) was an excellent general and activated at many battles, but in 1534 Yoshiie was suddenly assaulted by Shimamura clan, another retainer of Uragami clan and suicided. 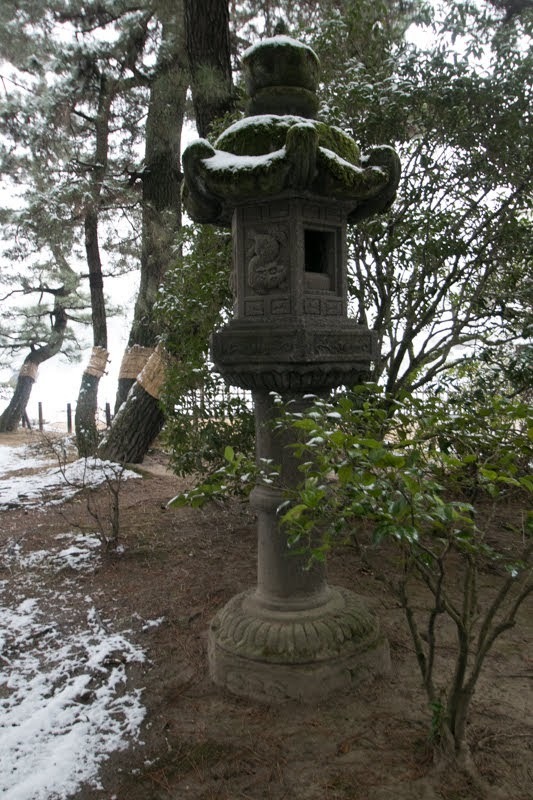 His son Okiie Ukita (?-?) 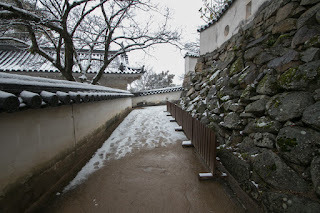 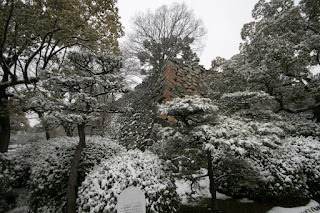 and grandson Naoie Ukita (1529-1582) left the castle and seek the chance of recovery. 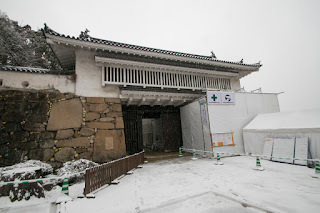 After growing up, Naoie served to Munekage Uragami (?-? ), the leader of Uragami clan. Under the order of Uragami clan, Naoie defeated many strong powers such as Nobumasa Nakayama (1510-1559) who had Numa castle, Motokata Matsuda (?-1568) at Kanagawa castle and Munetaka Kanamitsu (?-1570) at Ishiyama clan, and grew his territory. 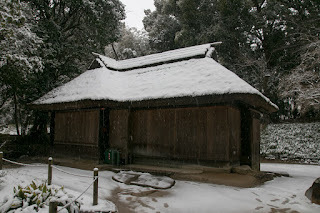 But Naoie’s method was sly, as Nobumasa was his father in law and Motokata was husband of his daughter. Further in 1566, Naoie assassinated Iechika Mimura (1517-1566), a warlord of Bicchu country (western part of Okayama prefecture) who advanced into Mimasaka country by matchlock gun. 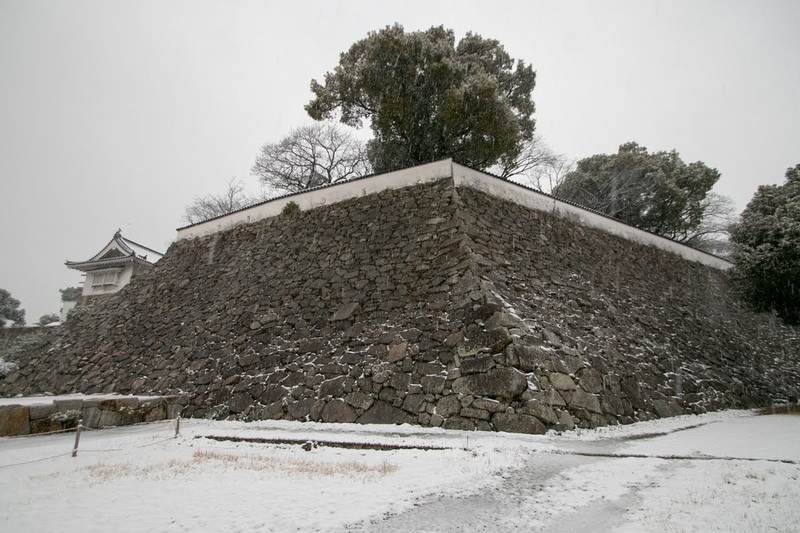 Once became the largest retainer of Uragami clan, Naomasa next attempted to beat Uragami clan itself. 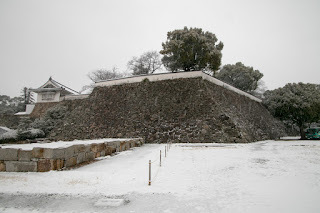 In 1569 Naoie revolted to Munekage Uragami in cooperation with central ruler Nobunaga Oda (1534-1582) and Masahide Akamatsu (?-1570), the commander of Tatsuno castle (Hyogo prefecture) but this time Naoie failed his plan and once surrendered to Munekage. 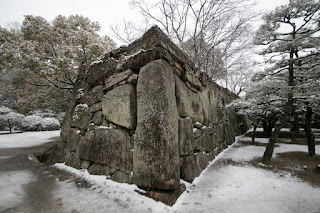 But five year later, this time Naoie allied with Mouri clan, a strong warlord of Chugoku region, and urged retainers of Uragami clan to leave the clan. This time Uragami clan belonged to Nobunaga but Nobunaga’s army were far distant from Bizen country, and support of Mouri clan was effective. Finally Munekage left Tenjinyama castle in 1575 and escaped to Harima country, then Naoie finally became the warlord of Bizen and Mimasaka country. 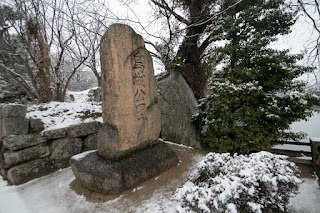 As Naoie rose up from wanderer to the warlord of two countries by his plot, he was regarded as one of three intellectually excellent warlords of Chugoku region along with Tsunehisa Amago (1458-1541), a warlord of Izumo province (Shimane prefecture) and Motonari Mouri (1497-1571), a one of Aki province (Hiroshima prefecture). 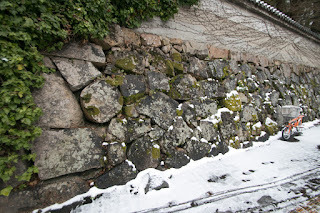 But compared with Tsunehisa’s decisiveness and Motonari’s thoughtfulness, Naoie is thought as ruthless. 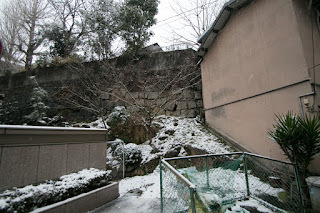 It is said that his younger brother Haruie Ukita (?-?) wore chain armor for fear of assassination when he met Naoie. But without his merciless plots Naoie could not became a powerful warlord. 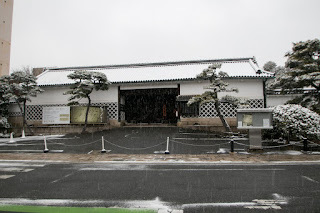 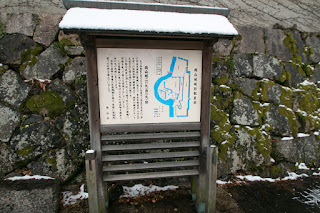 Naoie at first resided Numa castle (Okayama city) at the east end of Okayama plain, but he attempted to advance the center of Okayama plain, and expelled Kanamitsu clan. 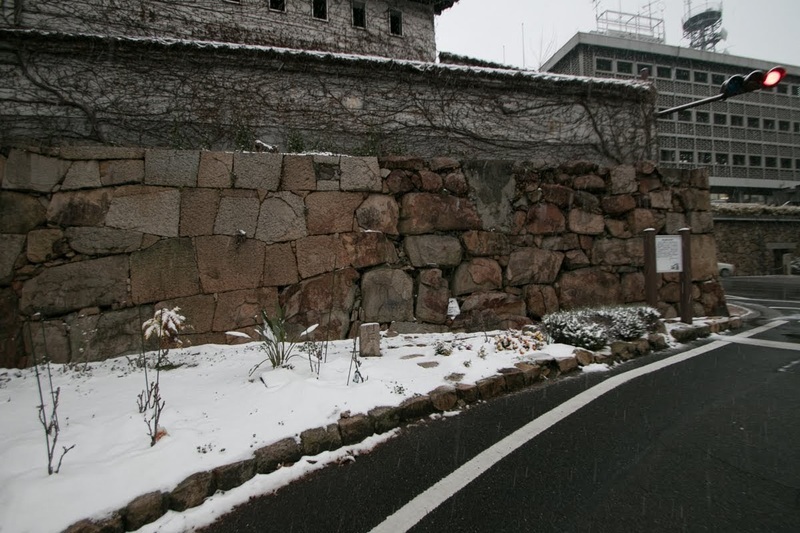 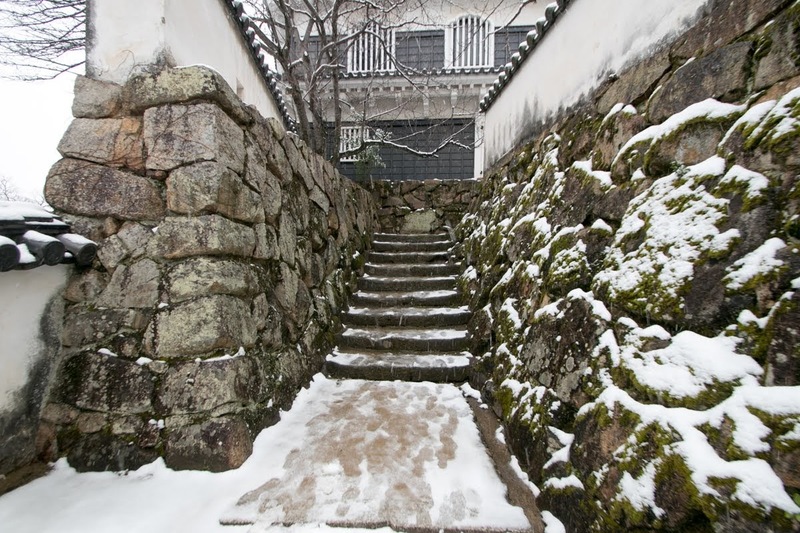 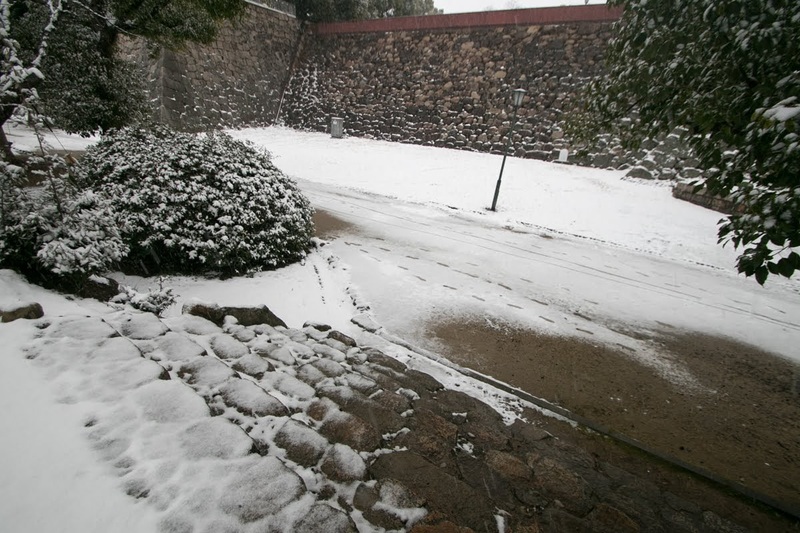 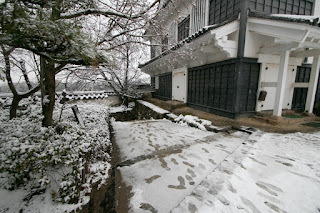 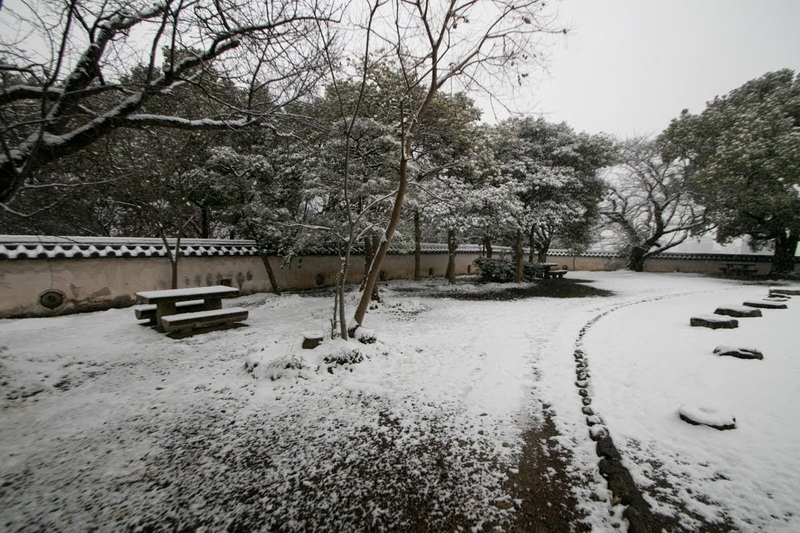 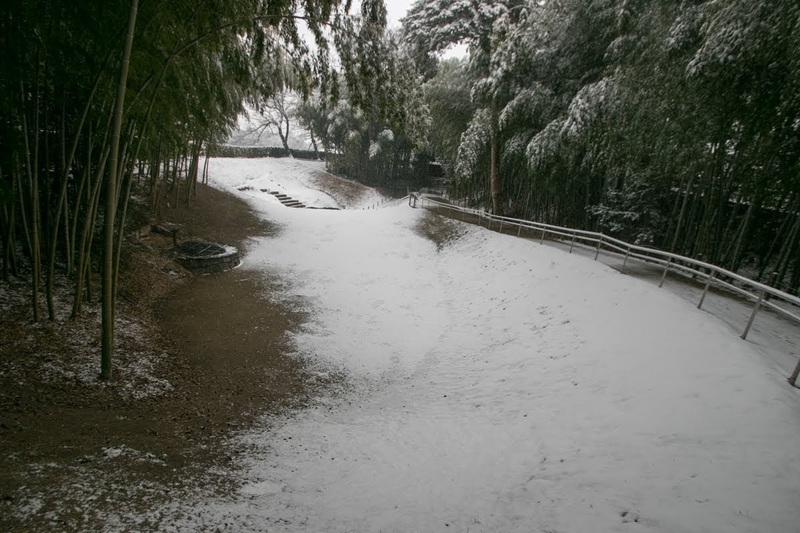 In 1573 Naoie entered Ishiyama castle and reformed it as his residence, and built the castle town. After the death of Naoie, his son Hideie Ukita (1572-1655) succeeded the leader position. Just after the death of Naoie, the incident of Honnoji has occurred, and Nobunaga killed himself in the accident. 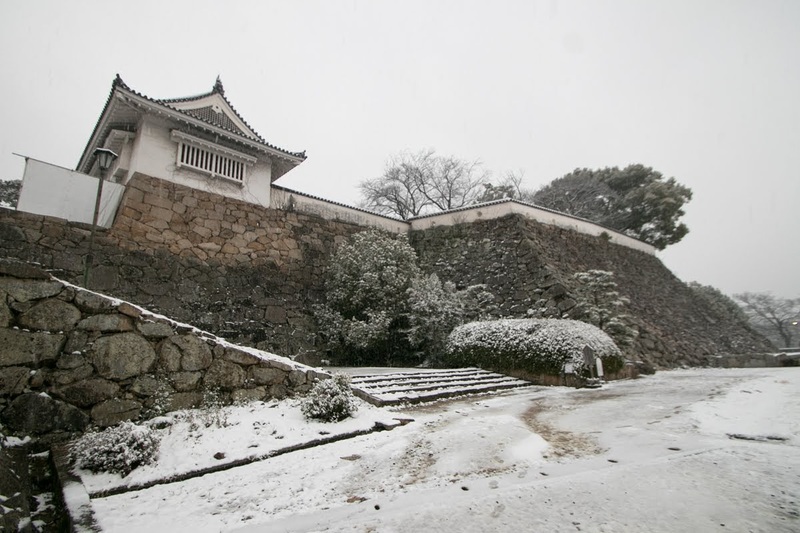 At the time of incident Hideie participated in the siege to Bicchu Takamatsu castle (Okayama prefecture) under Hideyoshi. 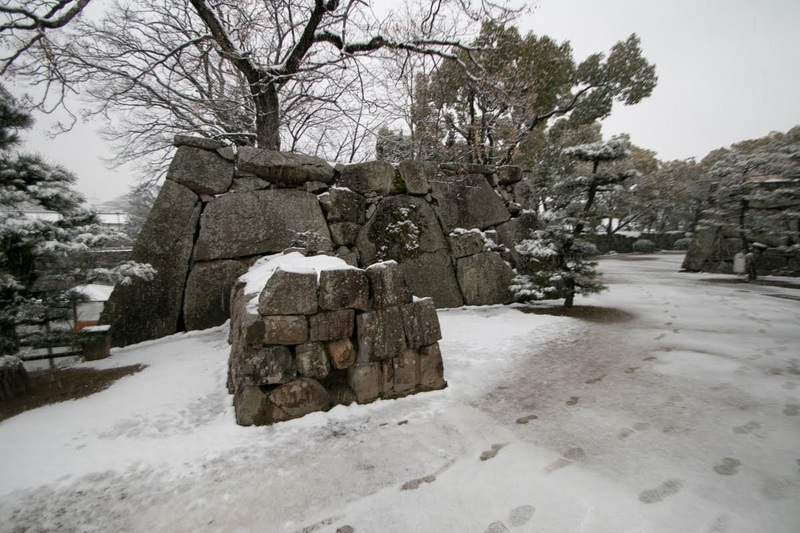 Hideyoshi quickly made peace with Mouri clan and returned to Kinki region, and made revenge of his former master and became the next ruler. 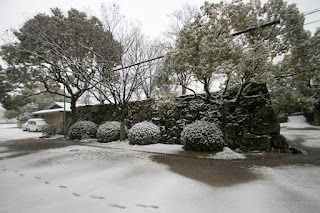 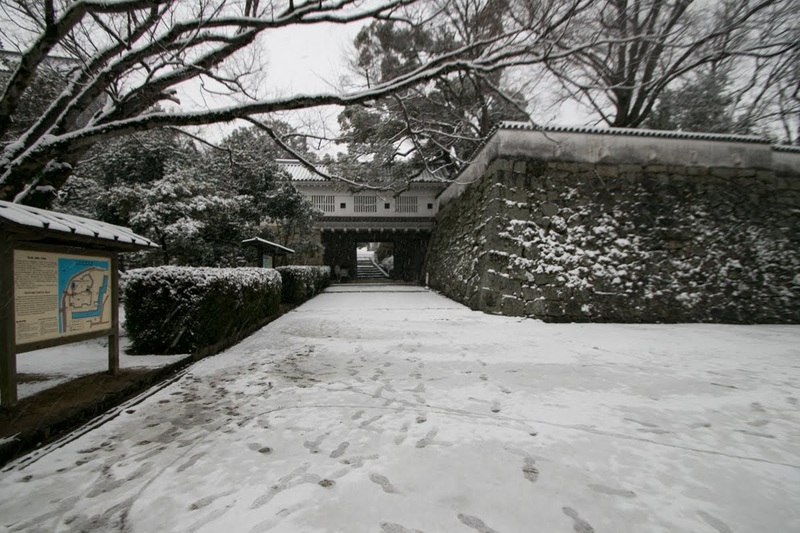 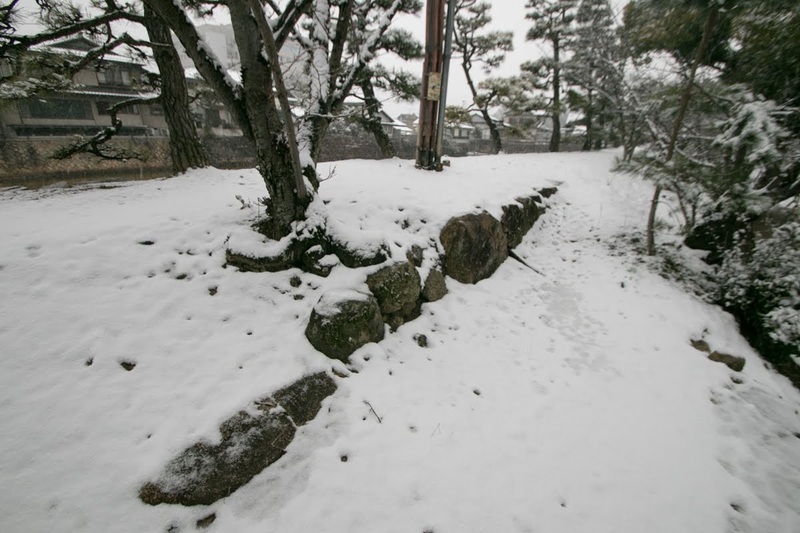 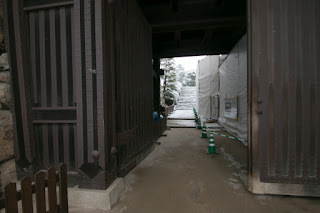 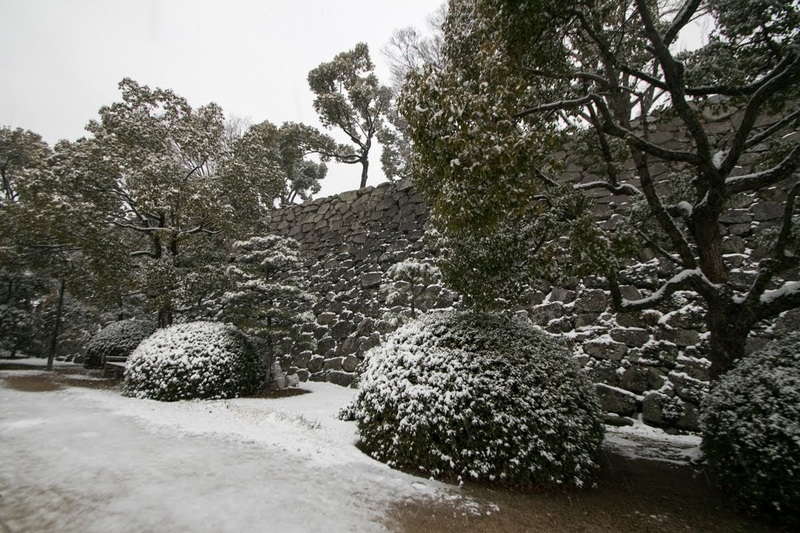 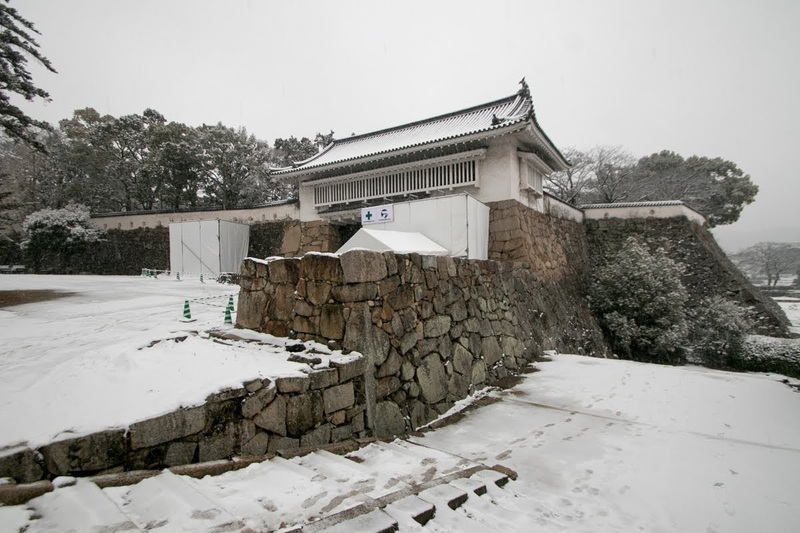 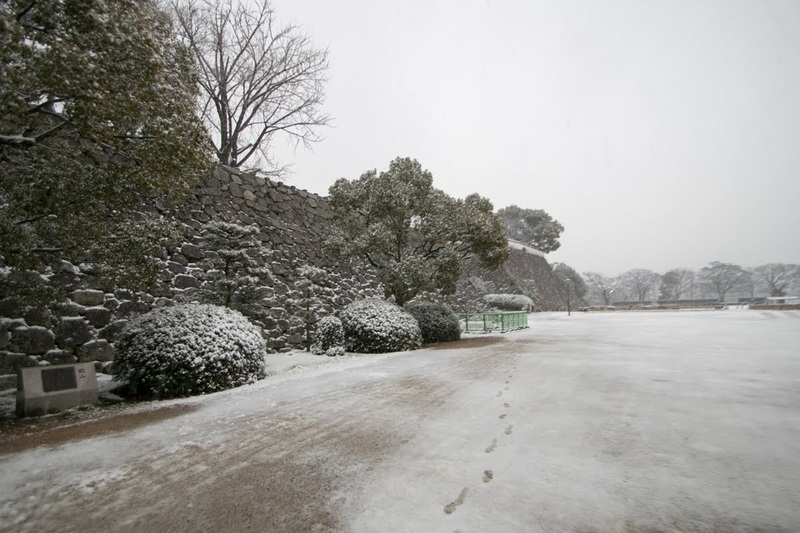 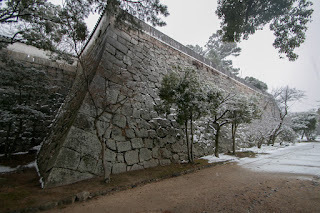 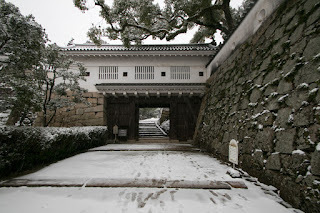 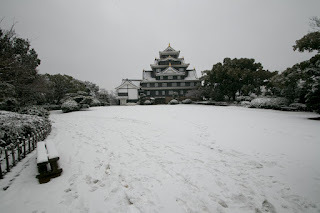 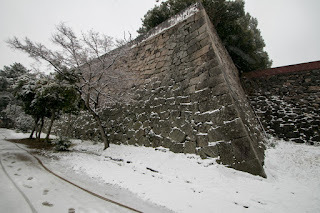 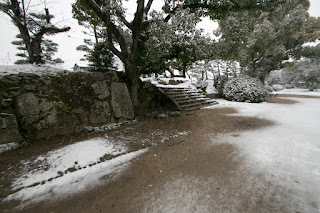 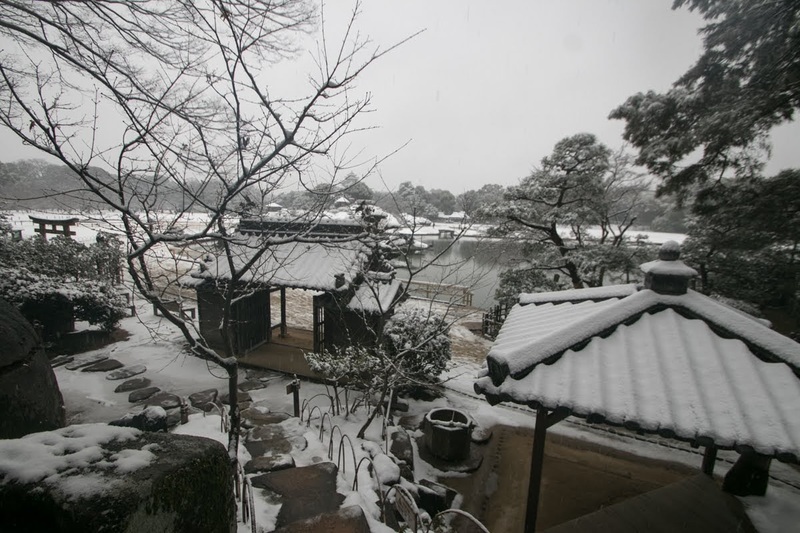 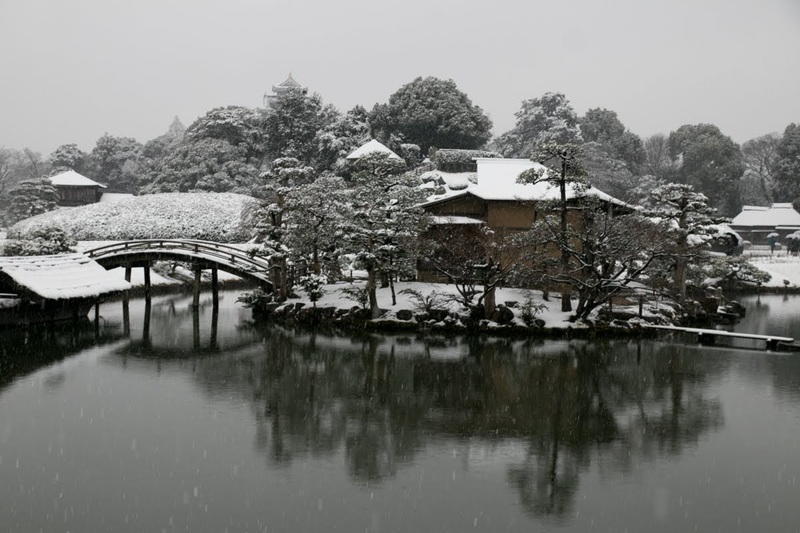 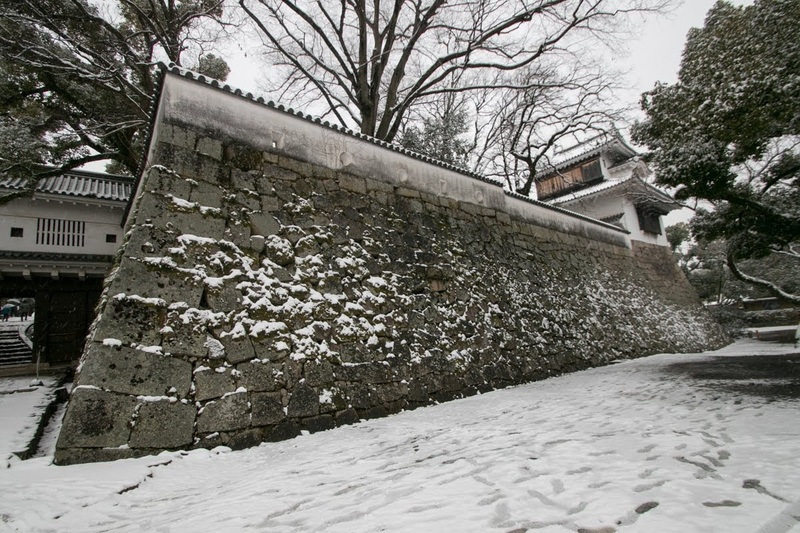 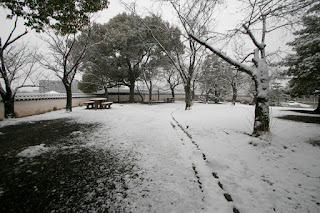 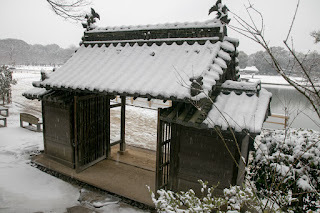 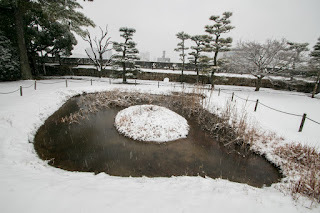 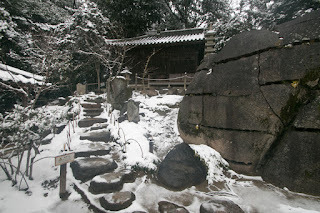 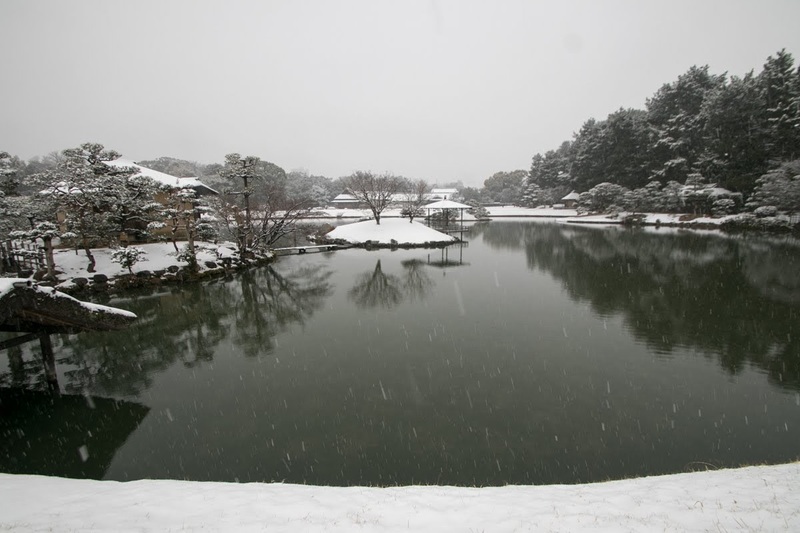 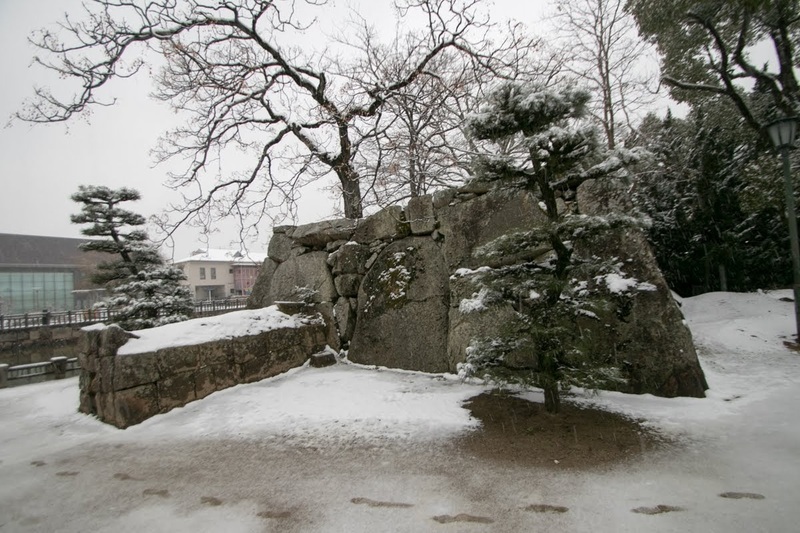 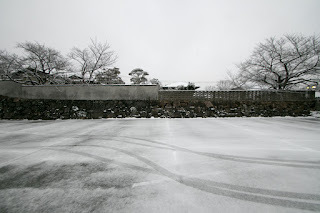 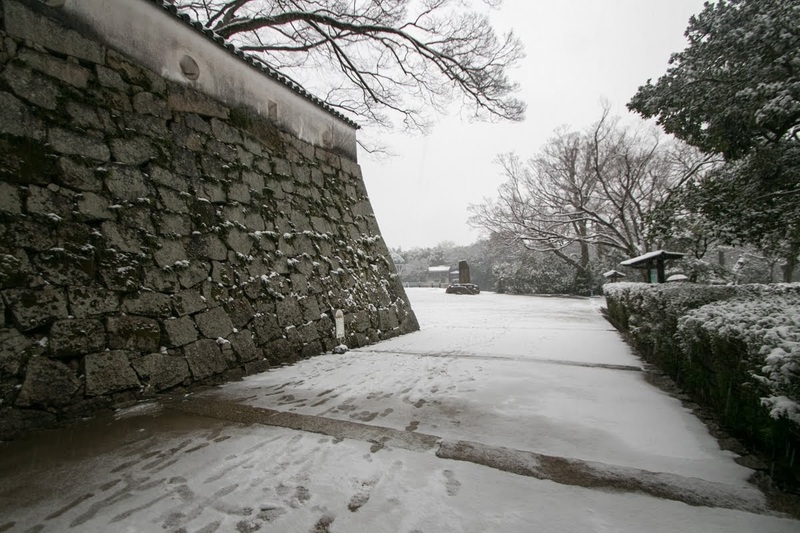 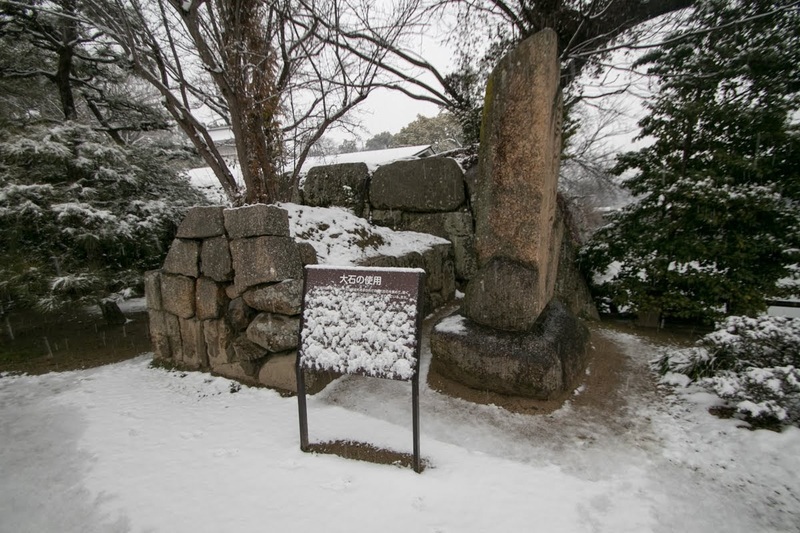 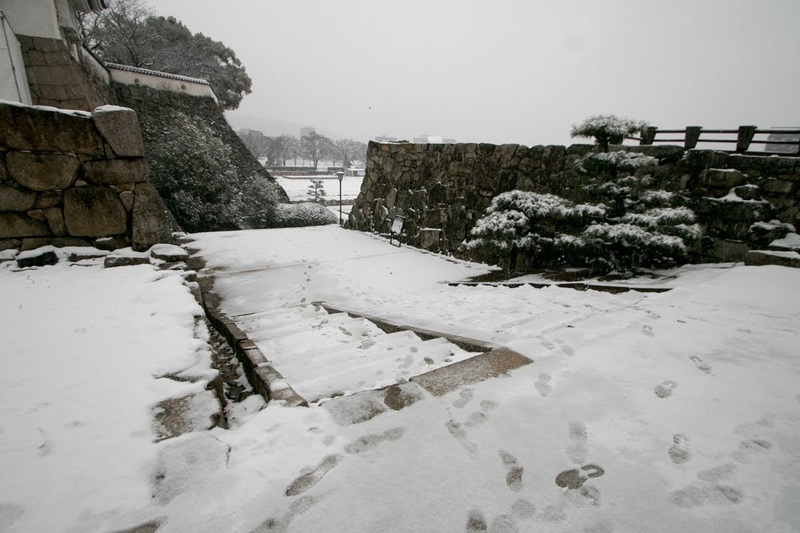 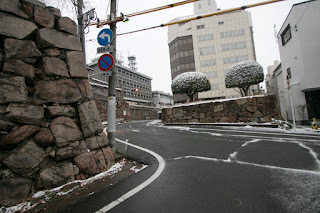 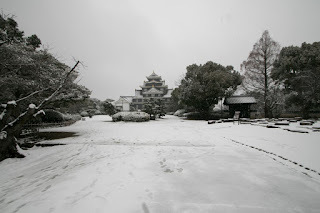 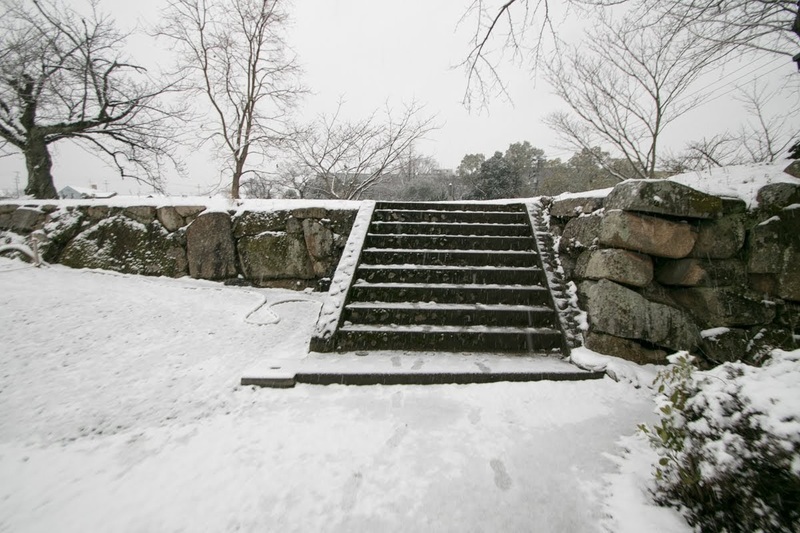 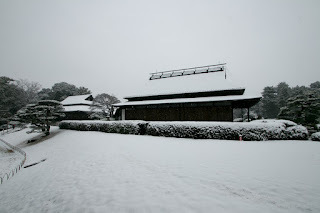 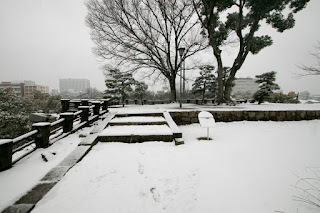 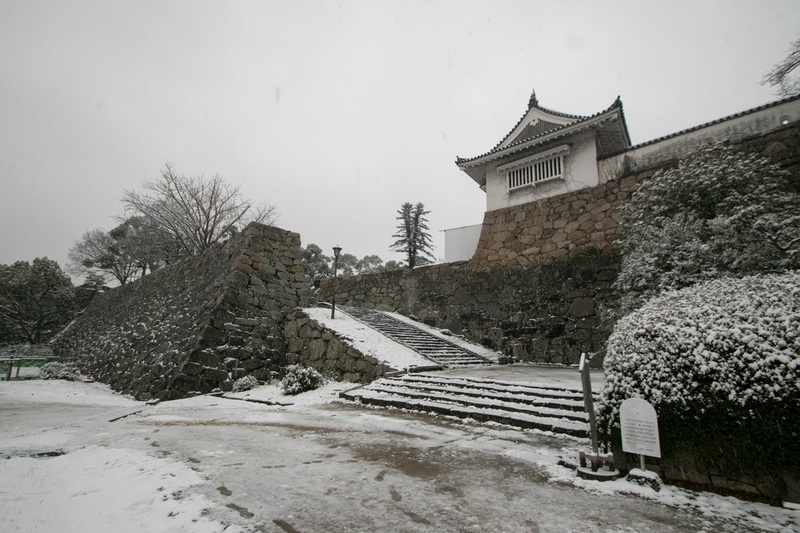 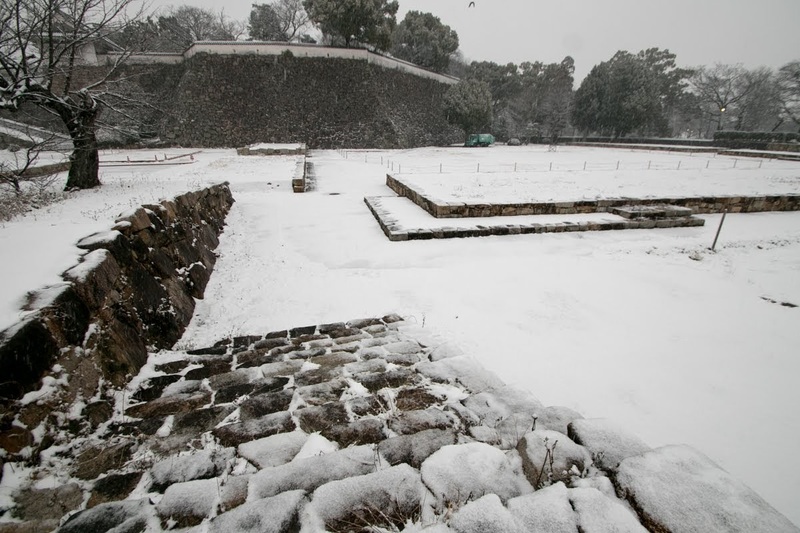 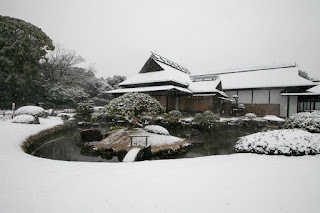 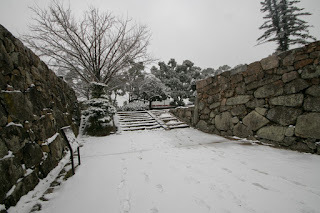 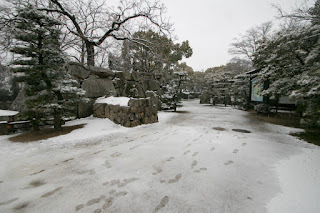 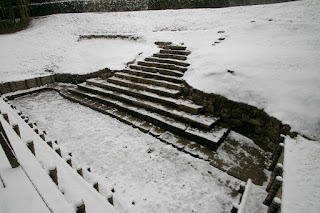 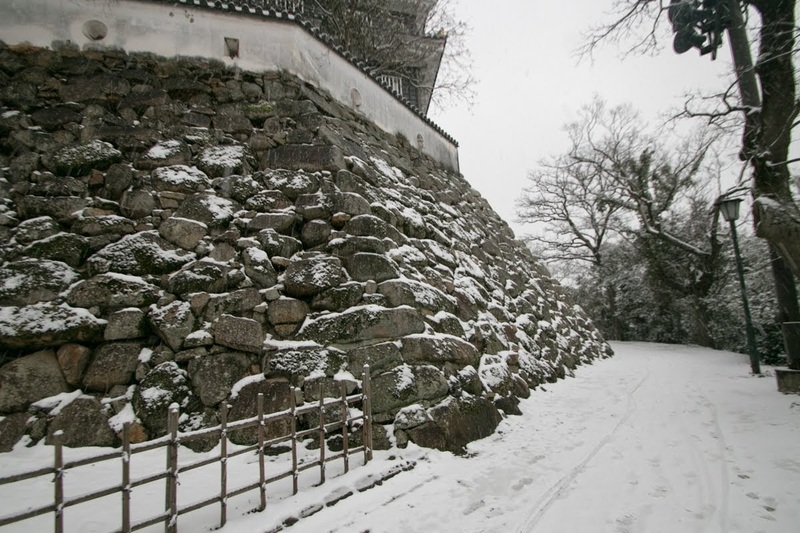 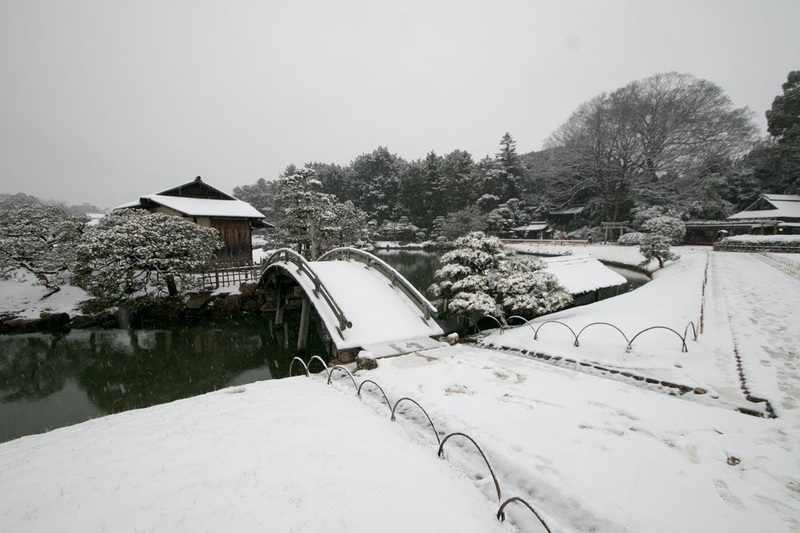 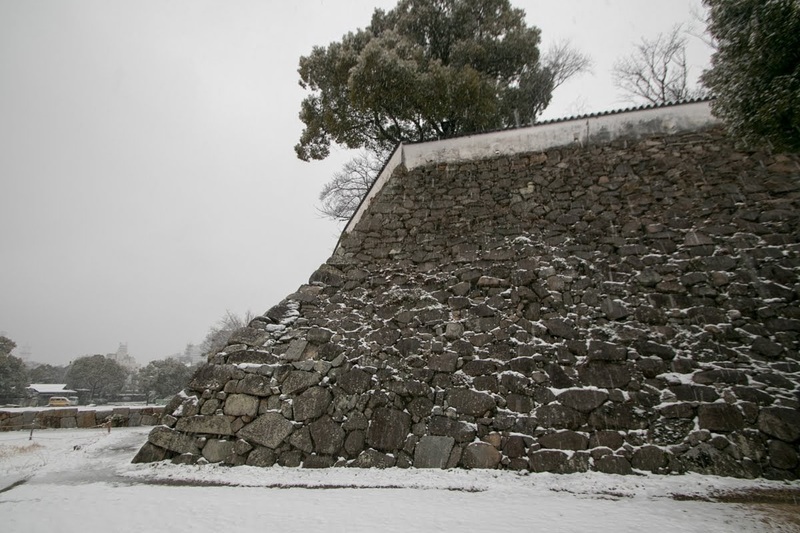 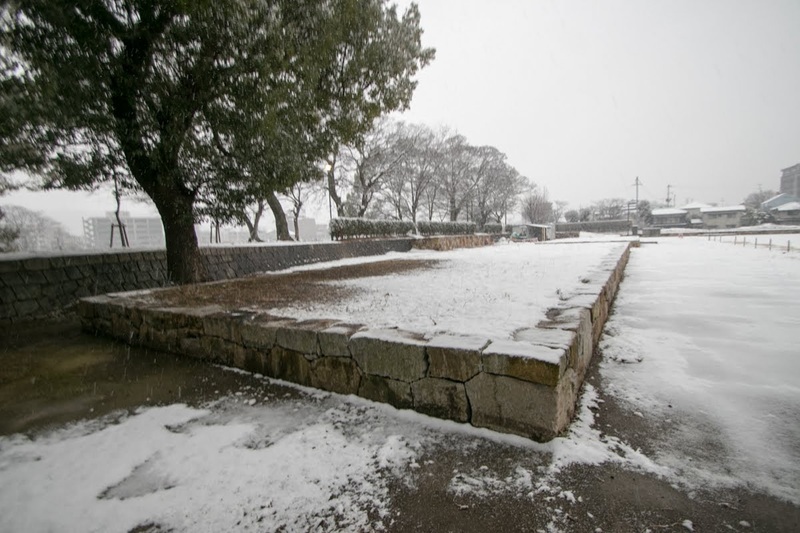 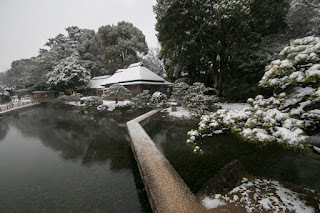 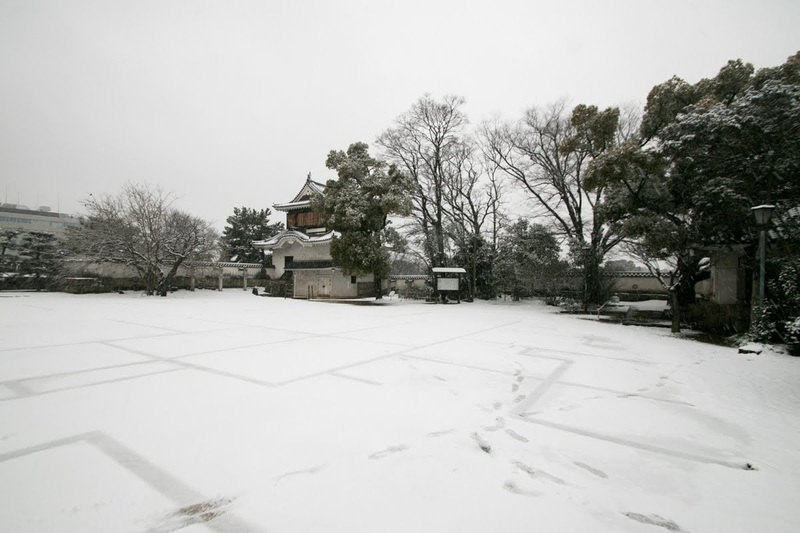 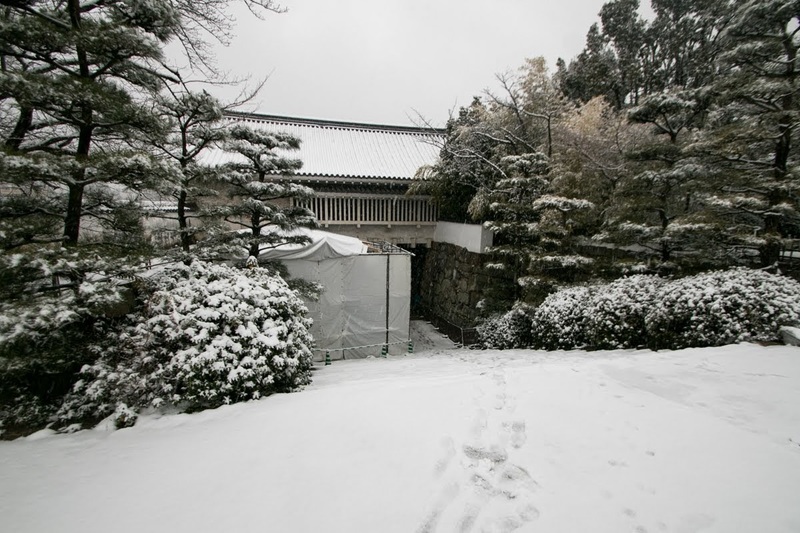 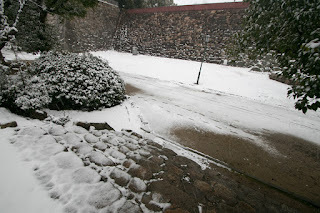 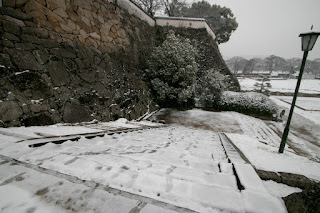 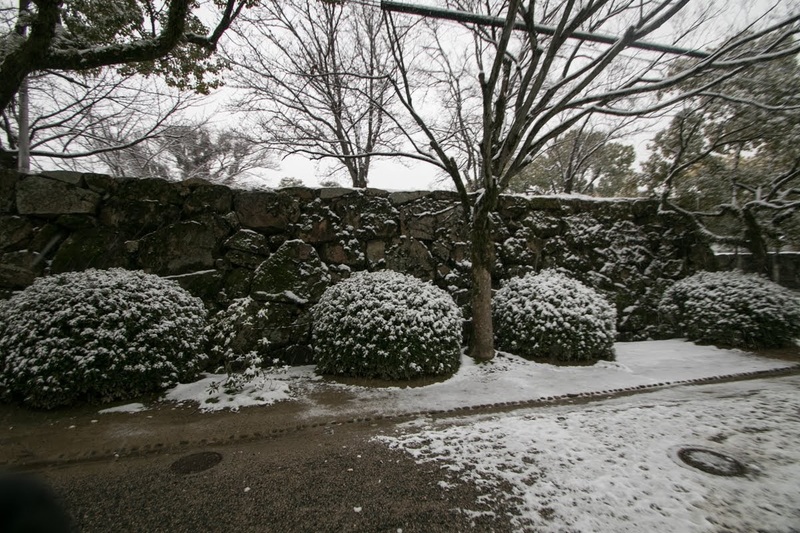 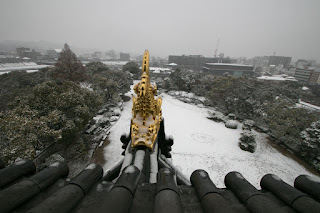 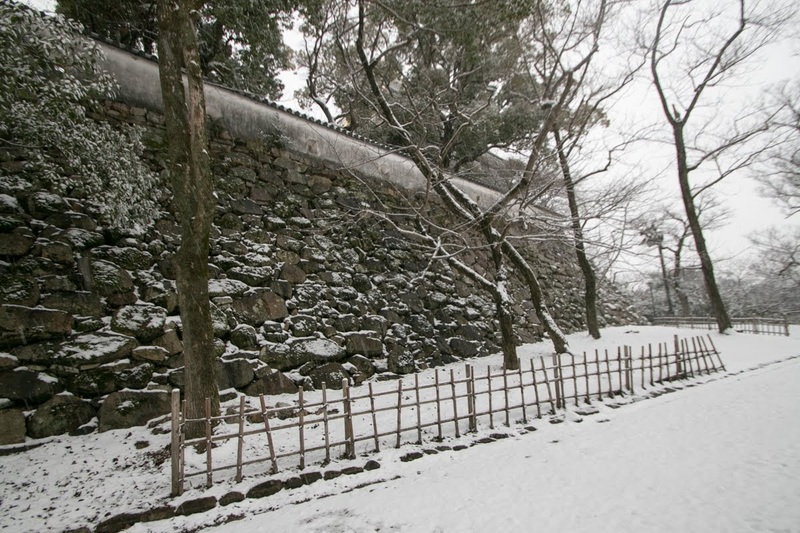 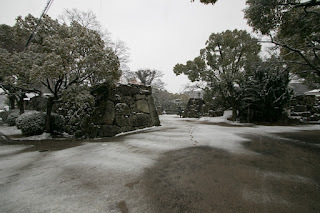 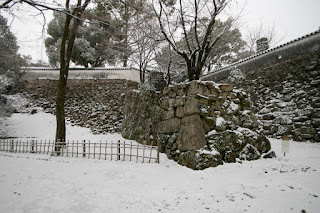 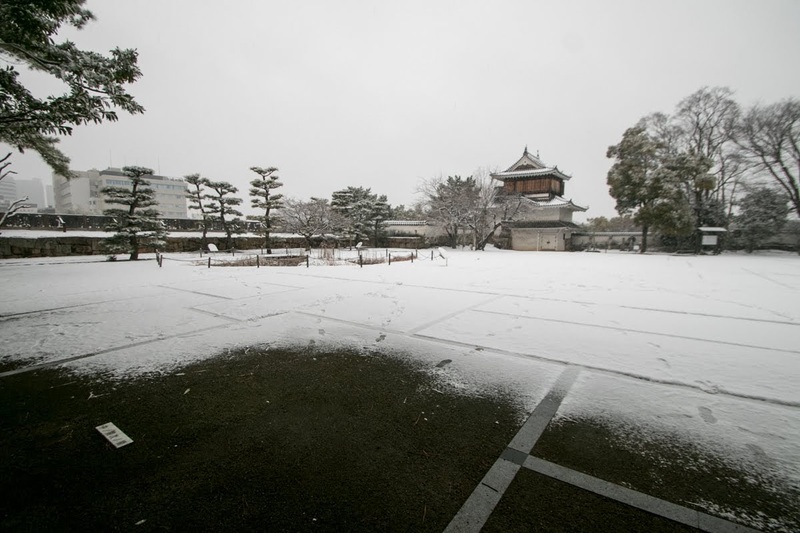 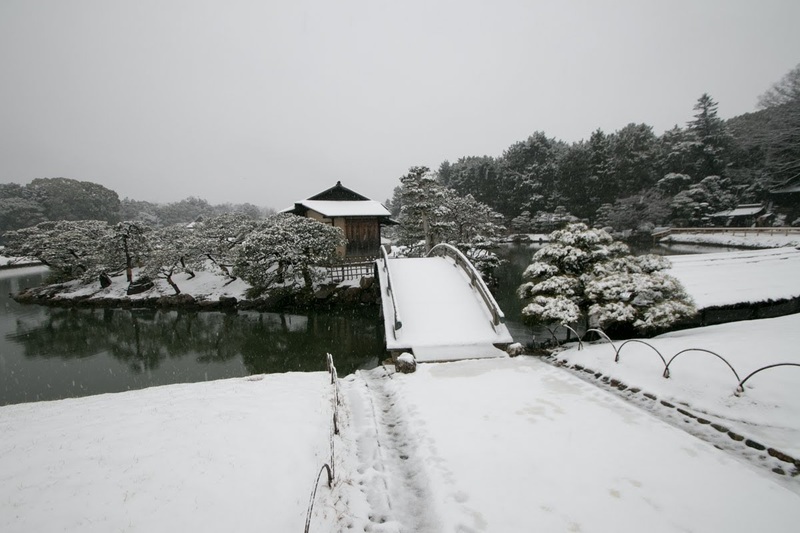 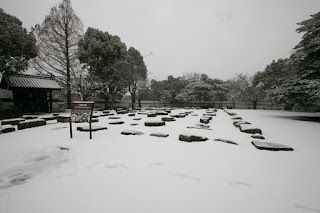 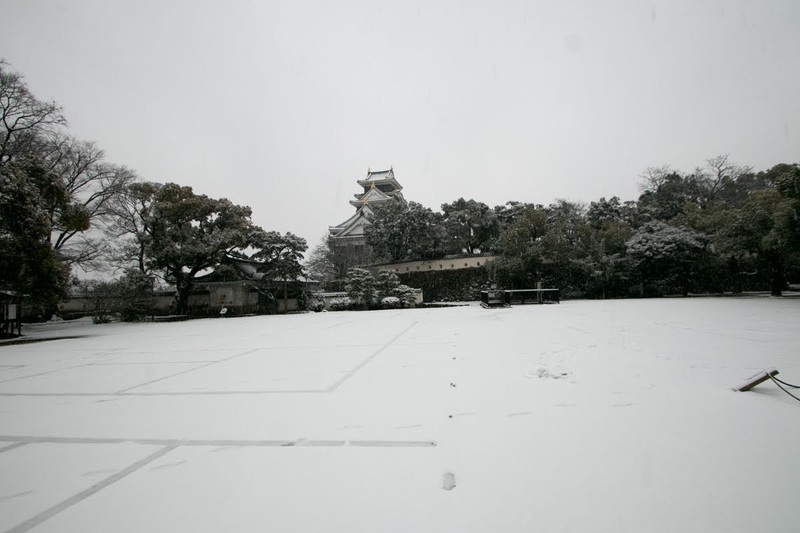 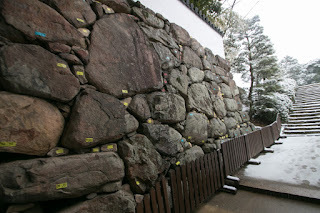 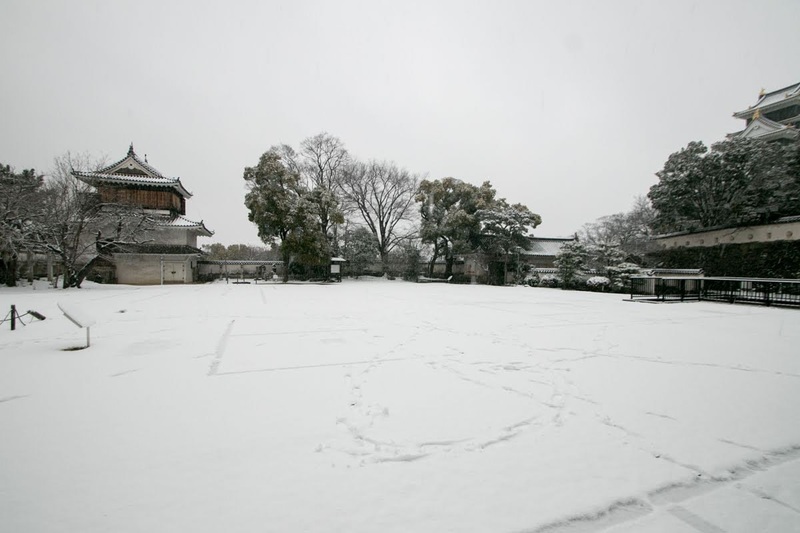 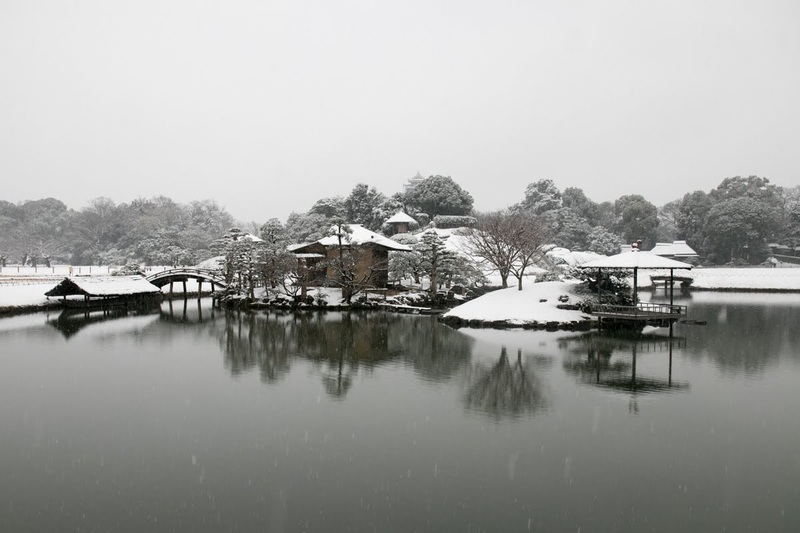 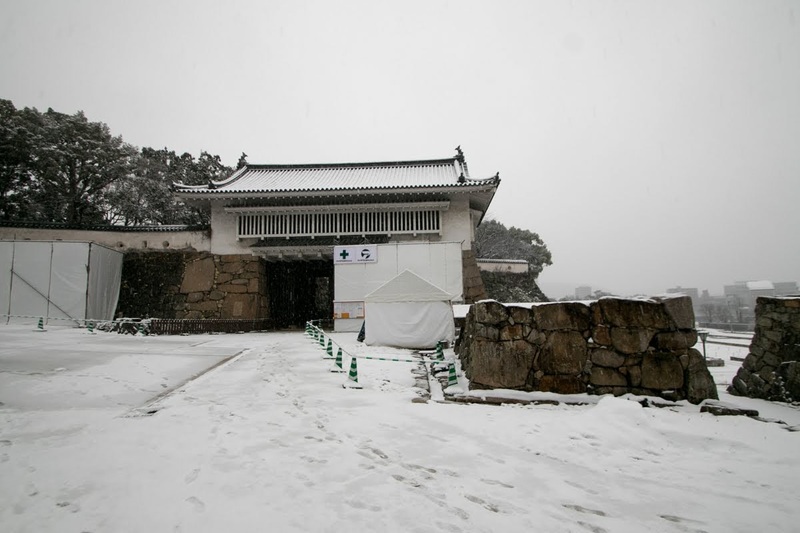 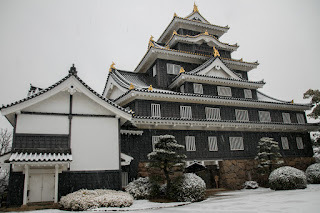 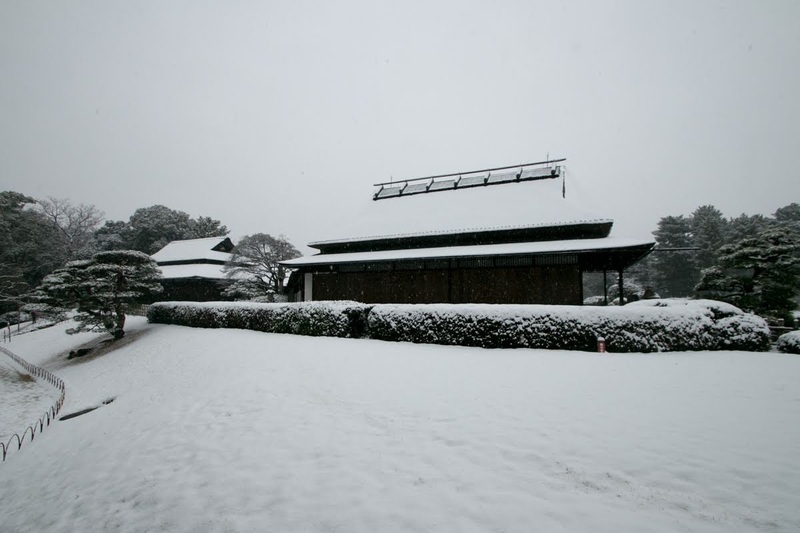 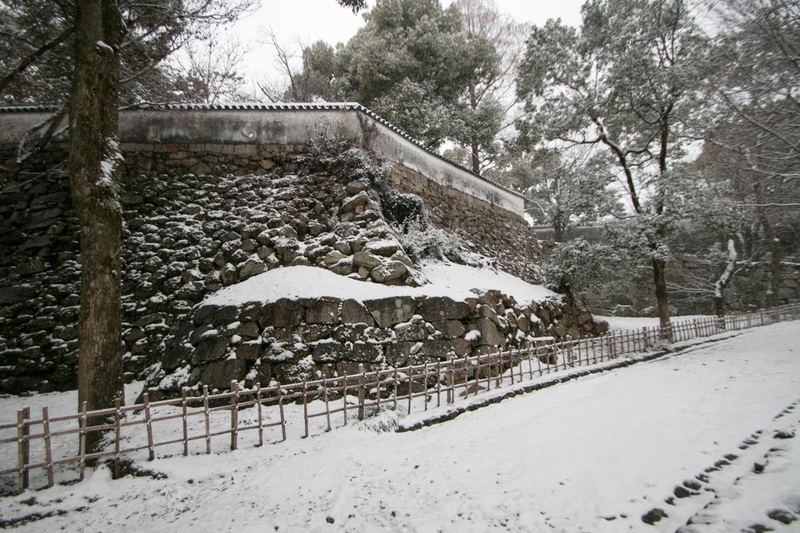 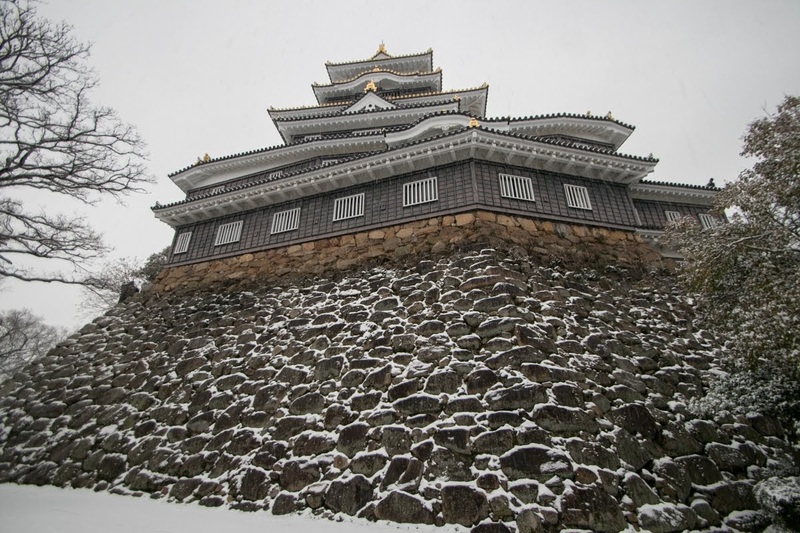 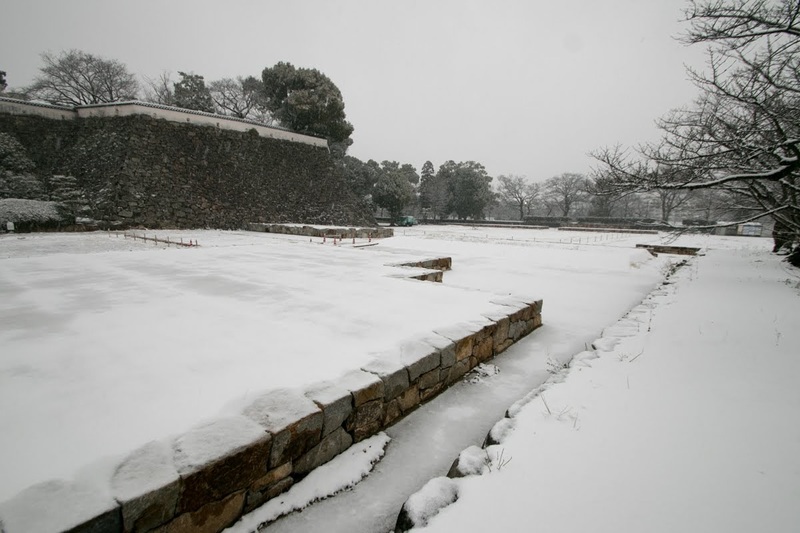 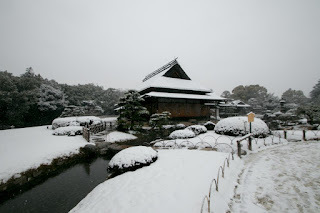 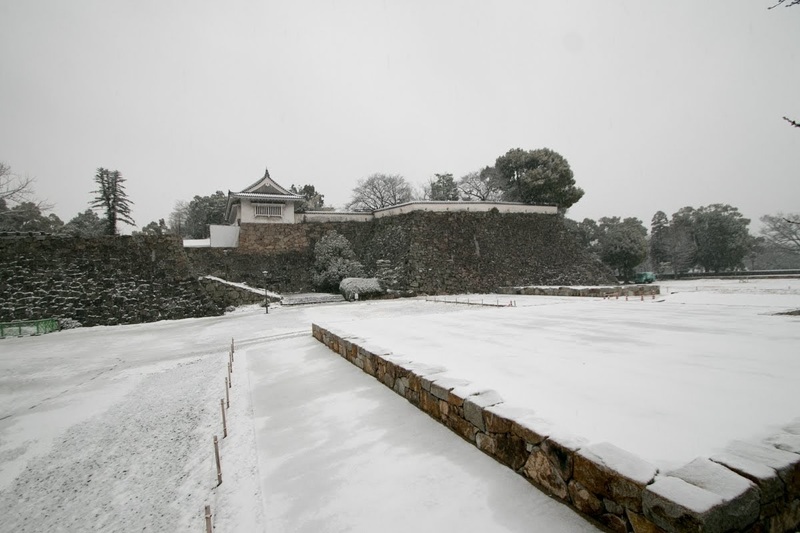 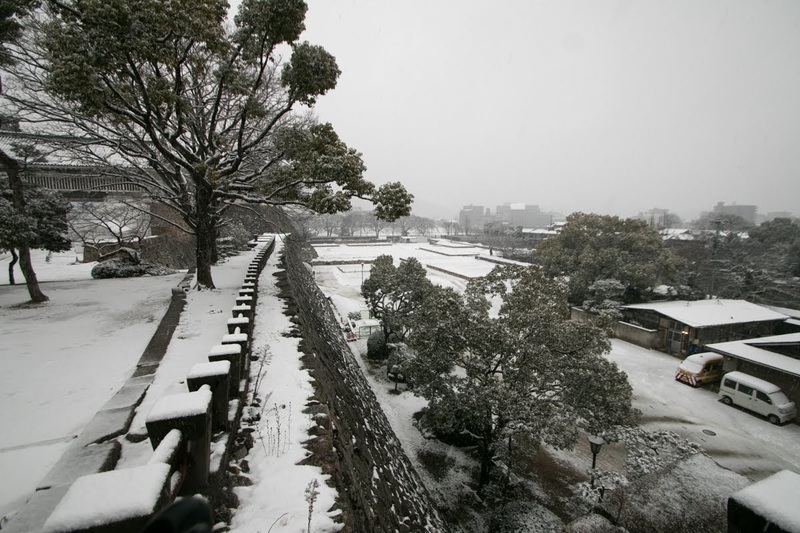 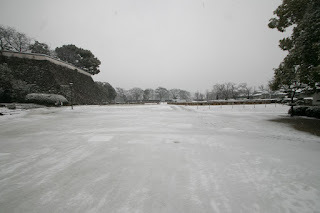 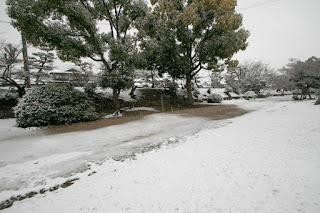 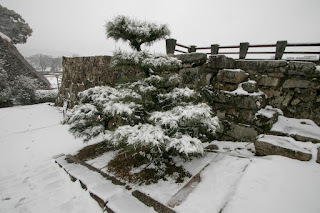 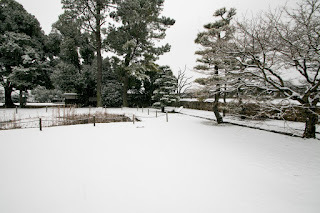 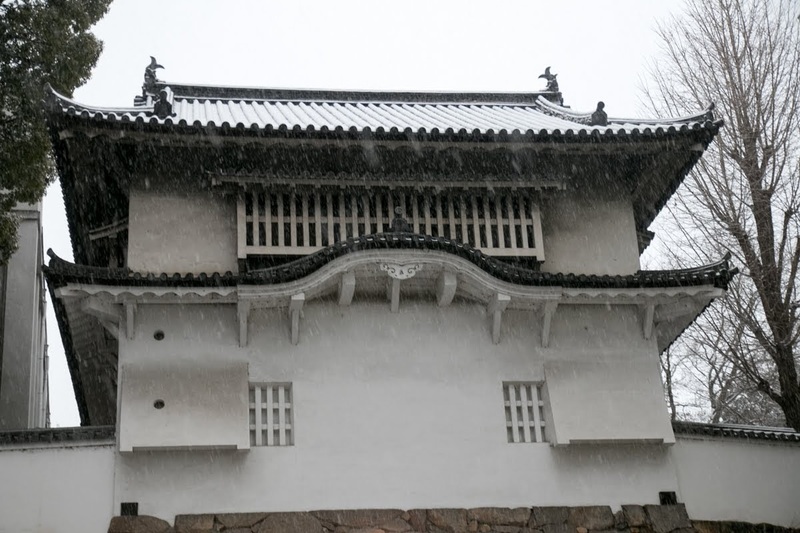 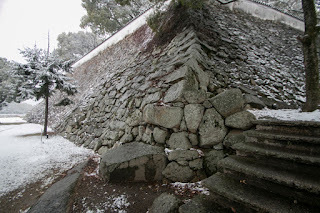 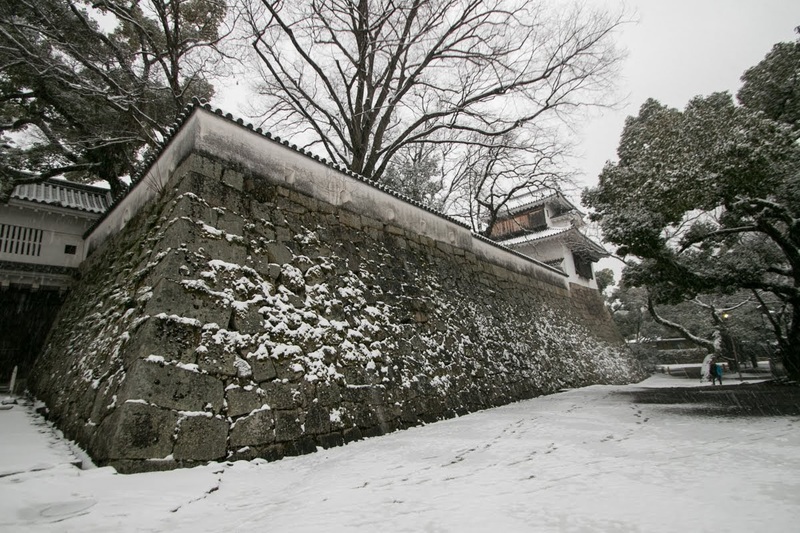 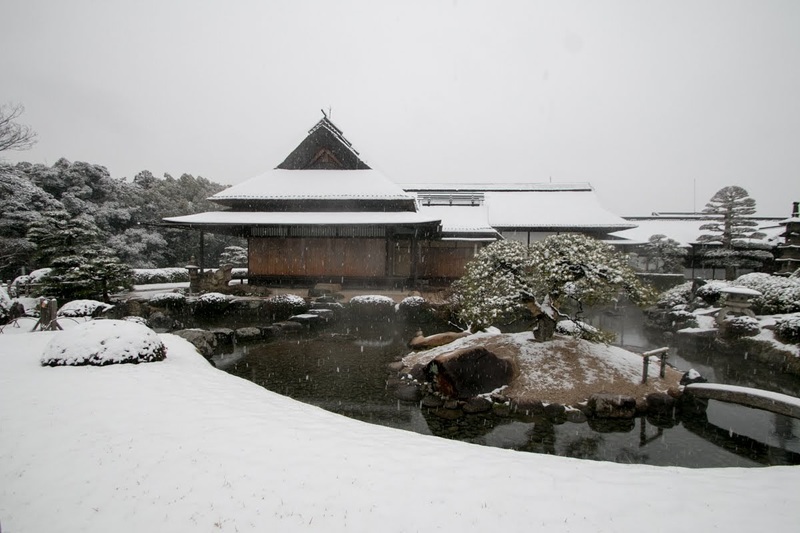 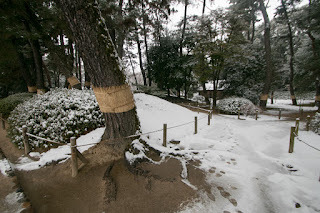 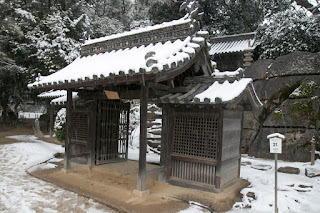 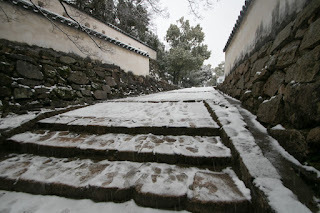 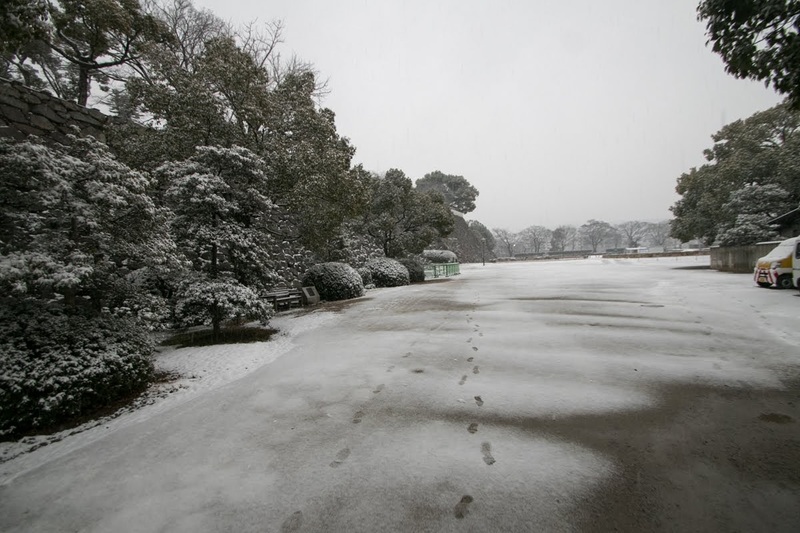 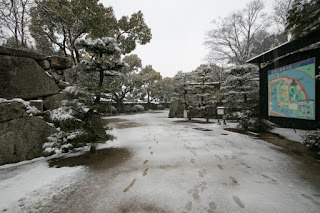 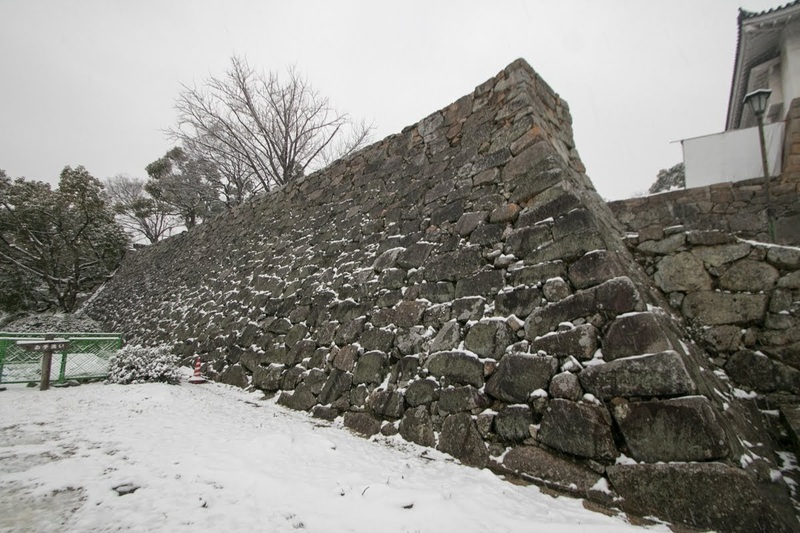 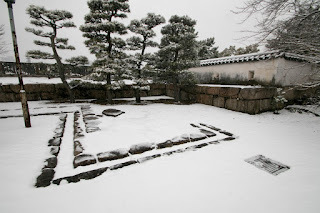 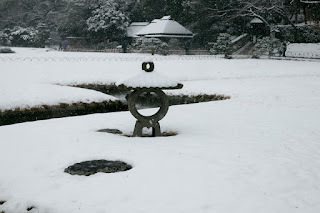 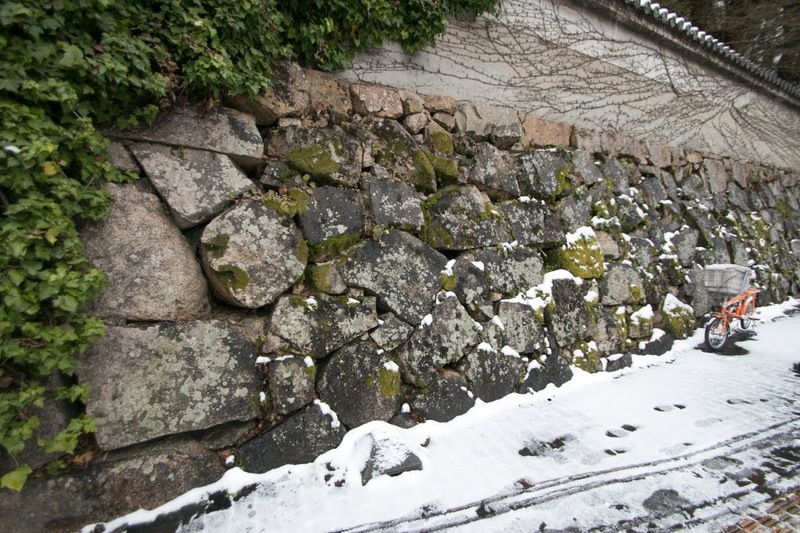 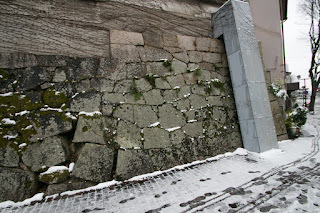 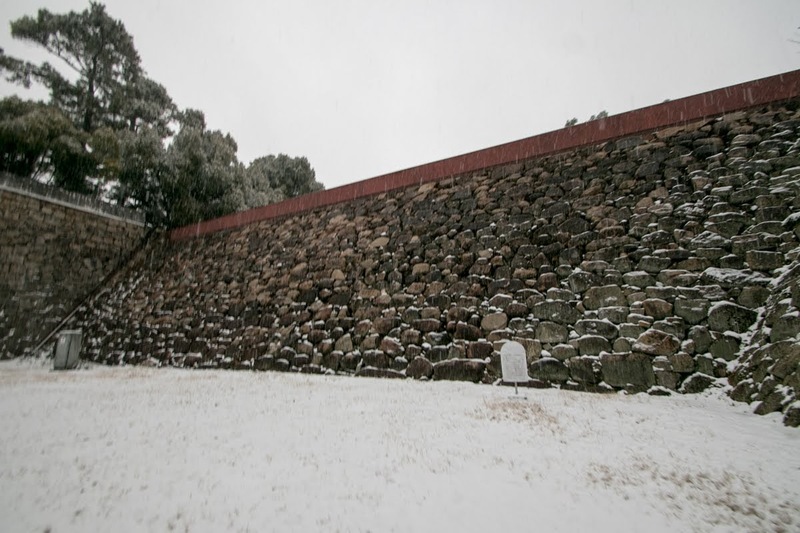 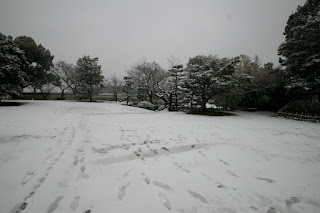 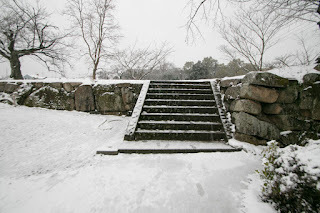 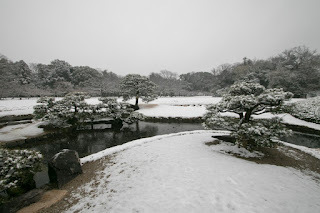 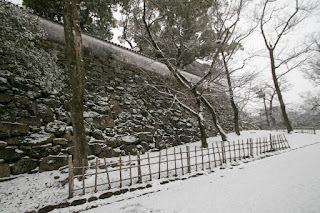 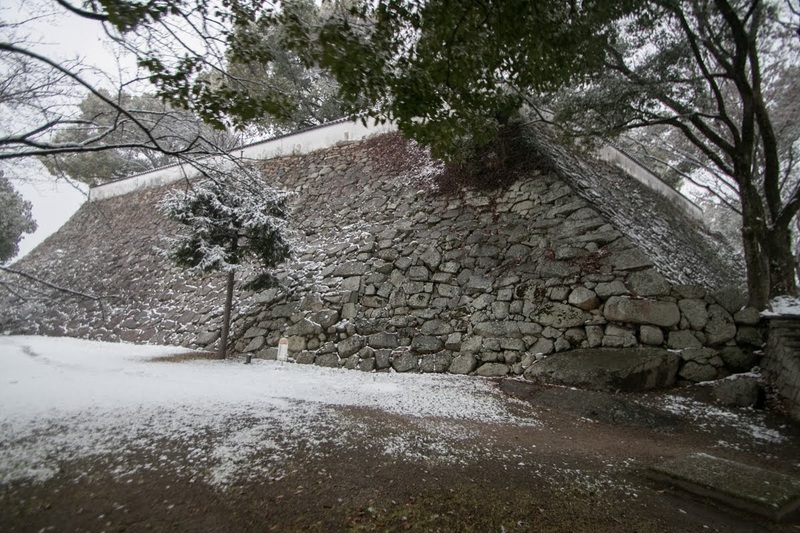 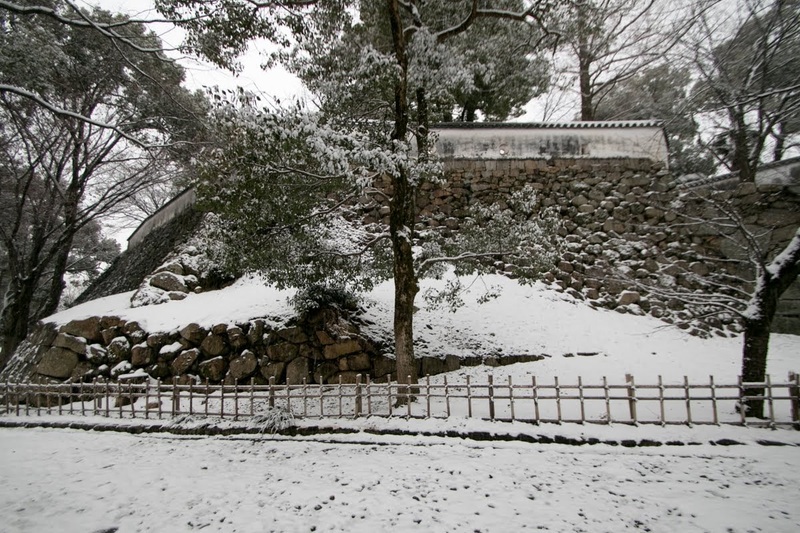 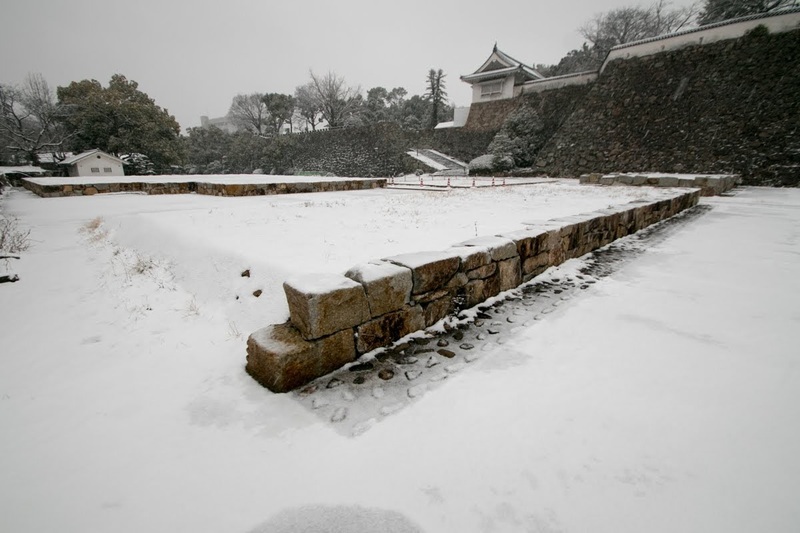 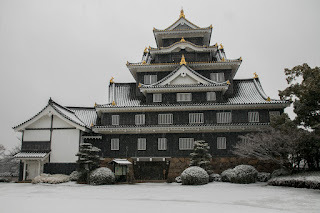 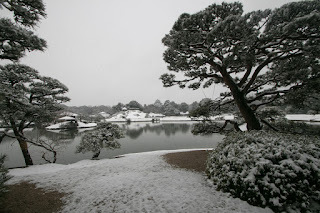 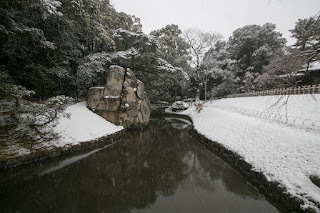 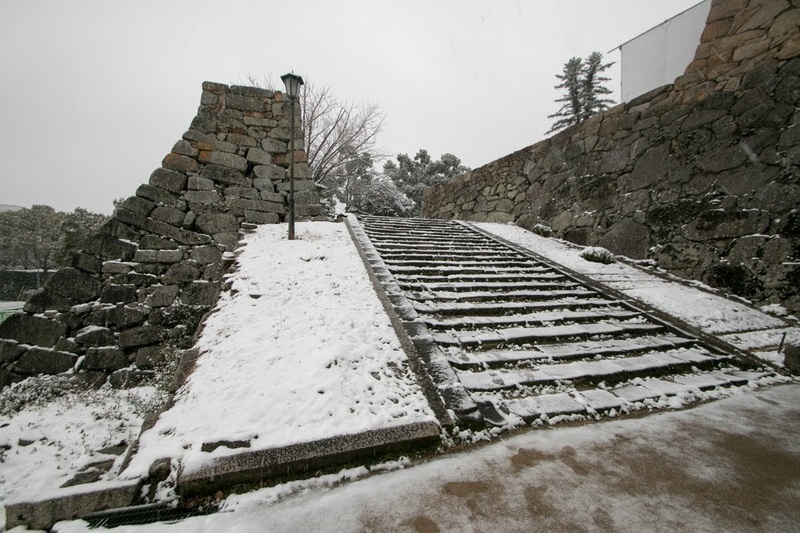 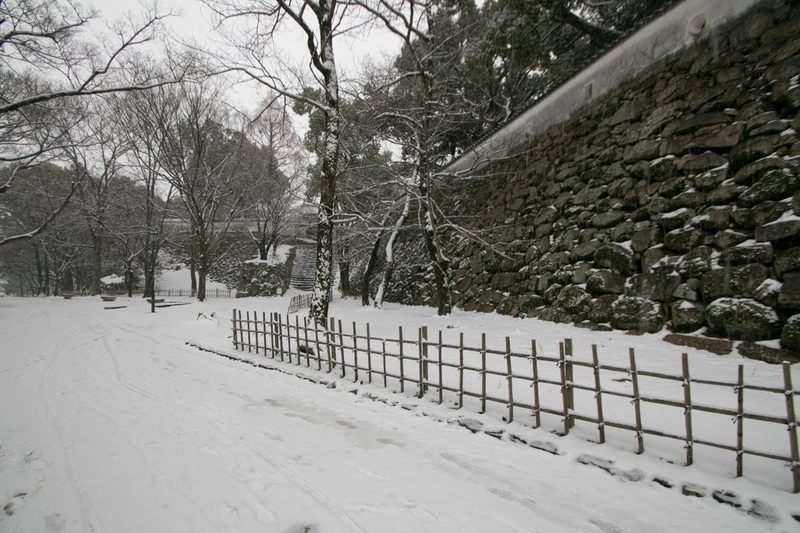 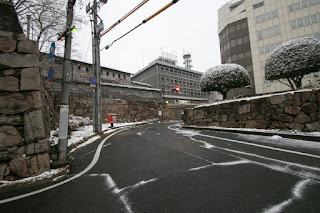 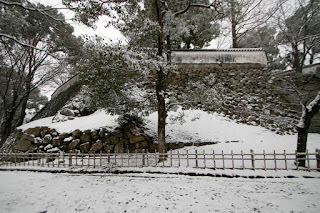 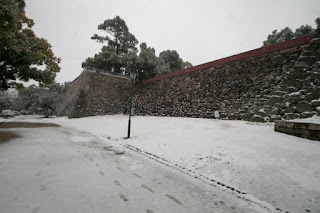 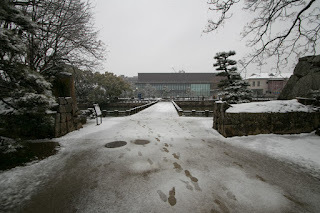 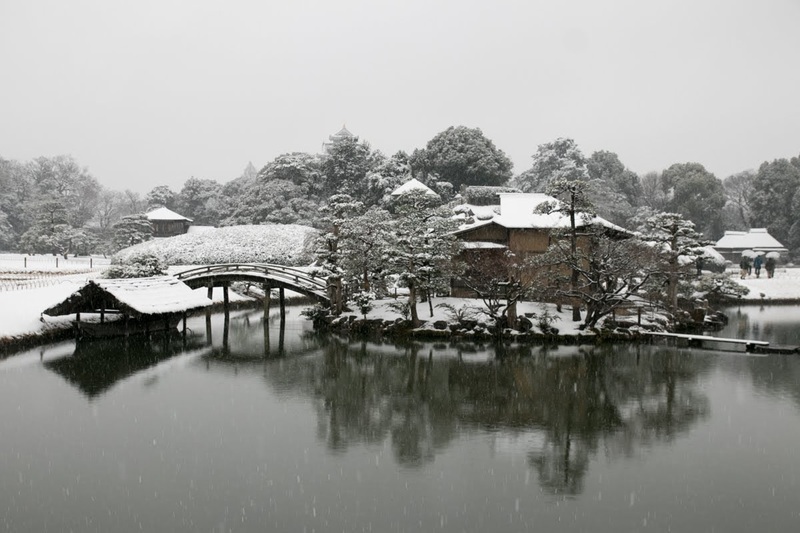 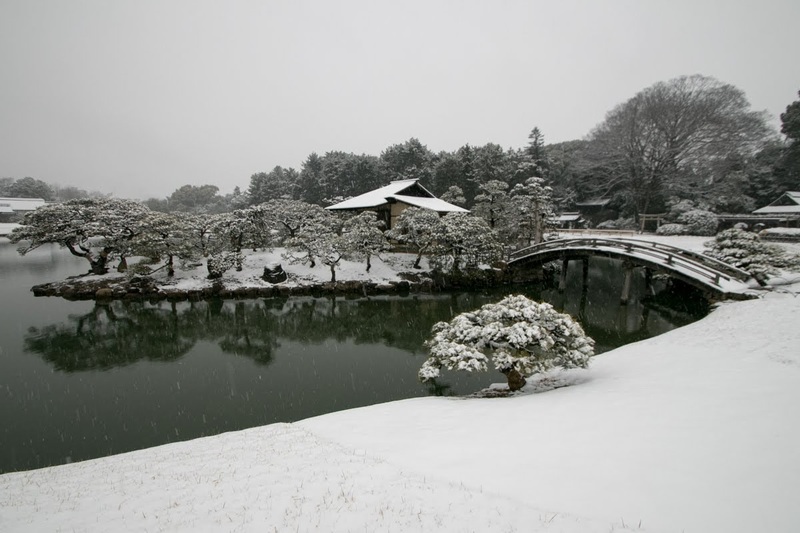 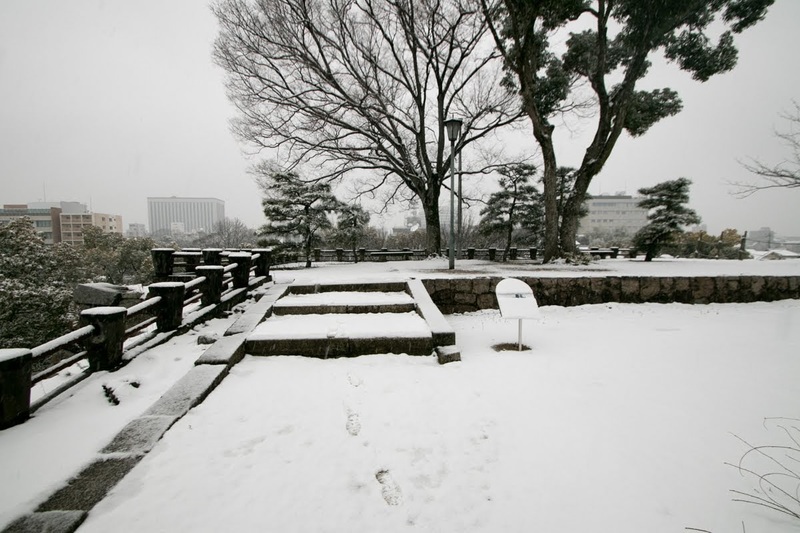 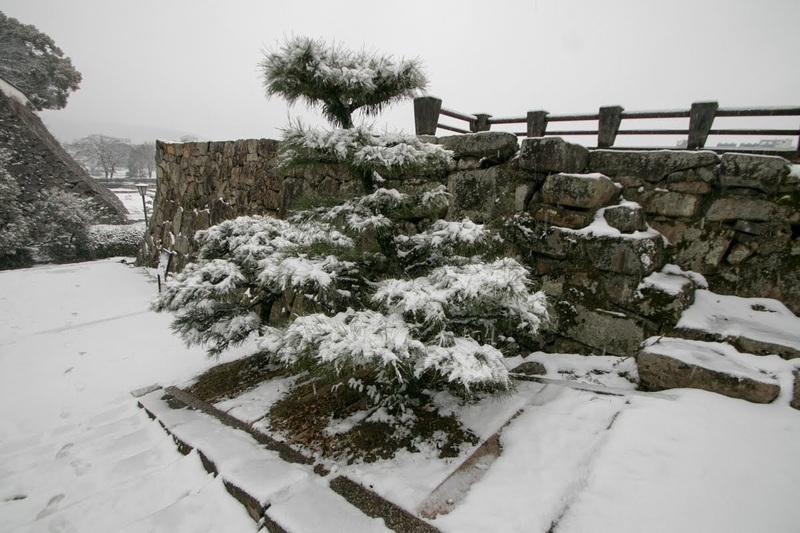 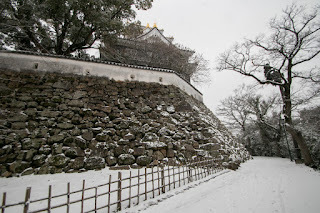 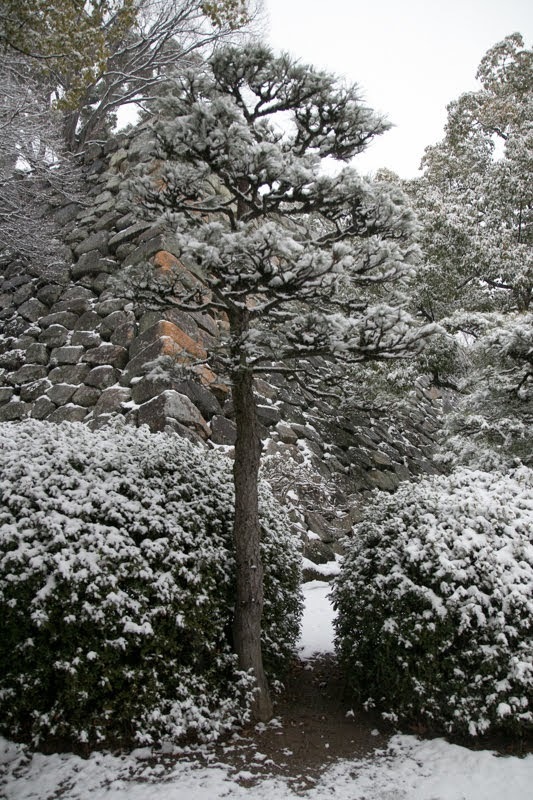 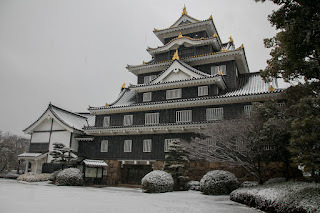 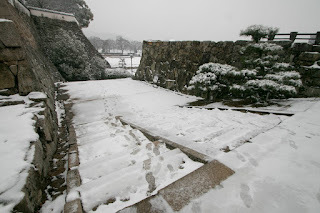 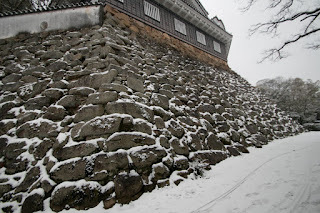 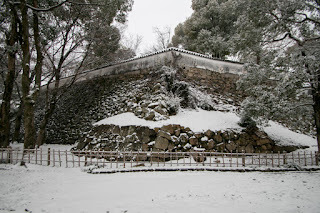 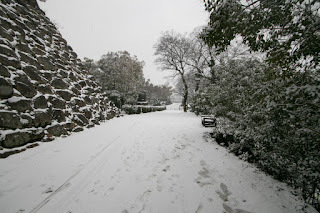 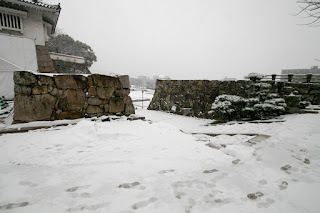 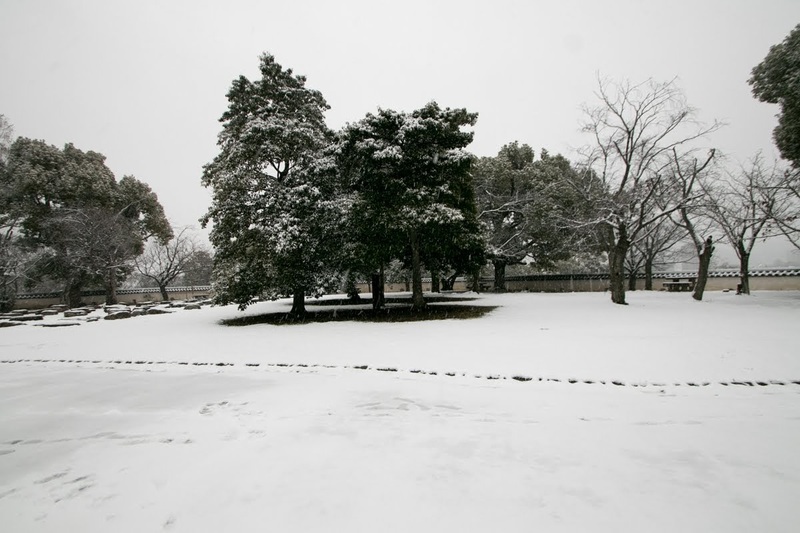 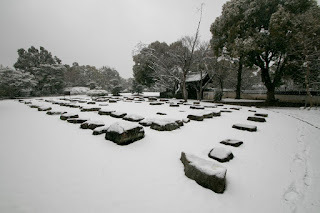 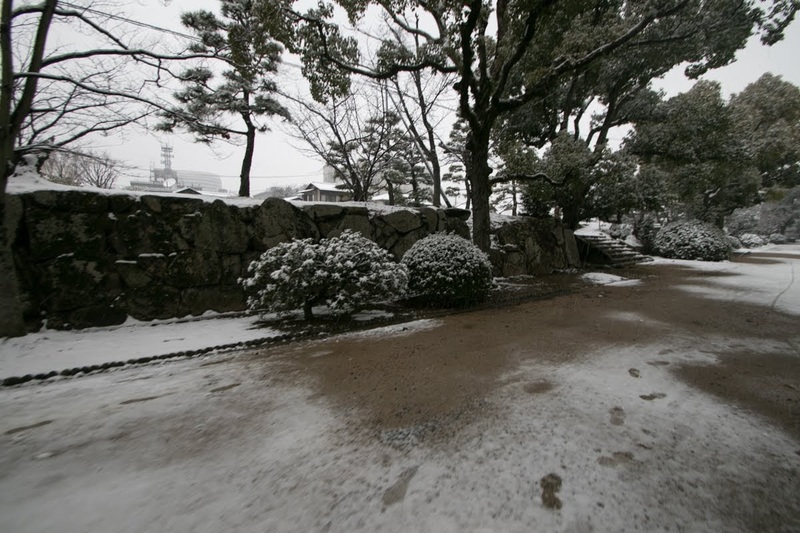 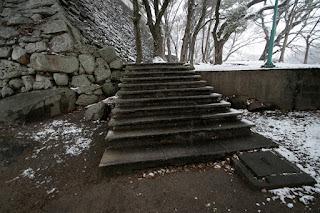 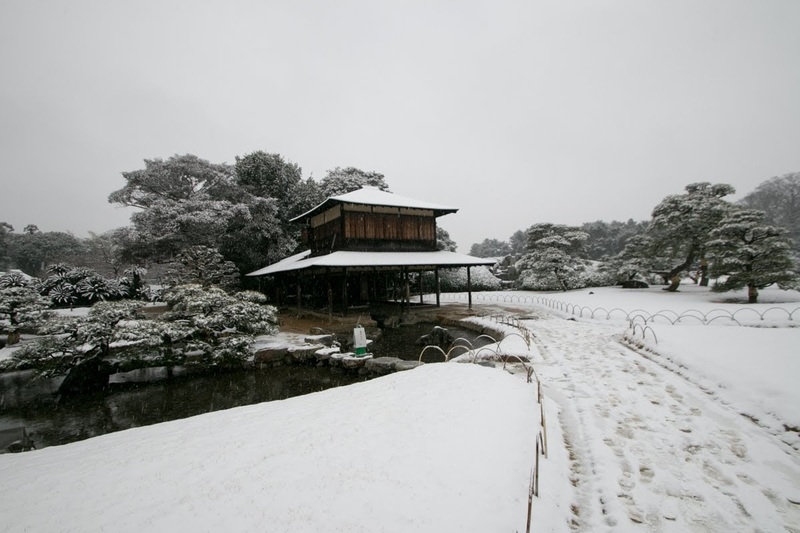 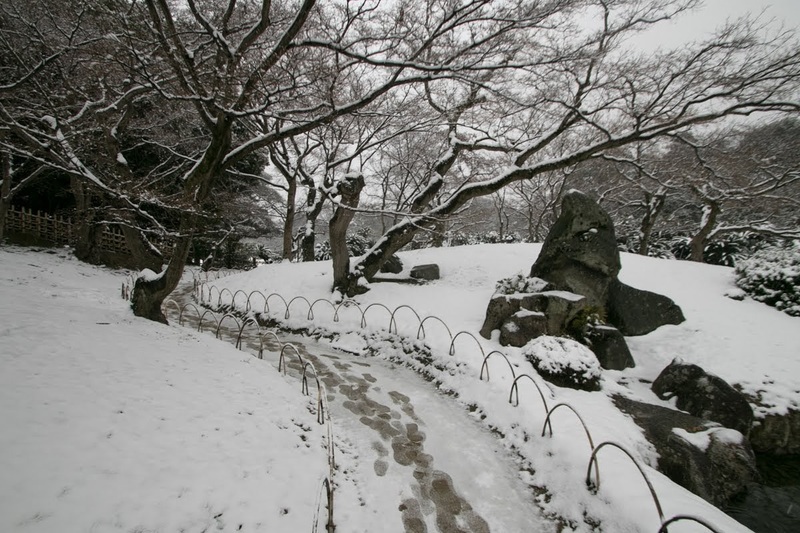 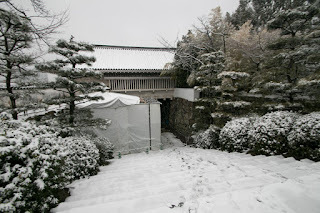 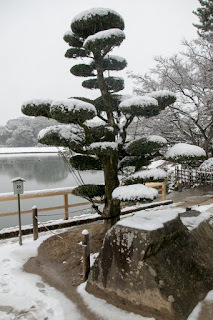 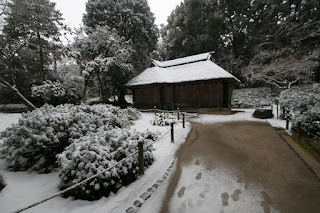 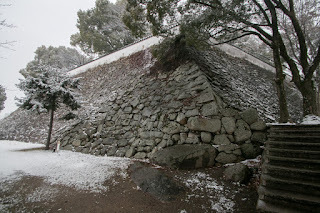 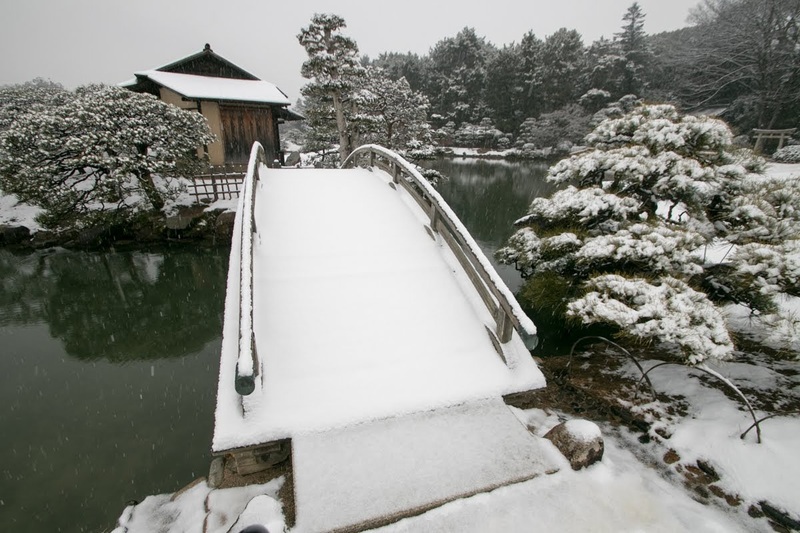 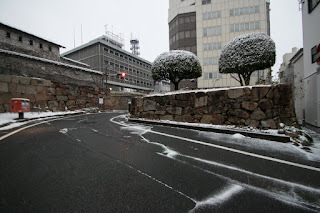 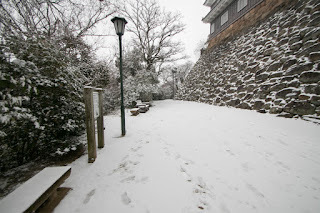 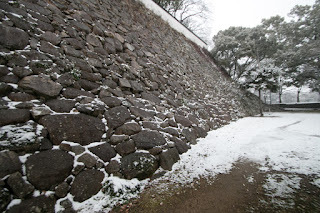 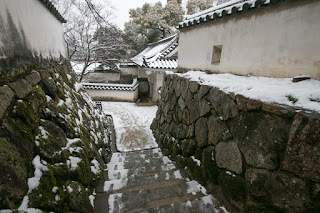 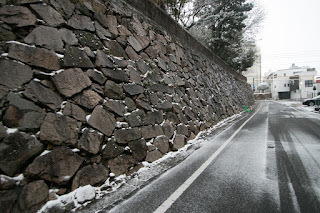 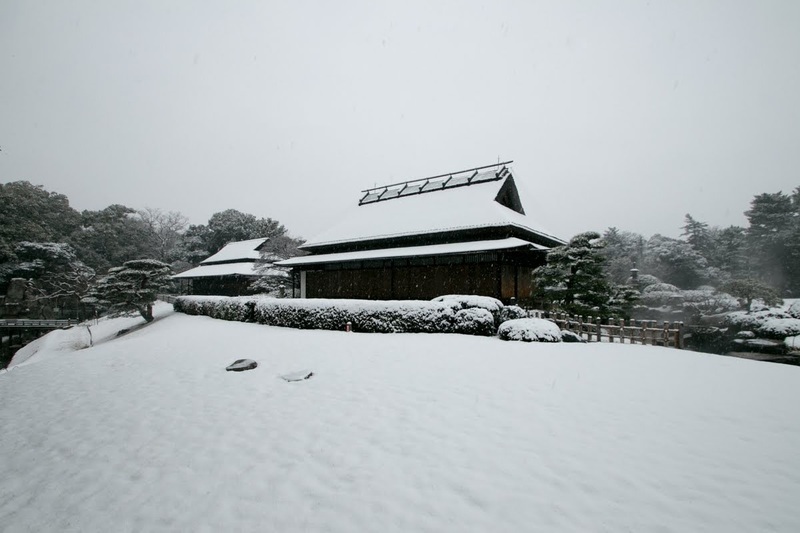 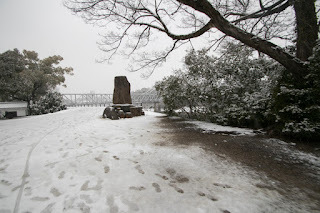 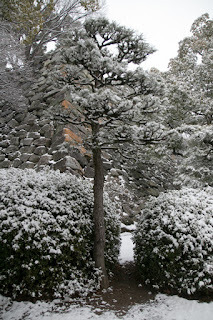 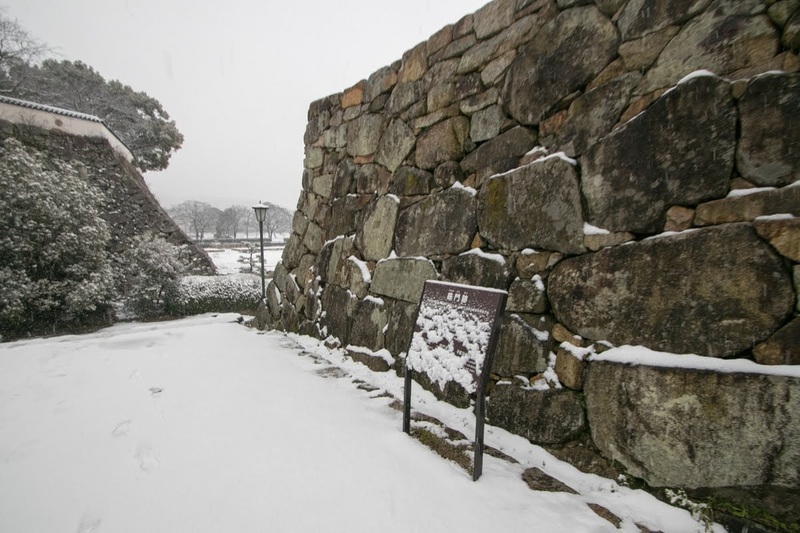 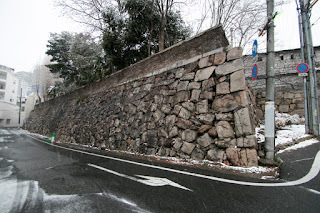 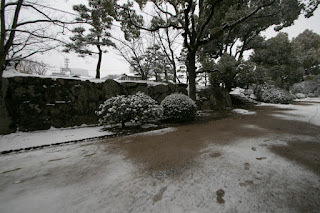 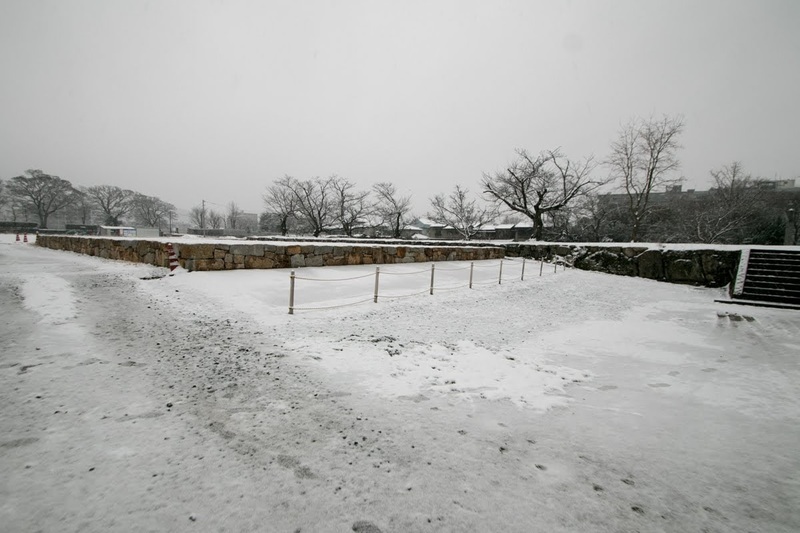 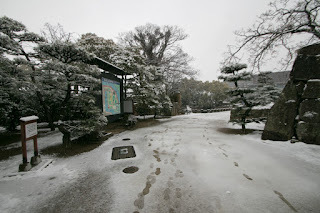 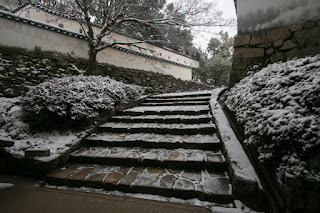 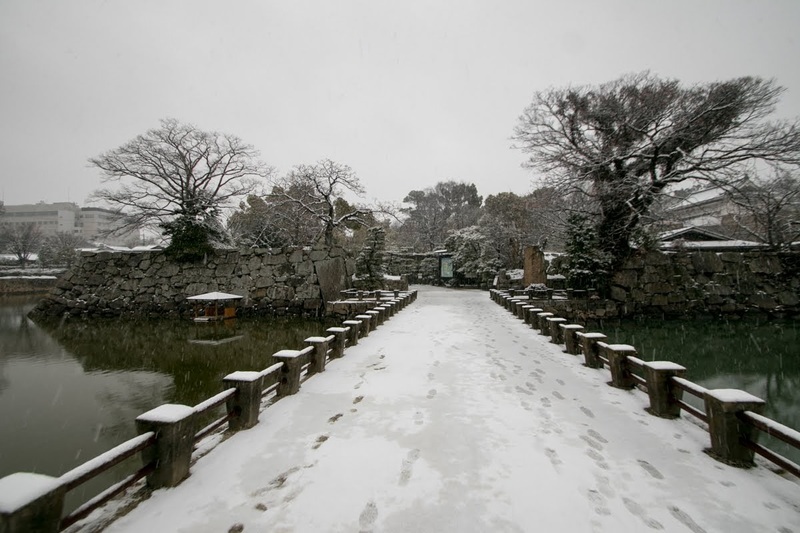 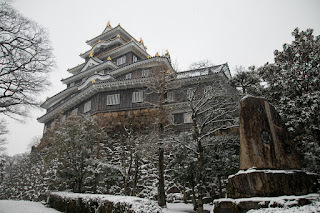 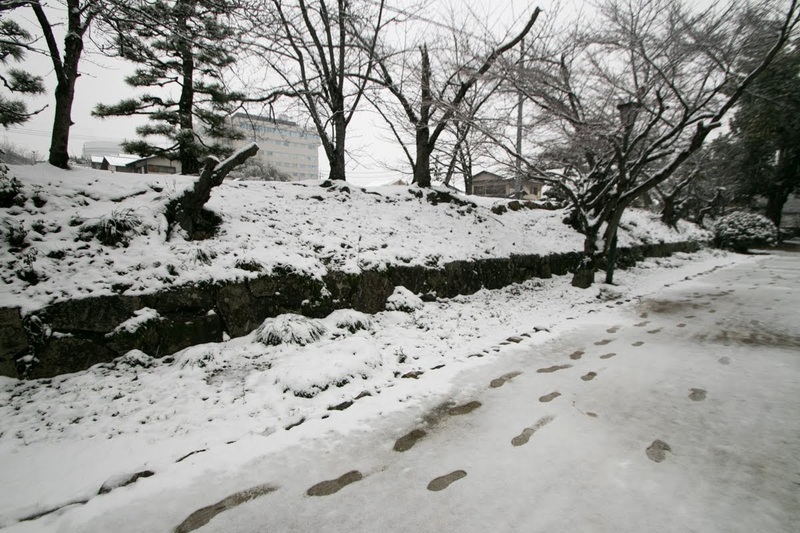 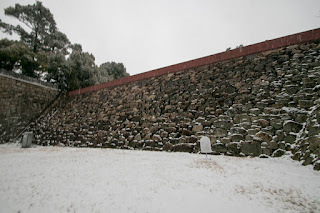 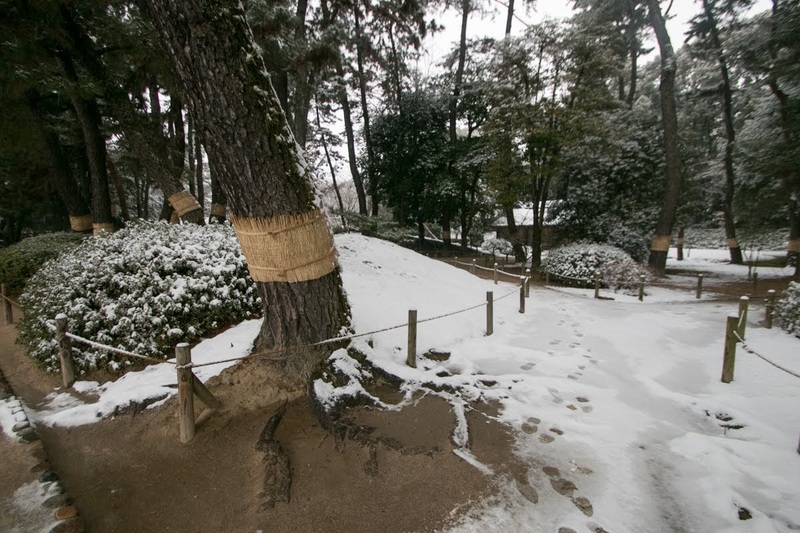 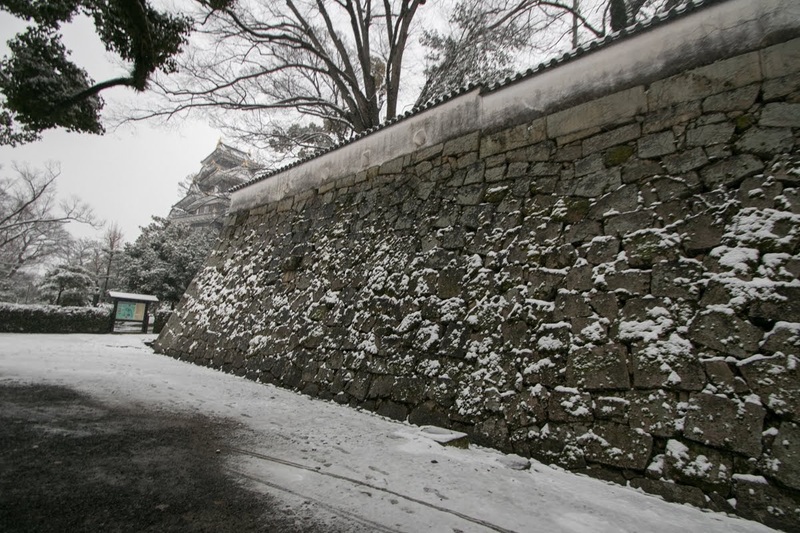 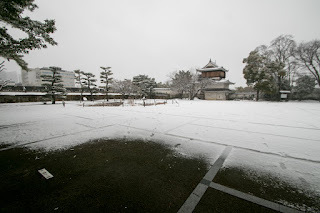 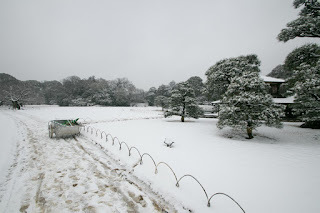 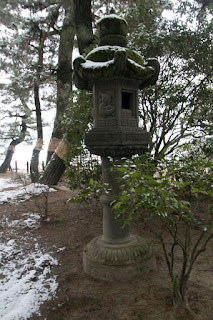 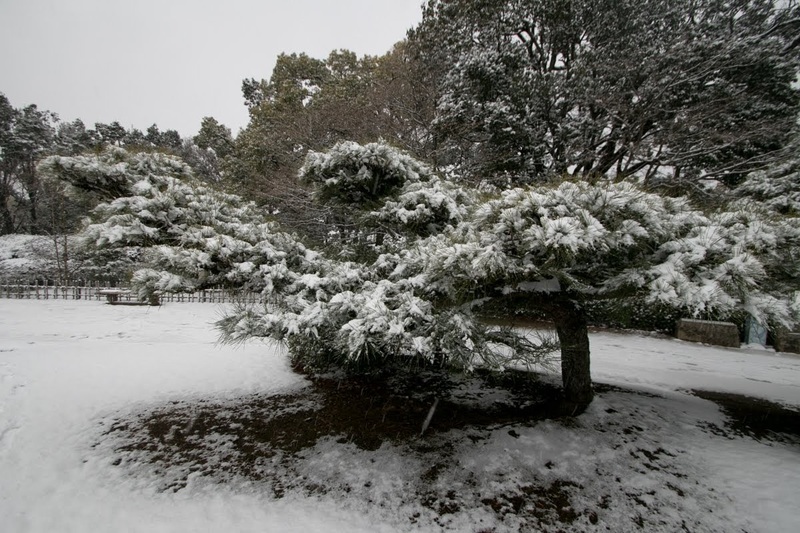 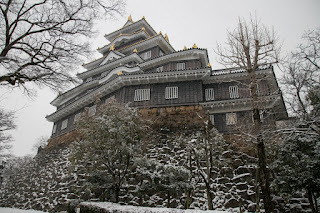 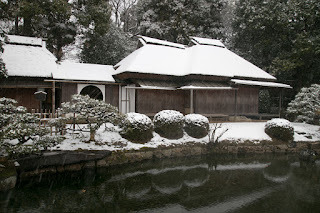 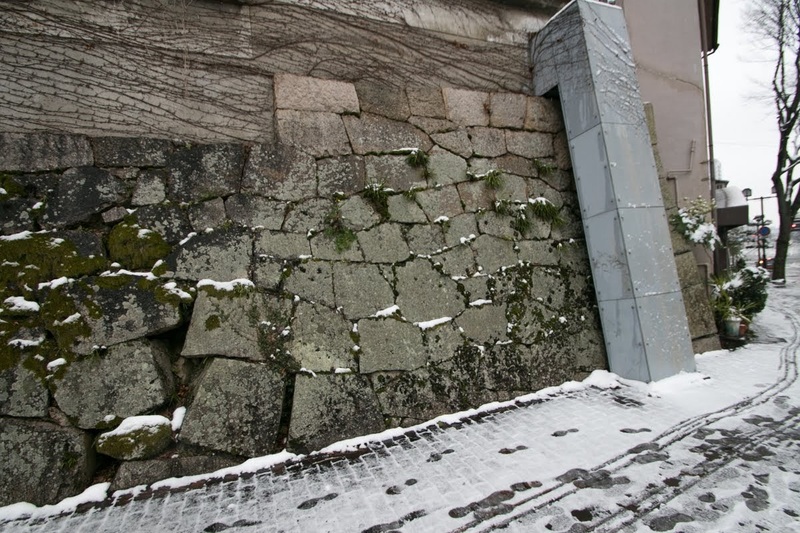 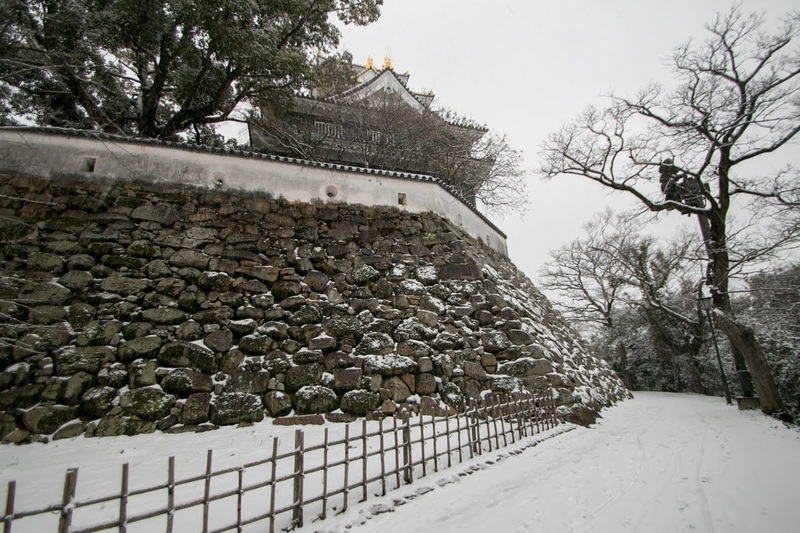 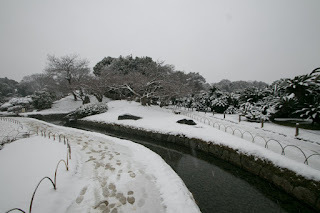 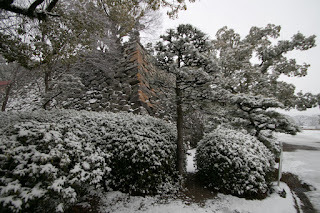 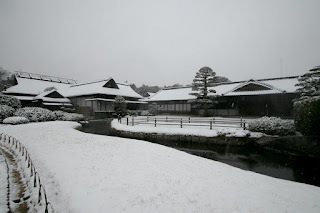 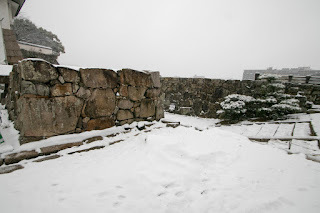 During this time Hideie stayed Okayama castle and firmly guarded the backward of Hideyoshi. 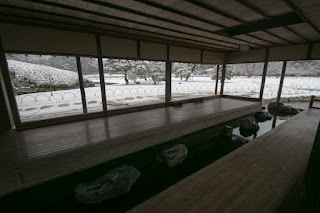 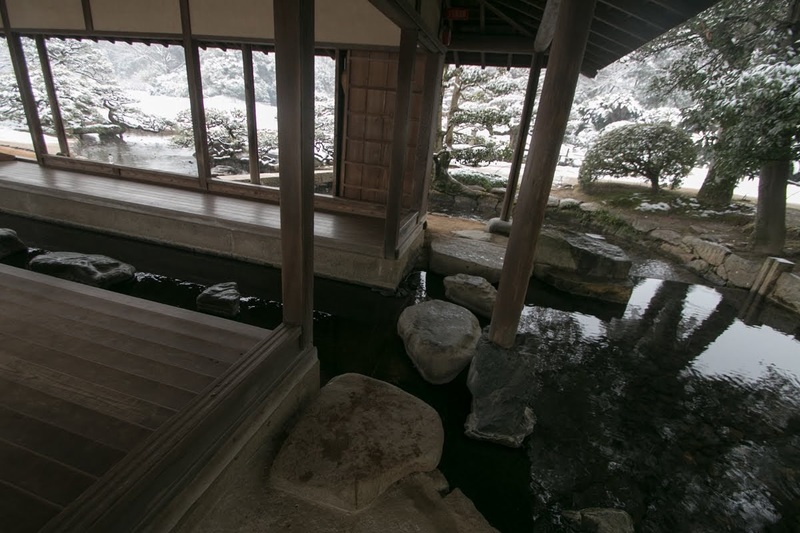 As Hideyoshi rapidly promoted from mere phesant and had little relatives and hereditary retainers, and considering the contribution of Ukita clan, Hideyoshi gave favorable treatment to Hideie. 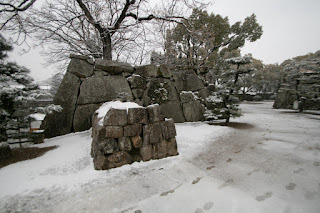 Hideyoshi treated Hideie as a nominal child of Hideyoshi, and gave surname of Toyotomi. Hideie married with the daughter of Toshiie Maeda (1538-1599), an old friend of Hideyoshi and prominent figure of Toyotomi government, and later was nominated as one of the five grand ministers of Toyotomi government. 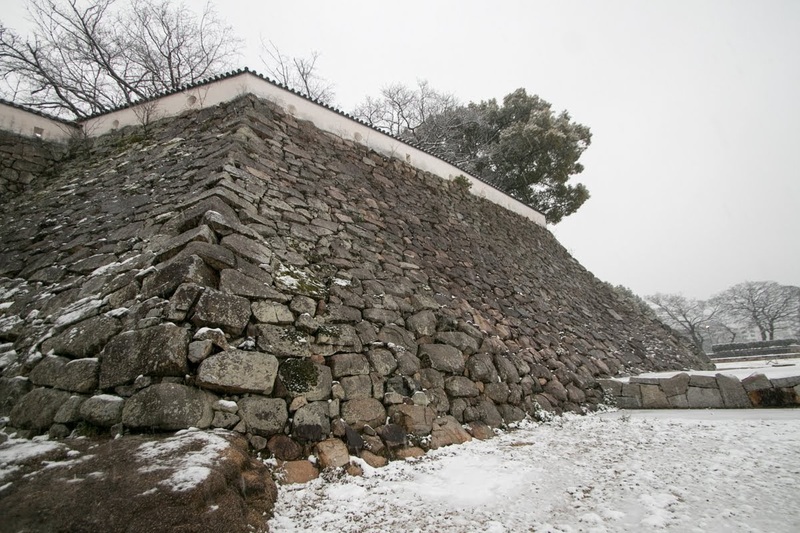 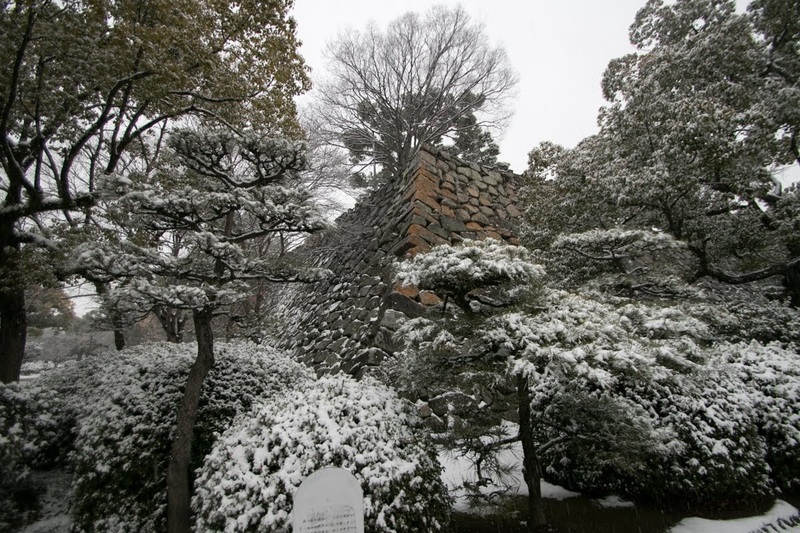 As an important lord of Toyotomi government, Hideyoshi also recommended Hideie to build a magnificent castle. 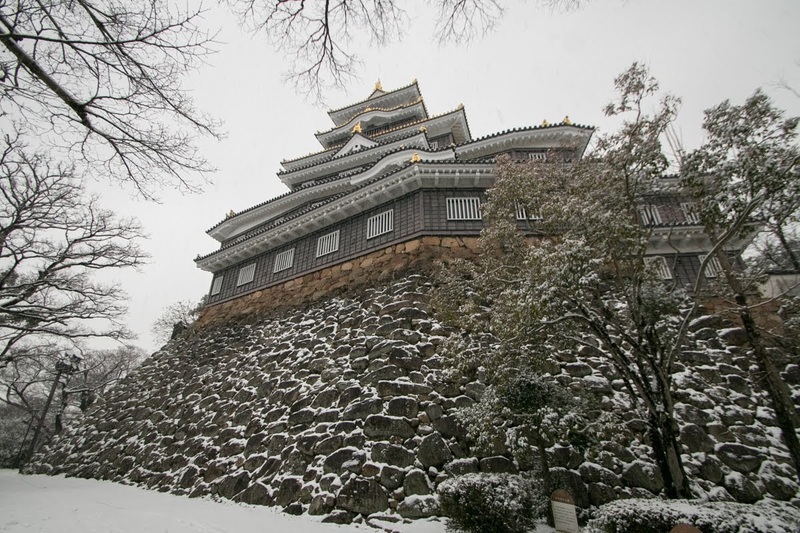 Based on the suggestion of Hideyoshi, Hideie newly expand Ishiyama castle into the next large hill named Okayama. 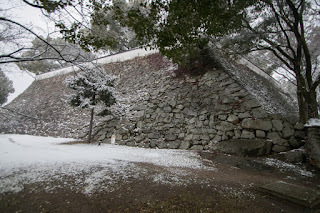 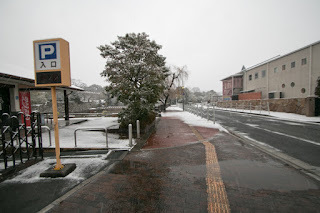 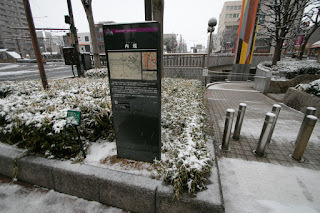 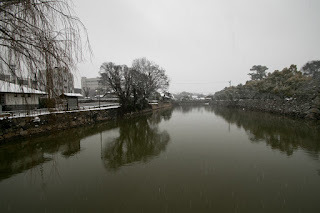 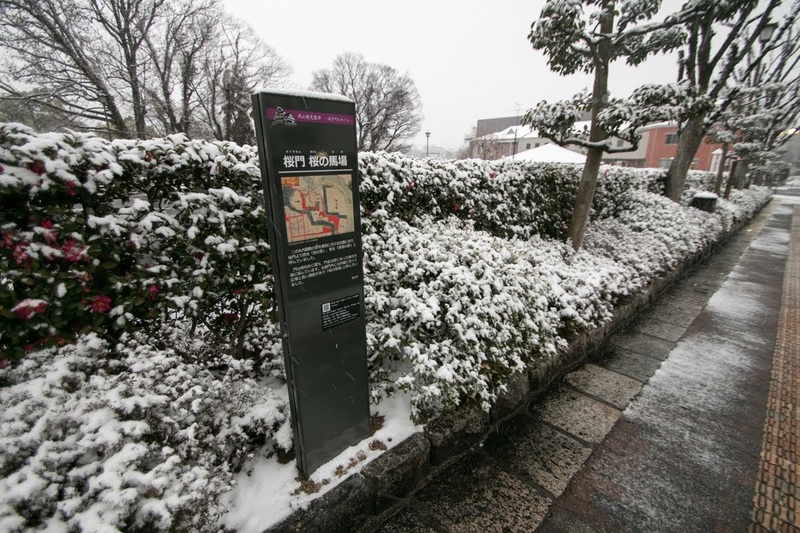 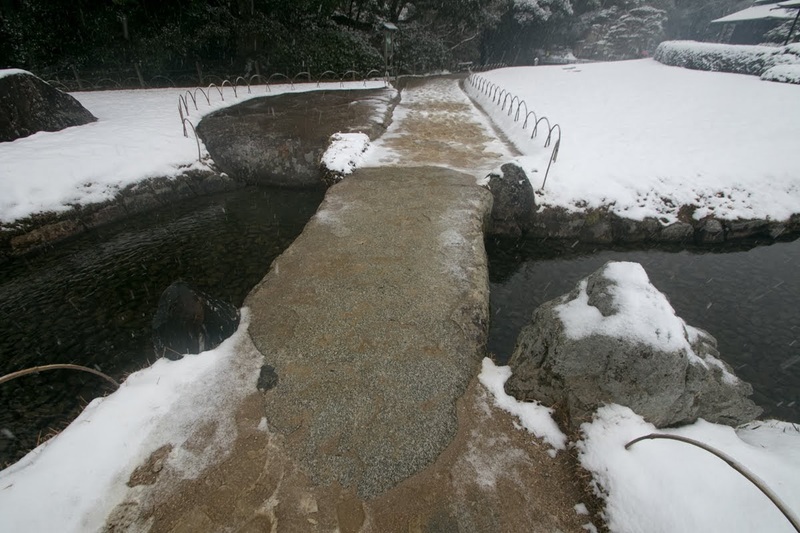 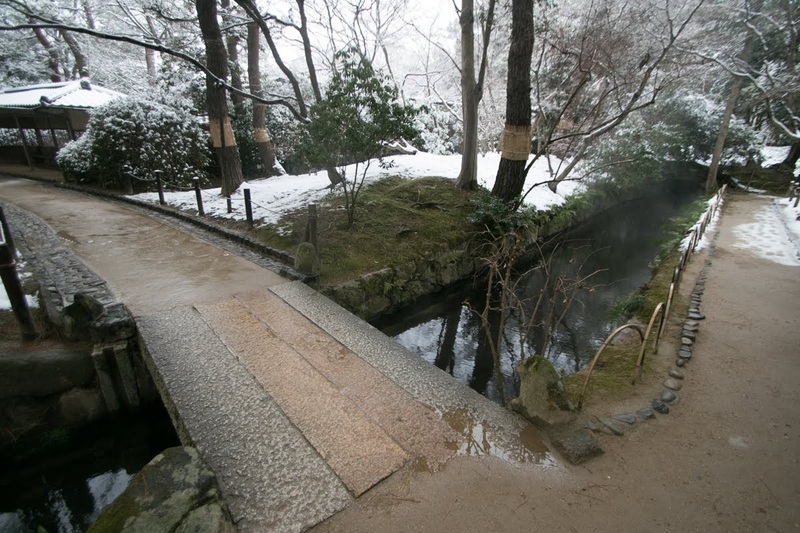 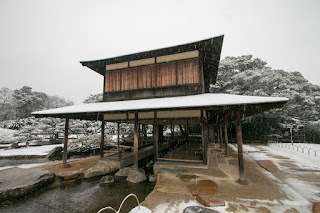 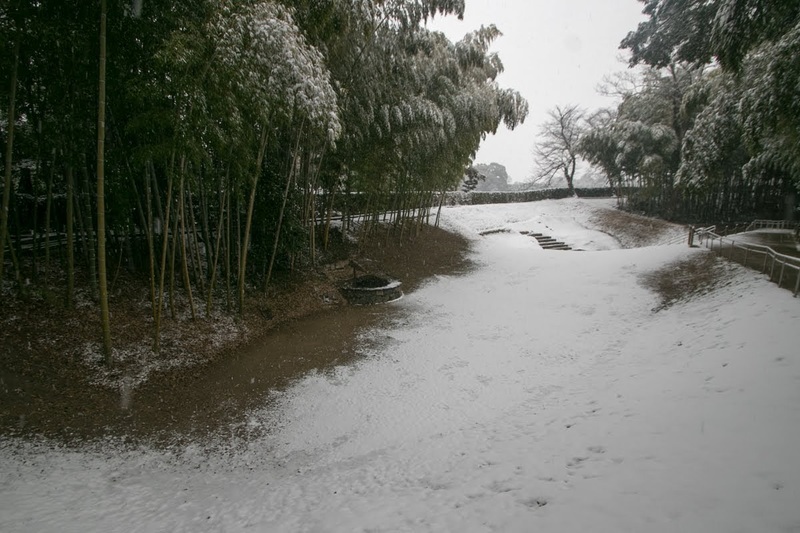 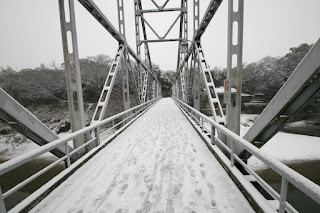 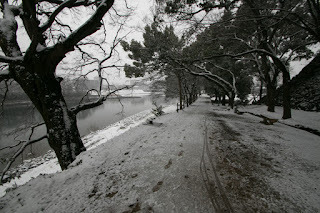 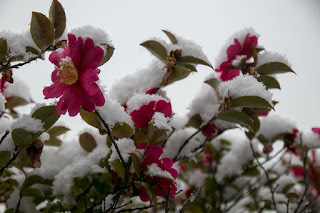 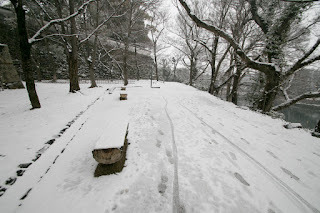 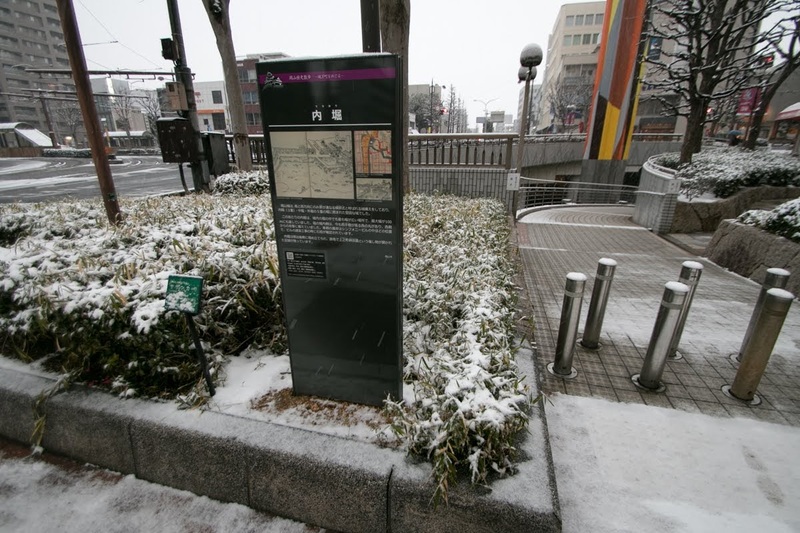 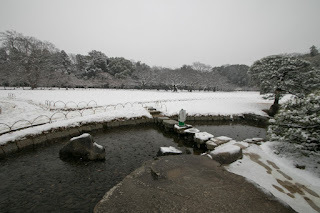 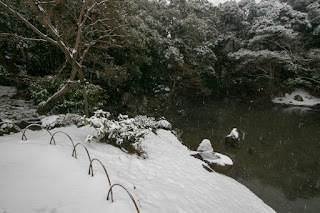 Hideie also changed the route of Asahigawa river to the backward of Okayama hill, thus Asahiga river became curved at the site of Okayama castle. 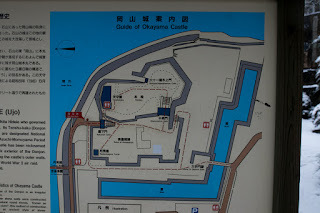 New Okayama area was integrated into former Ishiyama castle and rough shape of current Okayama castle completed at this time. 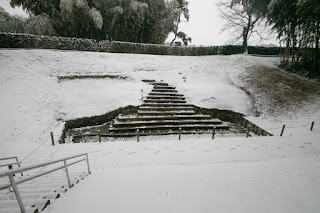 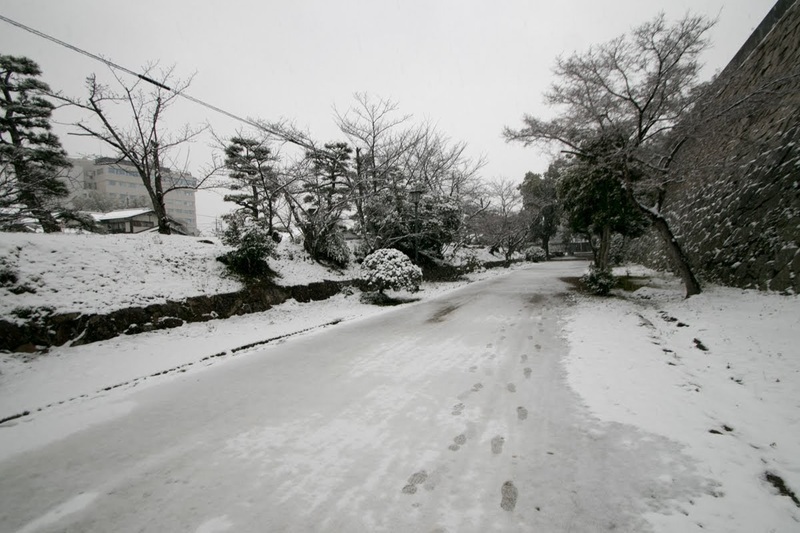 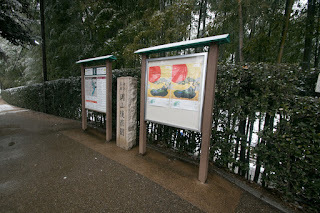 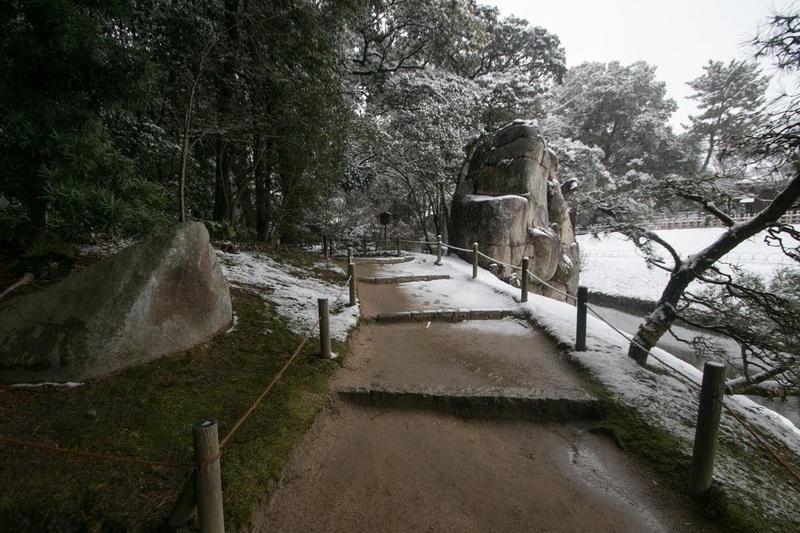 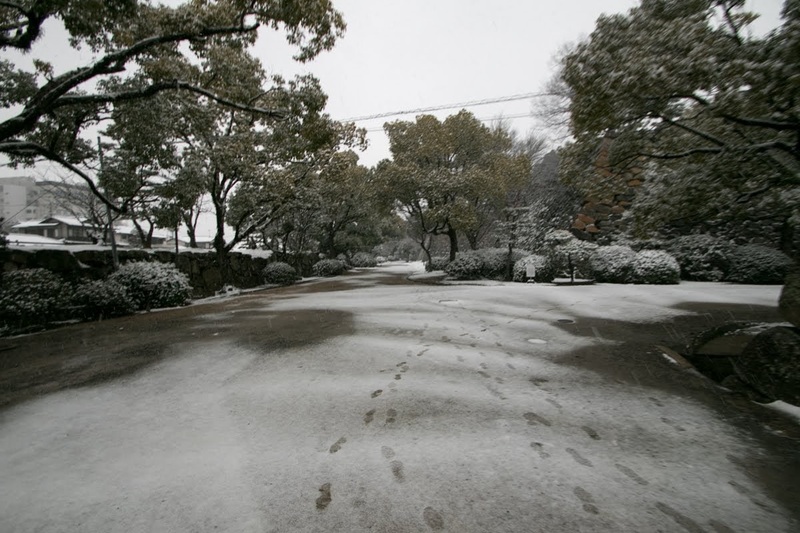 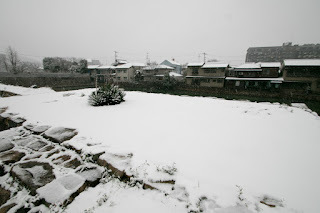 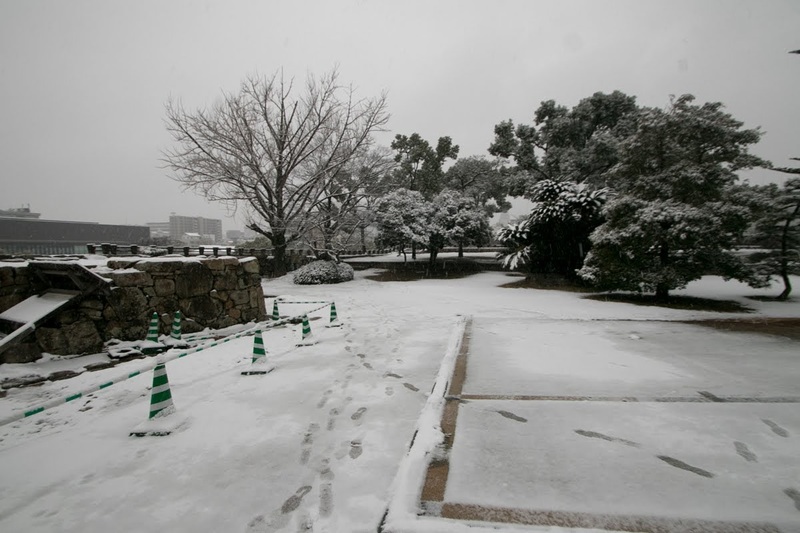 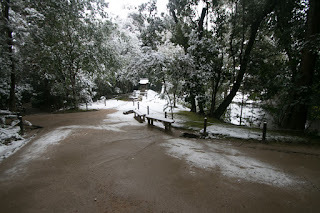 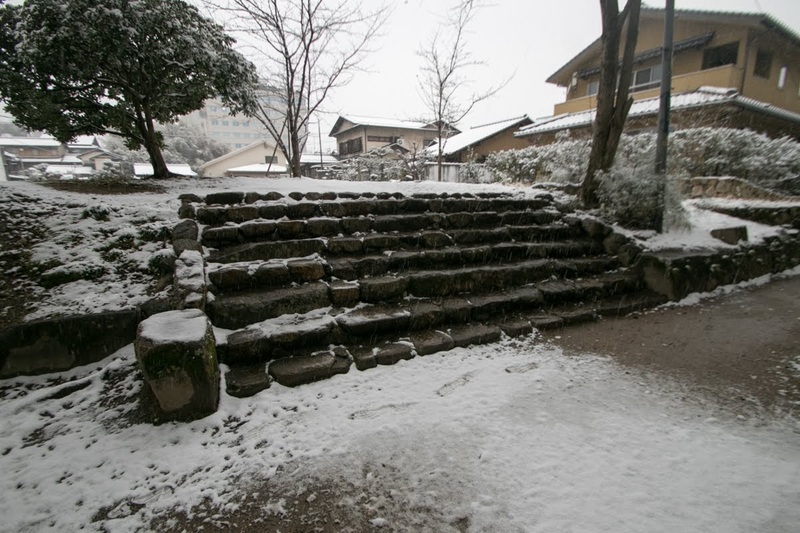 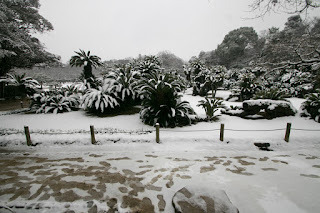 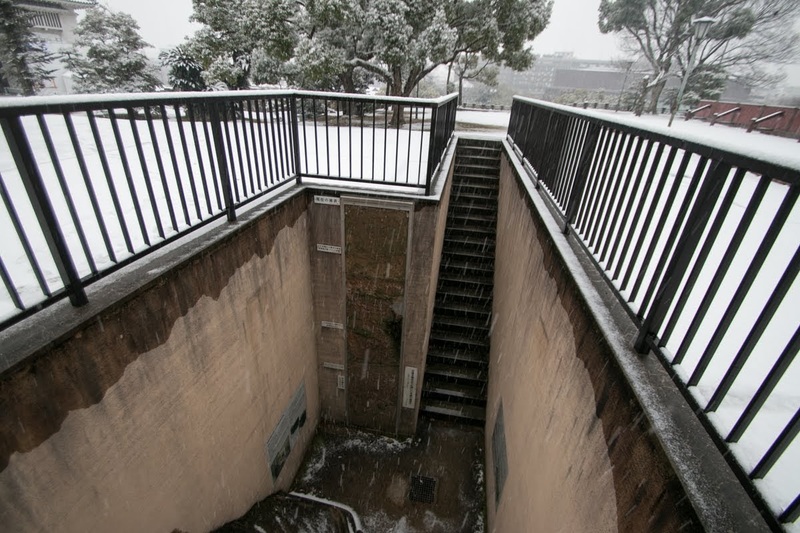 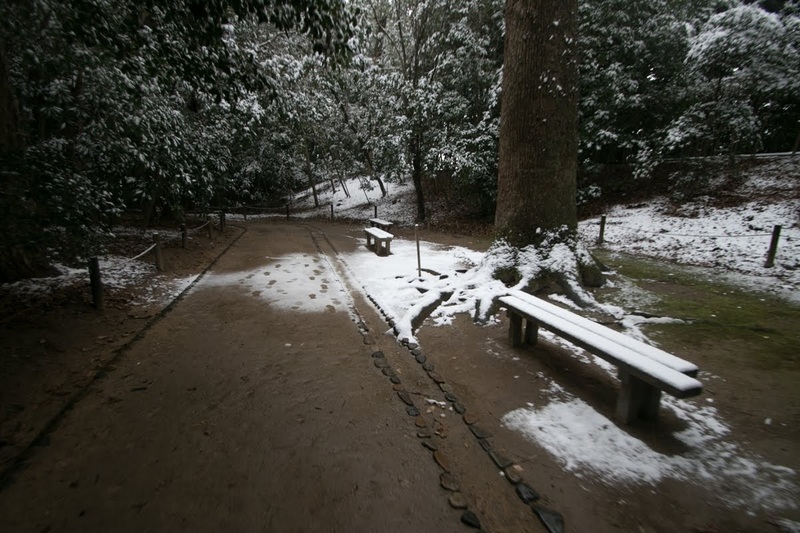 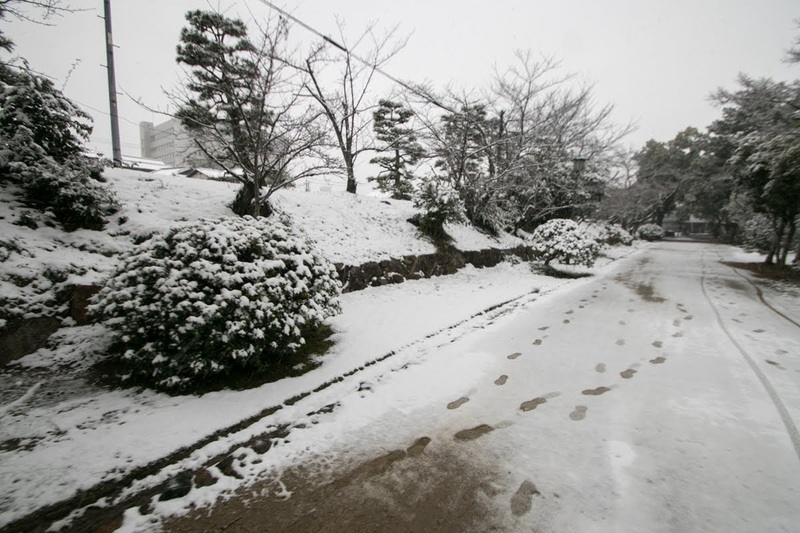 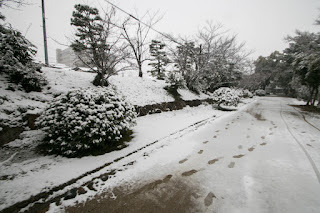 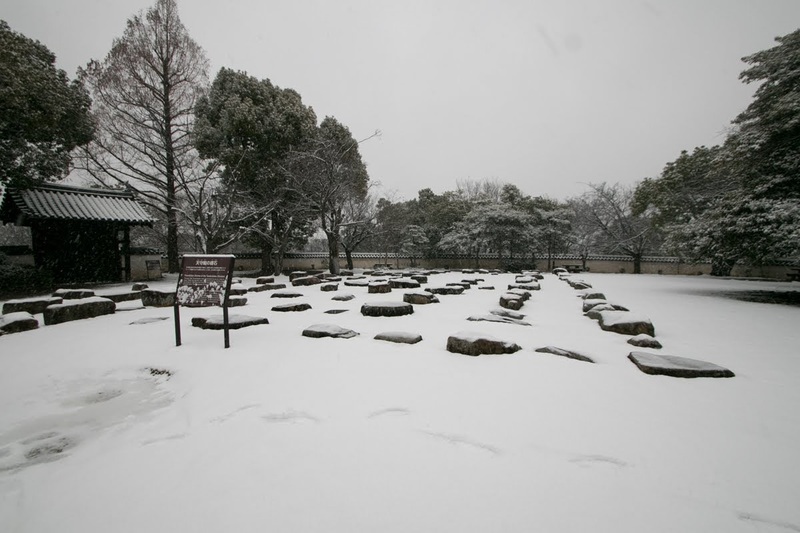 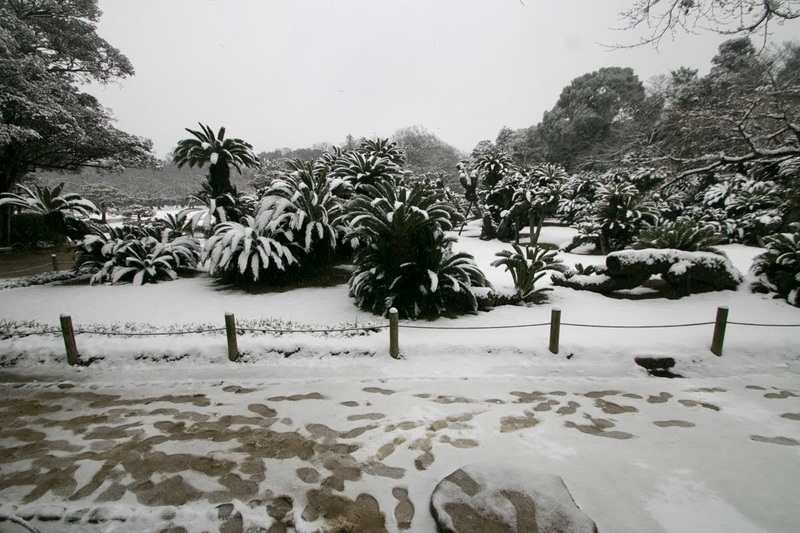 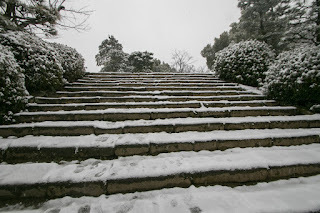 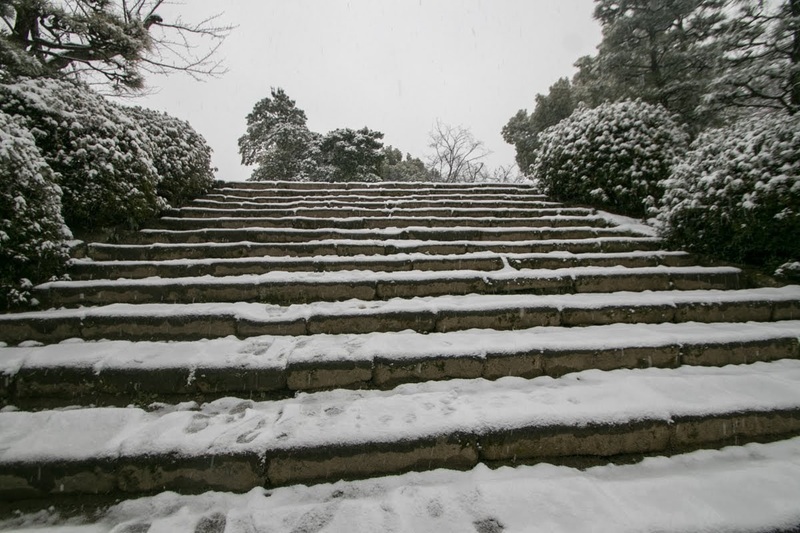 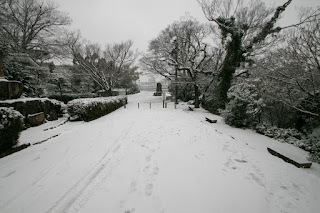 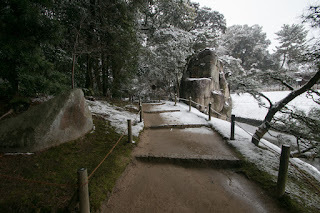 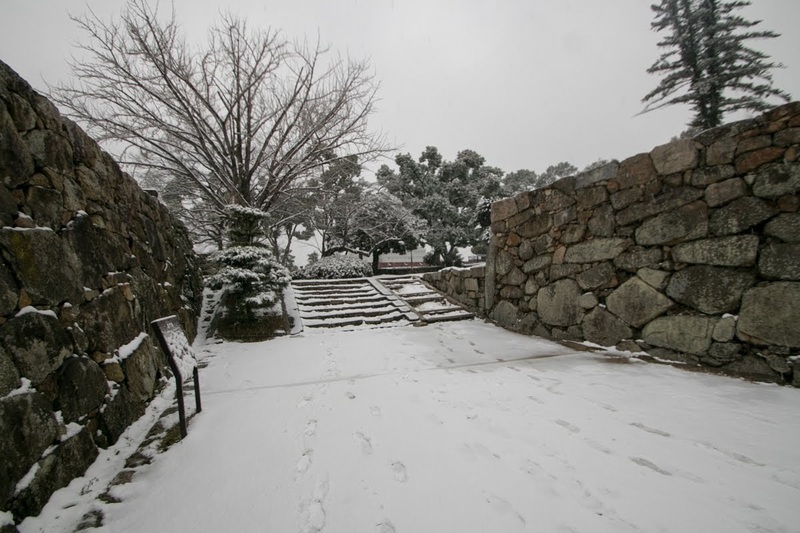 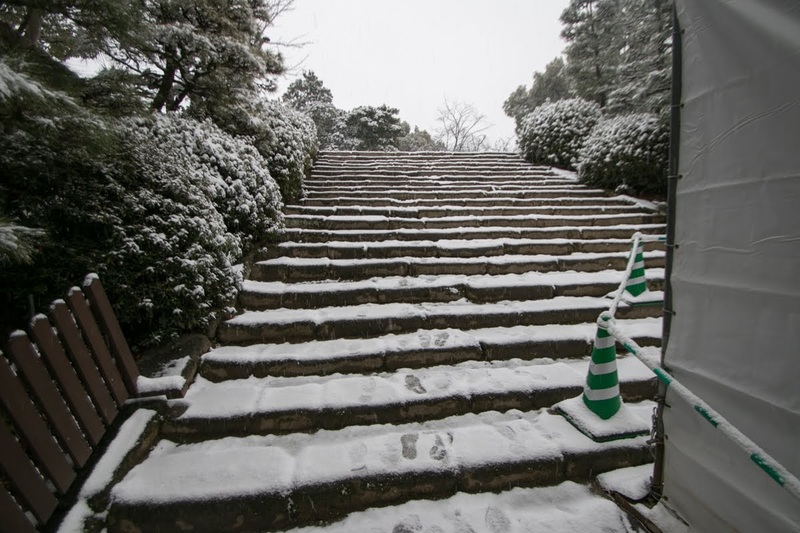 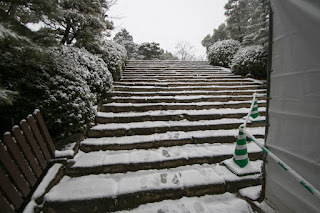 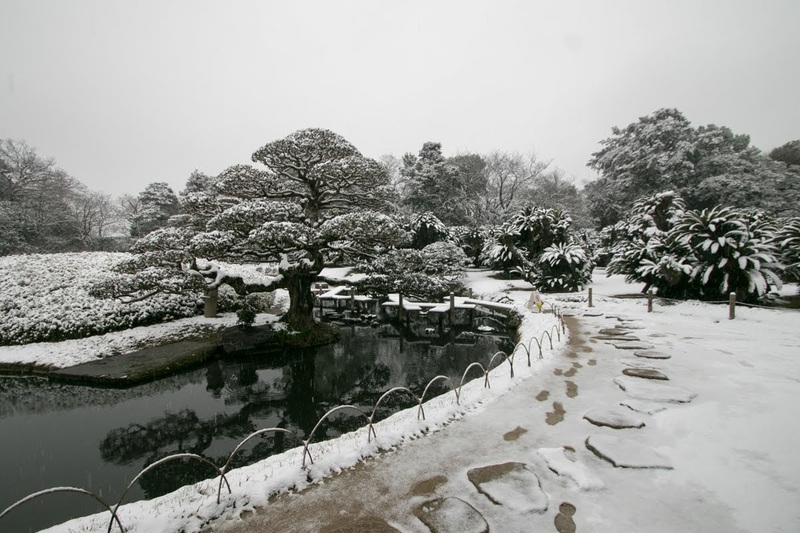 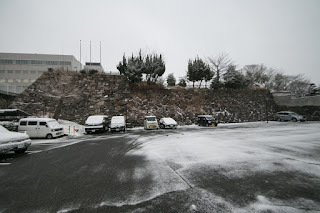 The Okayama hill is separated into two layers, and the upper area is used as a central area. 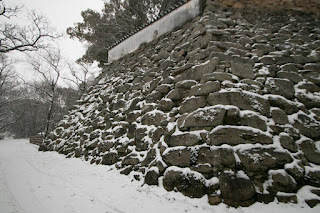 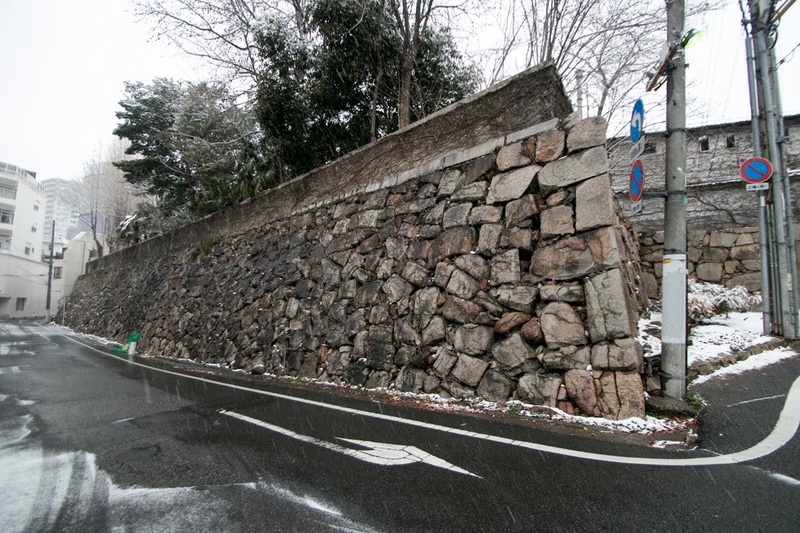 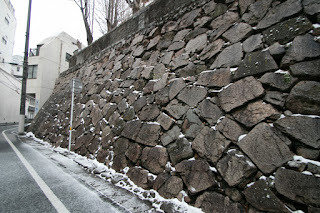 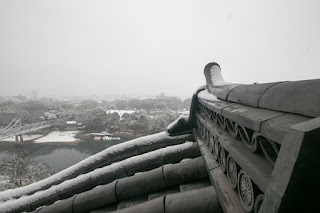 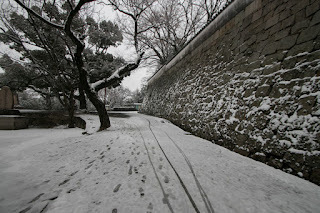 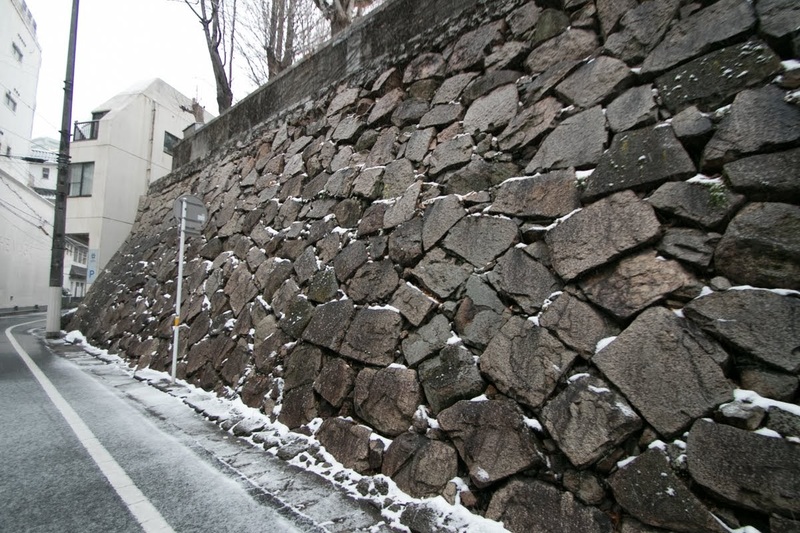 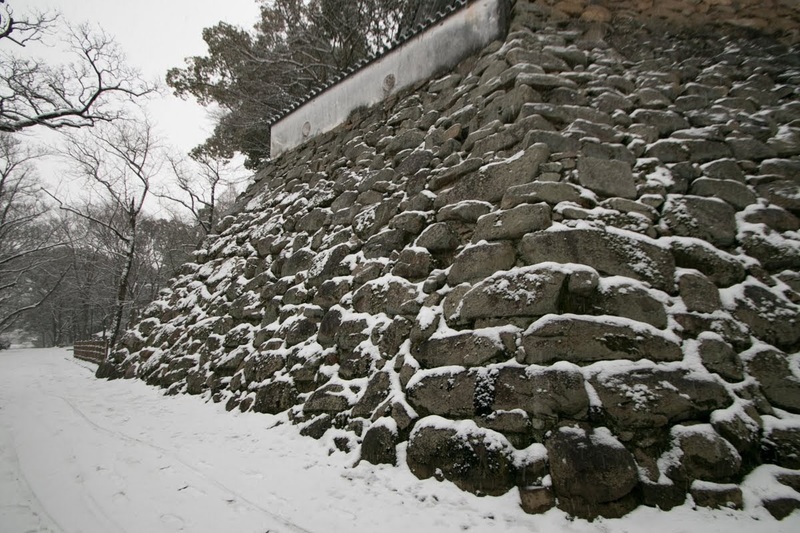 The riverside slope of the hill is guarded by 20 meter tall stone walls, and lower terrace at the west of central area is used as a secondary area. 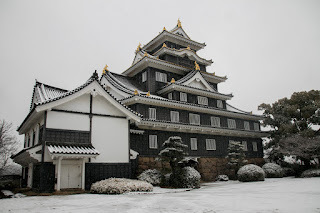 A five story six floor main tower was built at the northeast edge of central area. 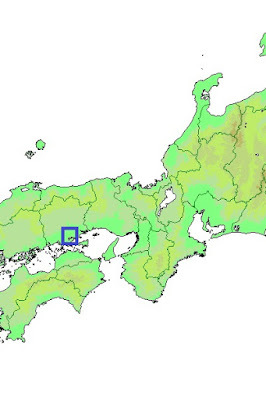 As the shape of this edge is not right angled, thus the shape of basement floor is a scalene polygon. 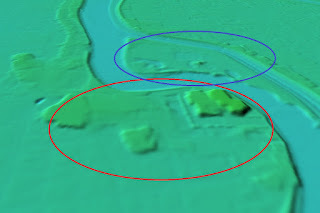 The shape of secondary and upper floor is rectangular, thus the exterior of riverside direction becomes complex and had a characteristic view. 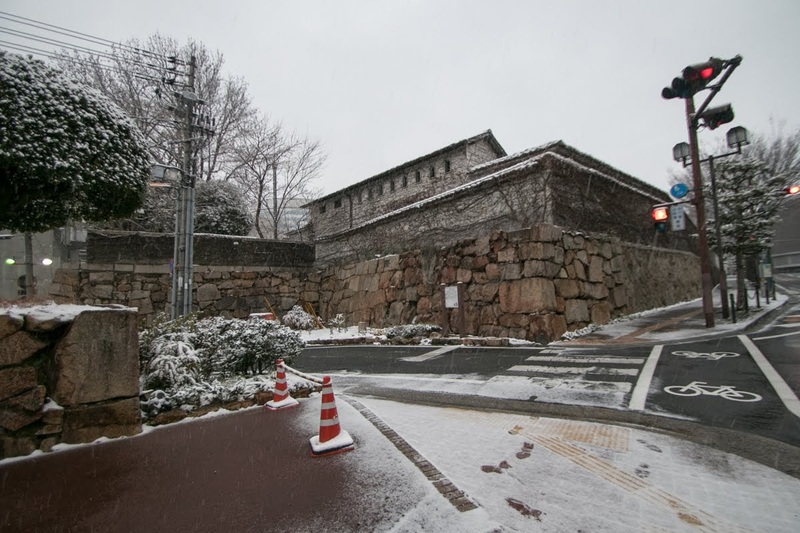 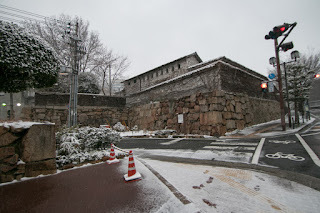 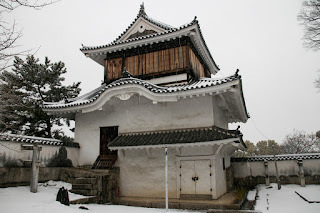 The style of main tower is a boro-gata (watch tower style) which consist of basement turret and upper watch tower, and every wall of main tower was covered by black board. 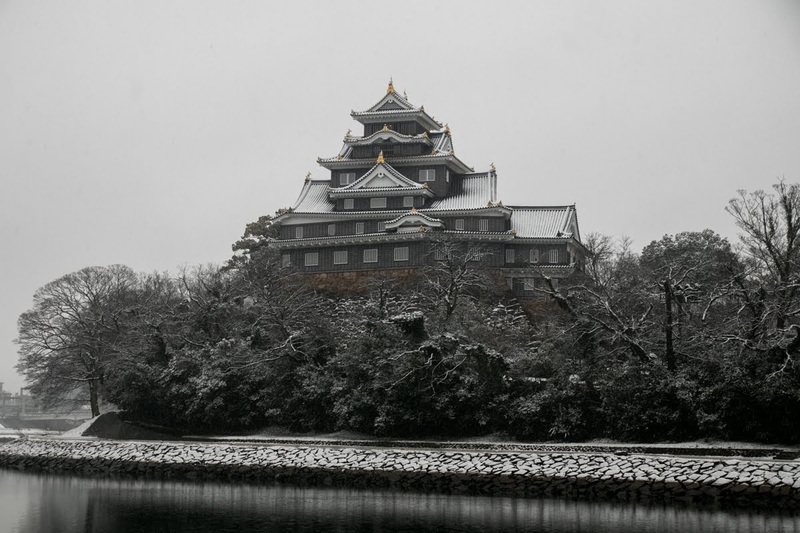 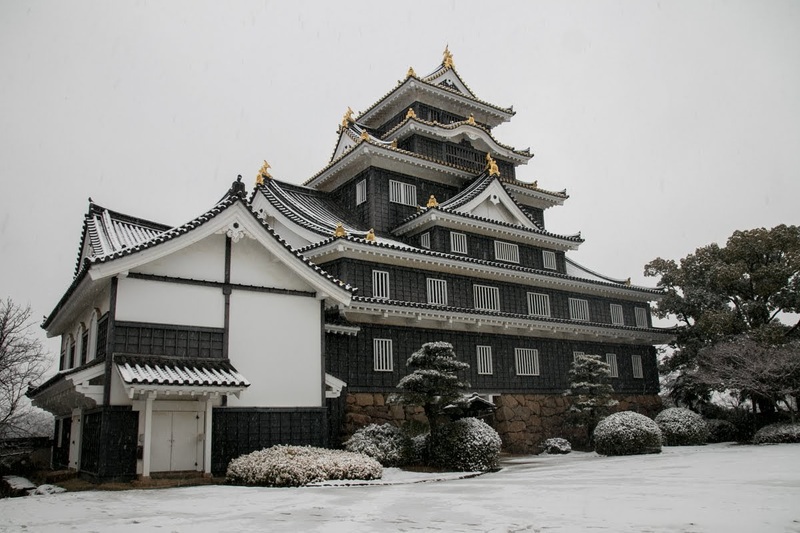 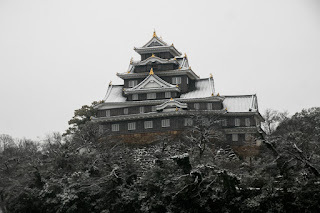 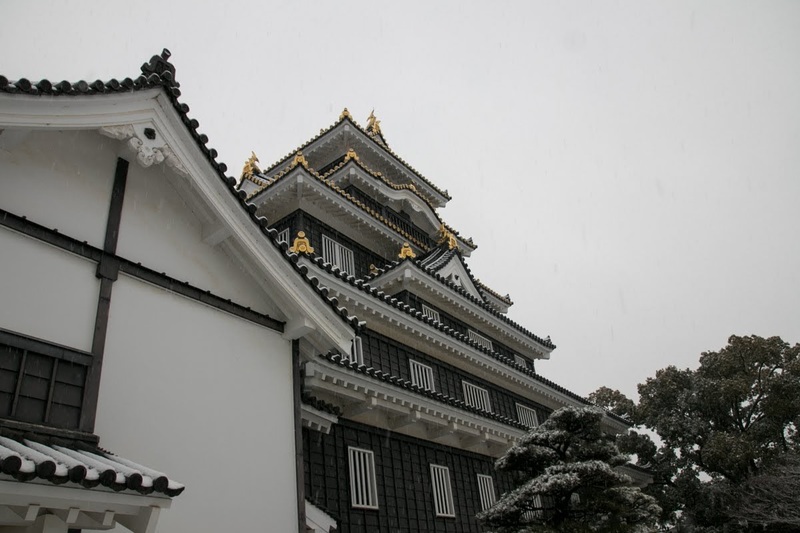 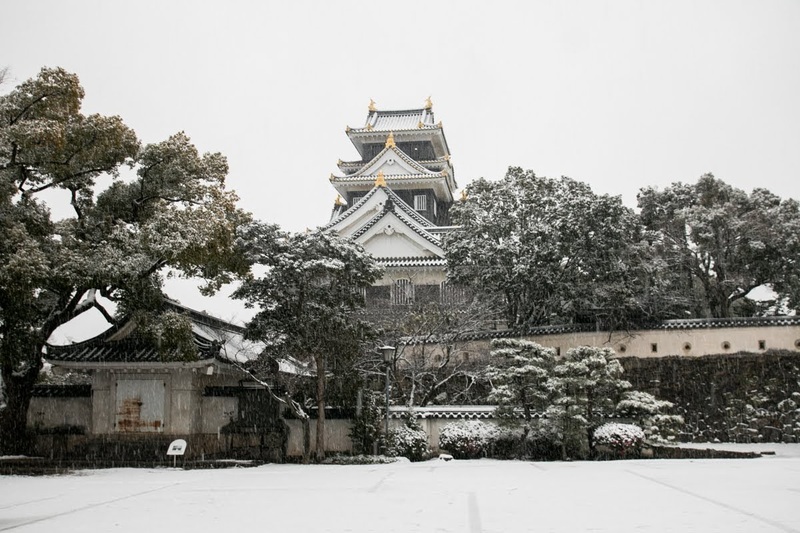 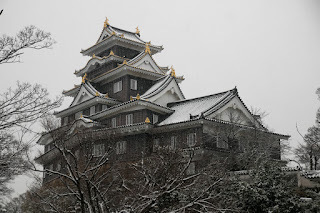 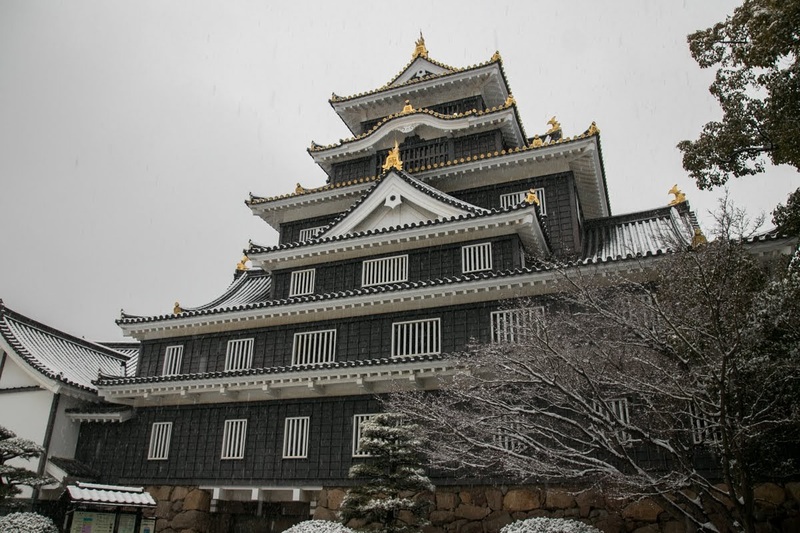 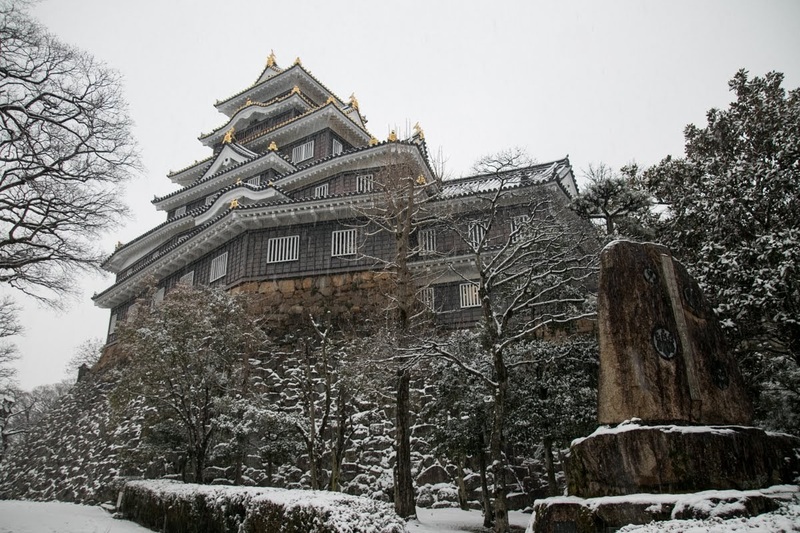 It is said that this main tower was built referring preceding Azuchi castle and Osaka castle, and due to its exterior, Okayama castle was called as “Crow Castle”, probably in comparison with Himeji Castle as “White Earet Castle”. 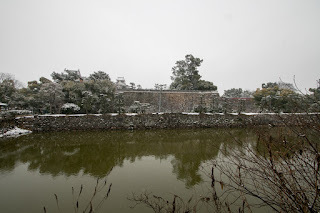 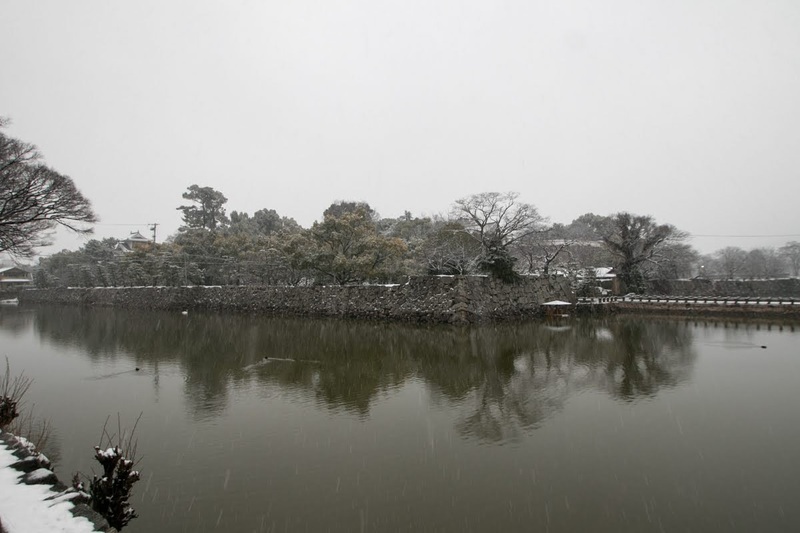 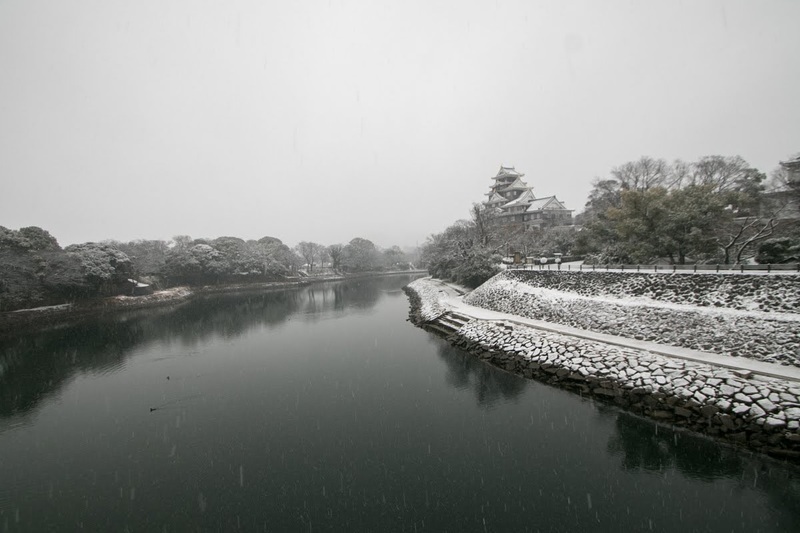 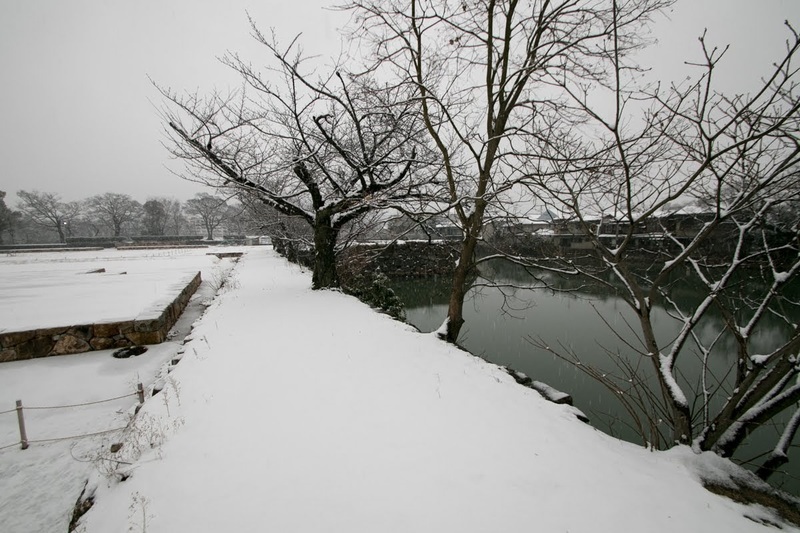 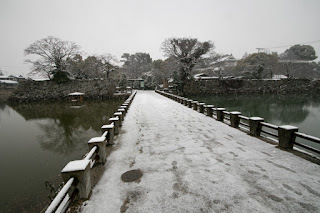 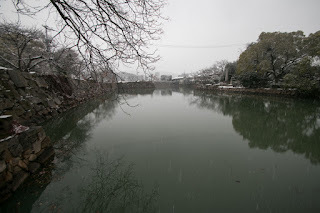 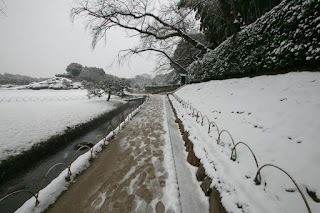 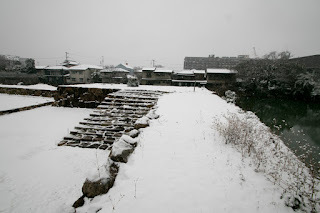 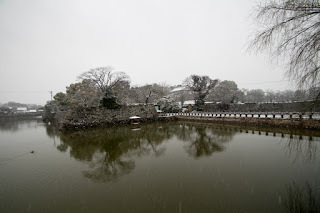 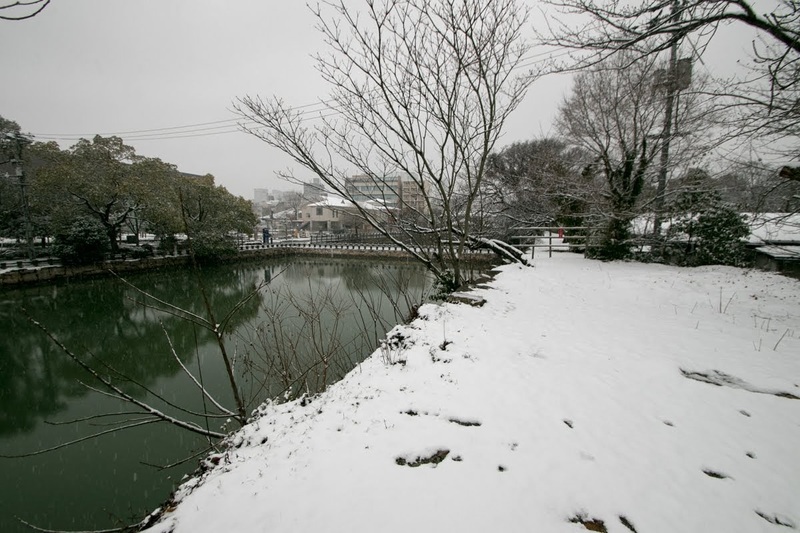 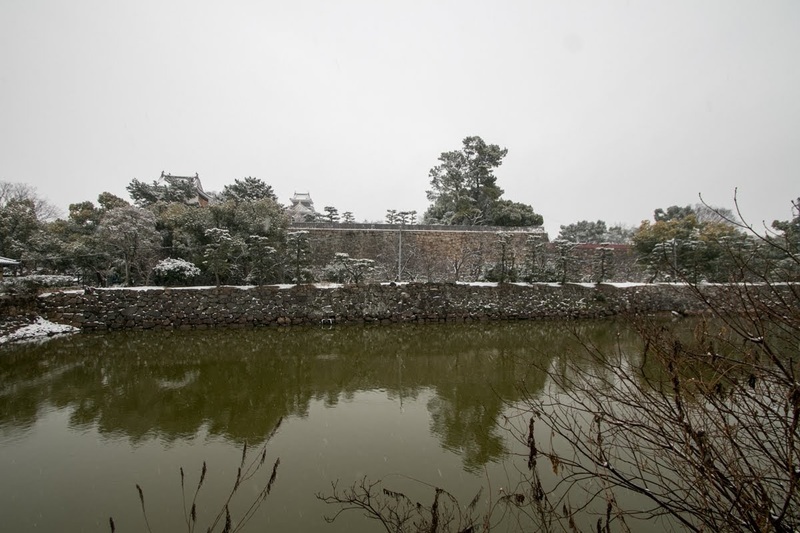 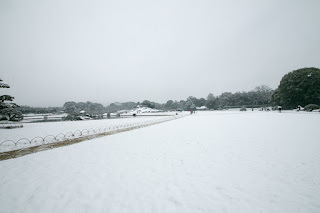 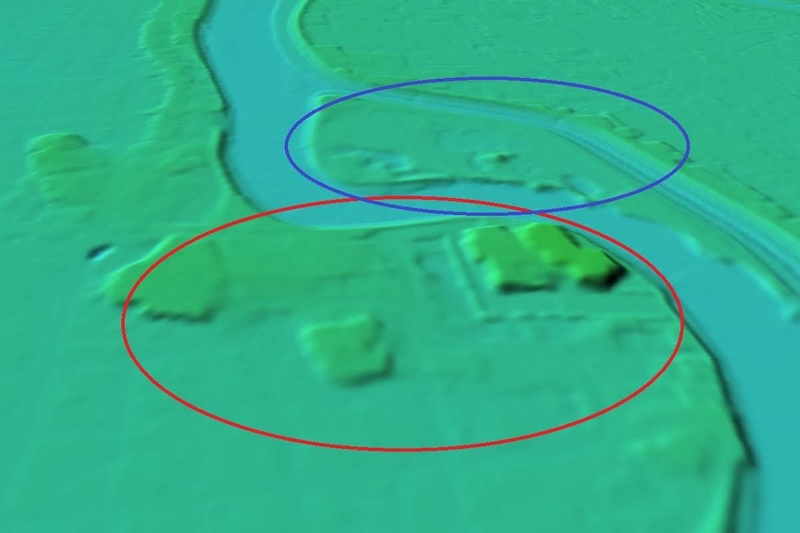 Outside the Okayama hill across the inner water moat, outer areas spread to former Ishiyama castle site, and total size of major areas was 500 meter length and 300 meter width. After the death of Hideyoshi, in 1600, the battle of Sekigahara occurred between Ieyasu Tokugawa (1543-1616), the largest lord under Toyotomi government, and Mitsunari Ishida (1560-1600), the chief administrative staff of Toyotomi government. As being grown up as an important person of Toyotomi government, Hideie supported Mitsunari and bravely fought as a main force of Ishida side army at Sekigahara. 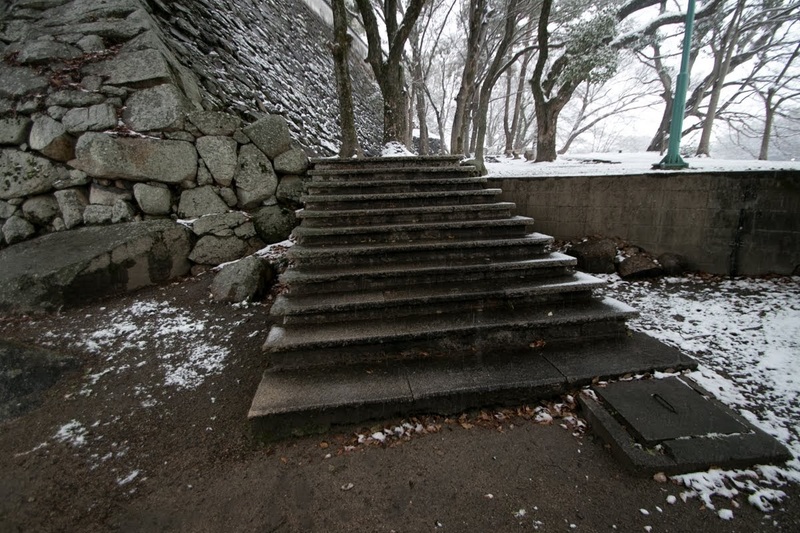 But as a result Ishida side was defeated, and Hideie left the battlefield. 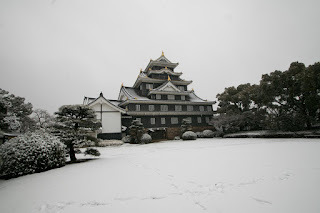 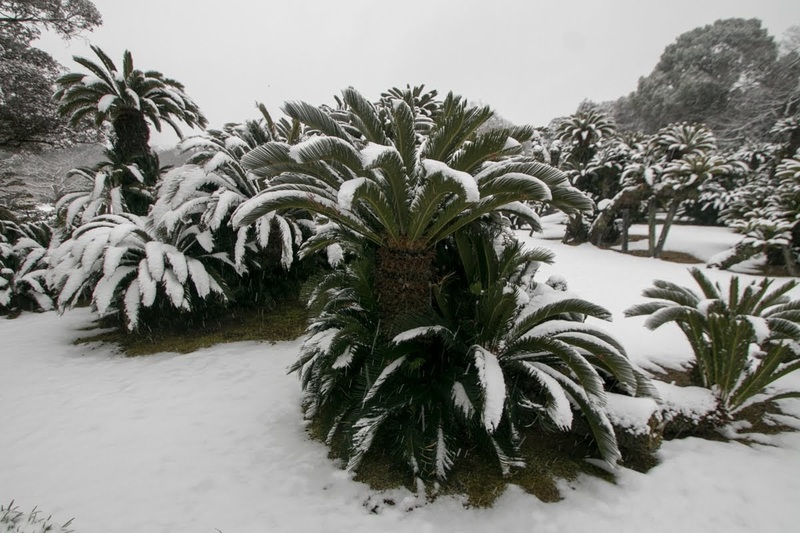 He ran into Satsuma country (Kagoshima prefecture) which was governed by Shimazu clan and could survive, but lost his territory and Okayama castle. Shimazu clan and Ieyasu discussed for peace condition for two years, and finally in 1602 Shimazu clan finally subordinated to Ieyasu. 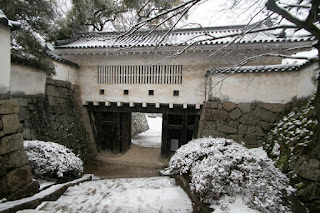 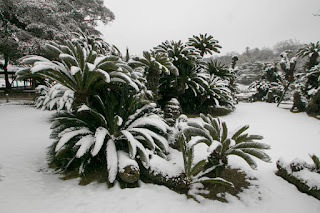 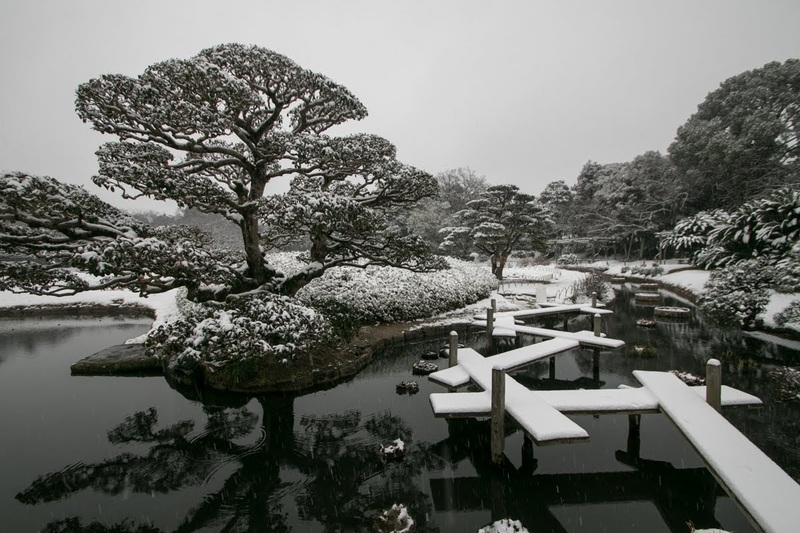 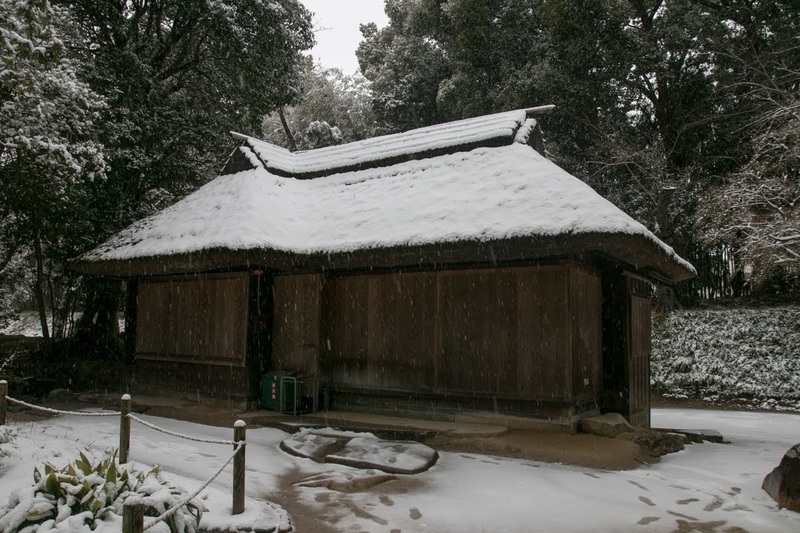 Hideie was hand over to Ieyasu, but due to the petition of Maeda clan, the house of his former wife and which supported Ieyasu, the life of Hideie was saved but exiled to Hachijyojima island, a distant island in the southern sea of Tokyo. 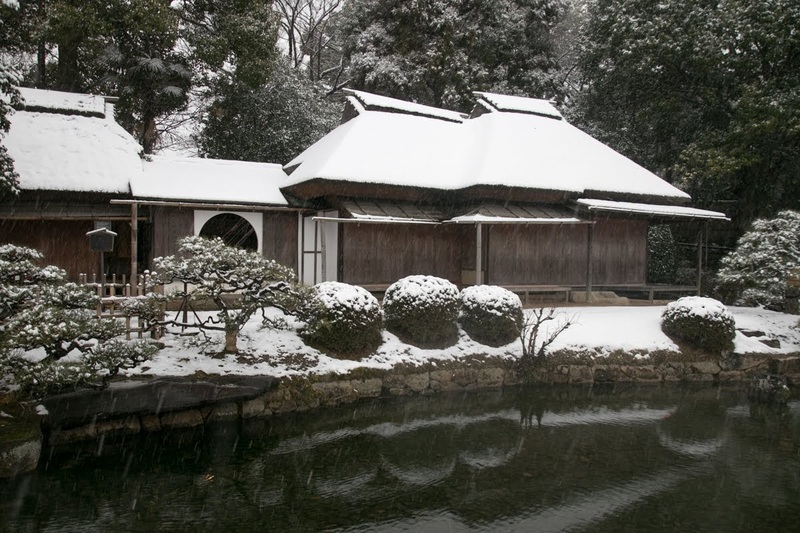 Hideie lived in this isolated island over 50 years, almost the twice period of his glorious period as a large feudal lord. His descendant could return to main land at the time of Meiji revolution, over 250 years after banishment. 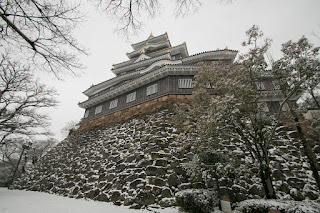 After Hideie, Hideaki Kobayakawa (1582-1602) became the lord of Okayama castle. 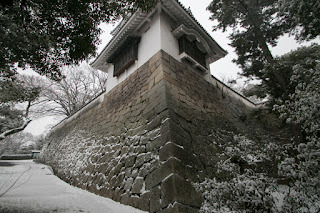 Hideaki was originaly a nephew of Kitanomandokoro, the formal wife of Hideyoshi Toyotomi. 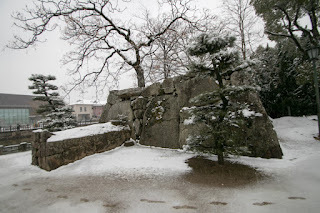 Being one of the rare relative of Hideyoshi, Hideaki was inevitably involved in political affairs. 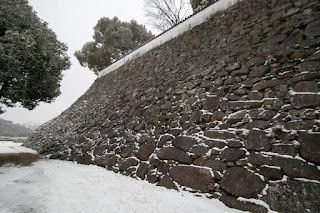 At first Hideyoshi planned to send Hideaki to Mouri clan, the powerful lord of Chugoku region, but Takakage Kobayakawa (1533-1597), the chancellor of Mouri clan, tried to avoid accepting him by main stream of Mouri clan and adopted him by Kobayakawa clan. 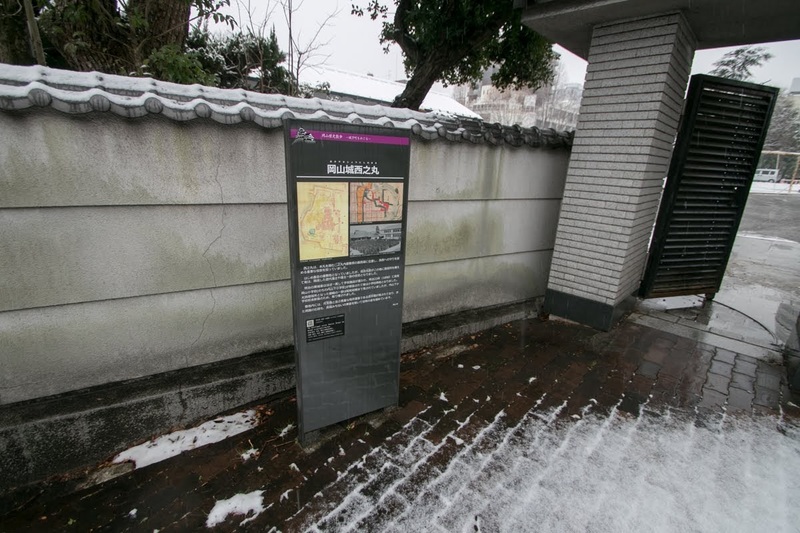 At the time of the battle of Sekigahara, Hideaki once belonged to Ishida side but also connected to Ieyasu and agreed betrayal. 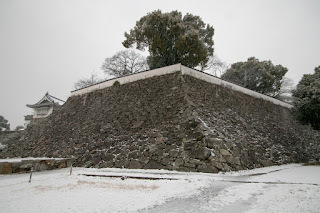 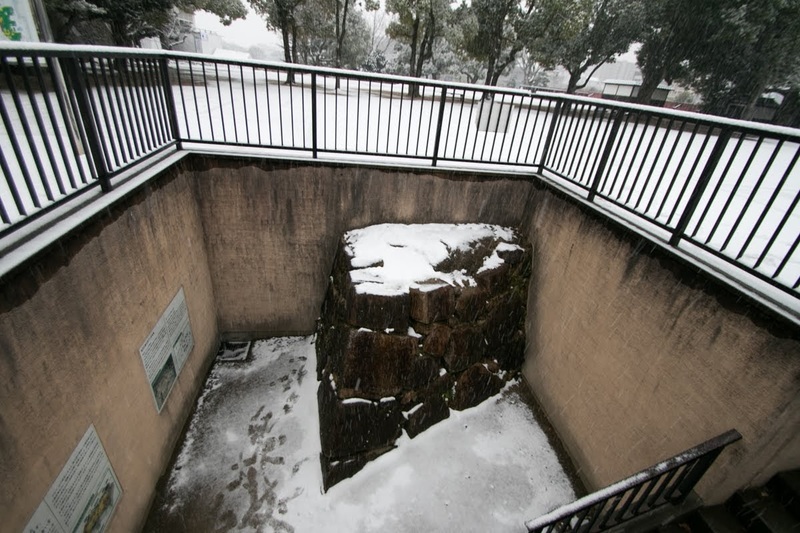 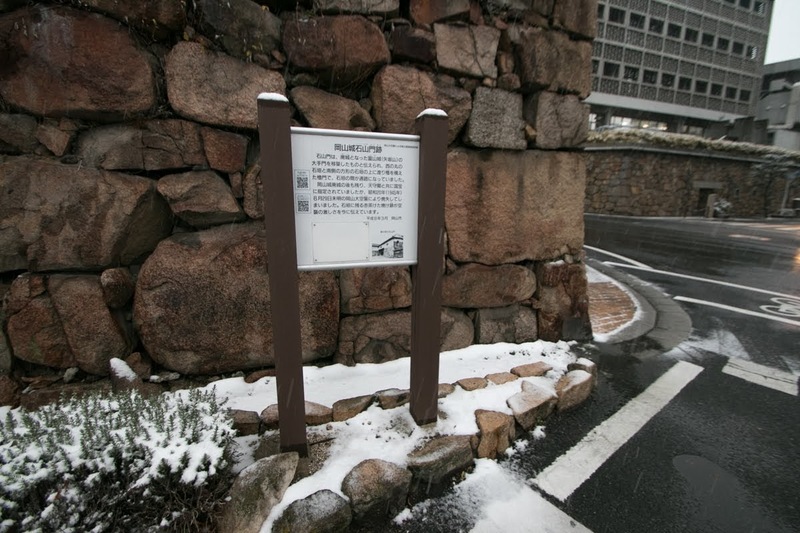 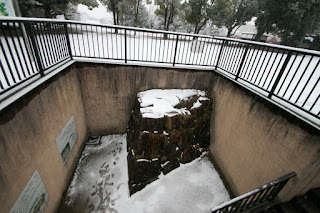 Hideaki occupied Matsuoyama fort which was built as a headquarter of Ishida side at Sekigahara without approval, and watched the situation of the battle from that fort. At first Ishida side well fought against Tokugawa clan, but at the noon Hideaki finally decided to support Ieyasu and suddenly assaulted the side of Ishida army with large force. 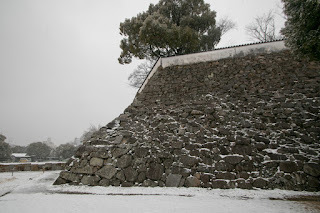 Yoshitsugu Otani (1559-1600), an excellent general and sworn friend of Mitsunari who guarded this side anticipated the betrayal of Hideaki and stand this attack, but finally outnumbered by Kobayakawa army and died in the battlefield. 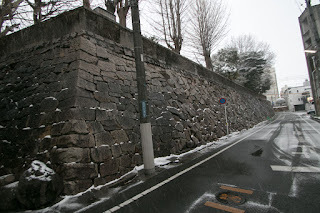 This attack totally changed the situation and Ishida army was annihilated by Tokugawa army. The action of Hideaki was decisive factor for the battle. After the battle, being considered his achievement, Hideaki succeeded former territory of Ukita clan and became the large feudal lord. Hideaki reformed Okayama castle and committed internal administration such as improvement of castle town or development of new rice fields. 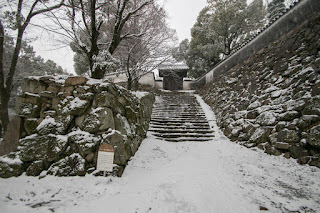 But in 1602, Hideaki died only in 20 years old without successor, and Kobayakawa clan was extinguished. 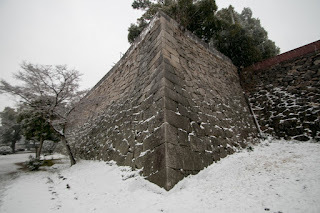 It is said that Hideaki was cursed by Yoshitsugu Otani who was killed by his betrayal, and apart from the truthfulness of this story, Hideaki might be anguished about being said as betrayer. 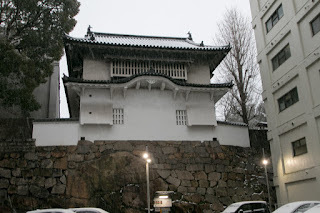 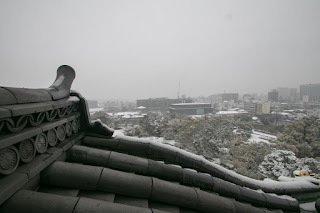 Subsequent to the extinction of Kobayakawa clan, Tadatsugu Ikeda (1599-1615), the second son of Terumasa Ikeda (1565-1615) who was the lord of Himeji castle (Hyogo prefecture) was appointed as a lord of Bizen country. 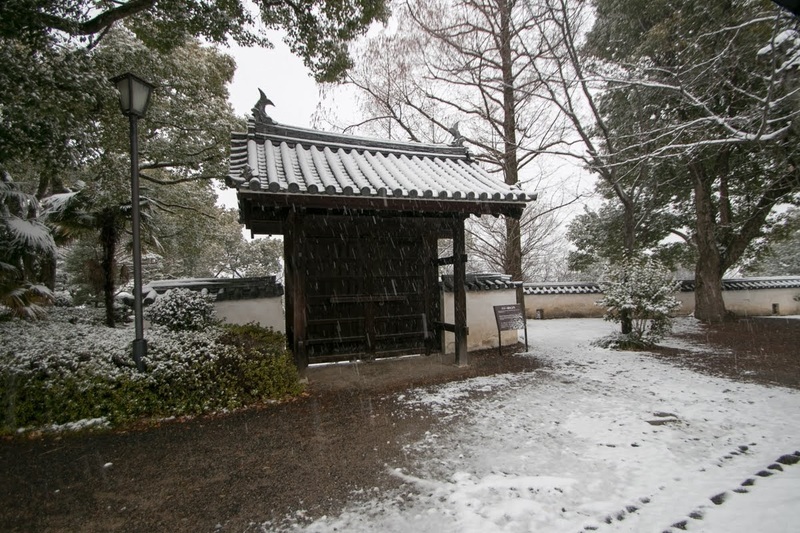 As a marriage relative of Tokugawa clan, Ikeda clan once held Harima country, Bizen country and Inaba country (Tottori prefecture). Later Harima country was confiscated but Ikeda clan governed Bizen country (Okayama domain )and Inaba country (Tottori domain) by each branch house and prospered as a large feudal lord. During the reign of Ikeda clan, Mitsumasa Ikeda (1609-1682) focused on the development of production and education and was regarded as an excellent lord. 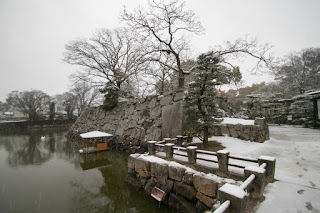 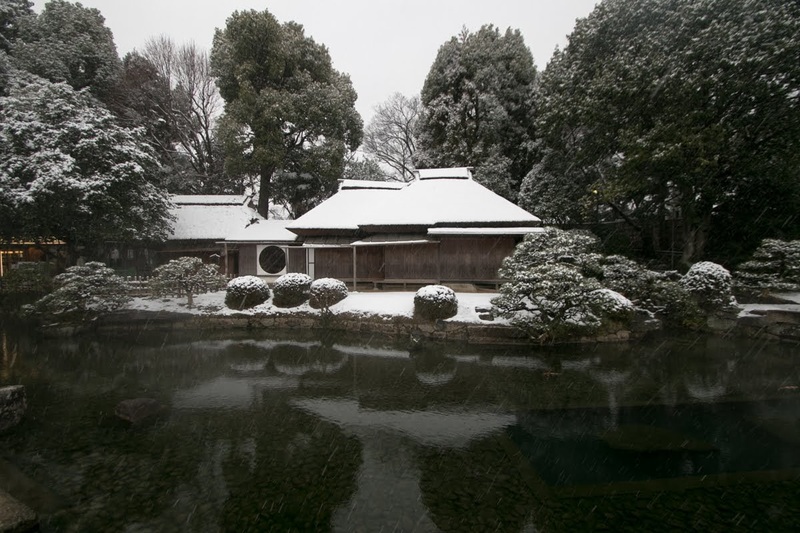 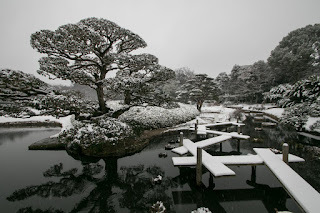 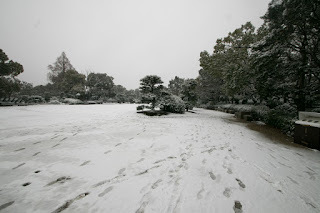 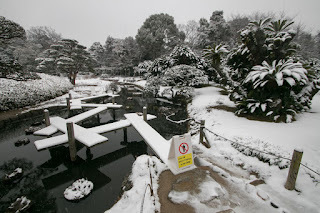 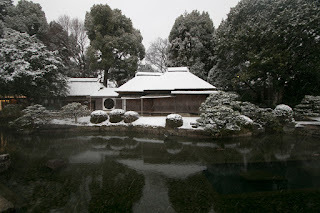 Further his son Tsunamasa Ikeda (1638-1714) created a large Japanese style garden named as Korakuen on the opposite side of Asahigawa river, in front of main tower. 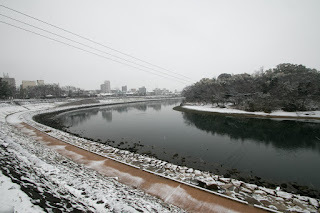 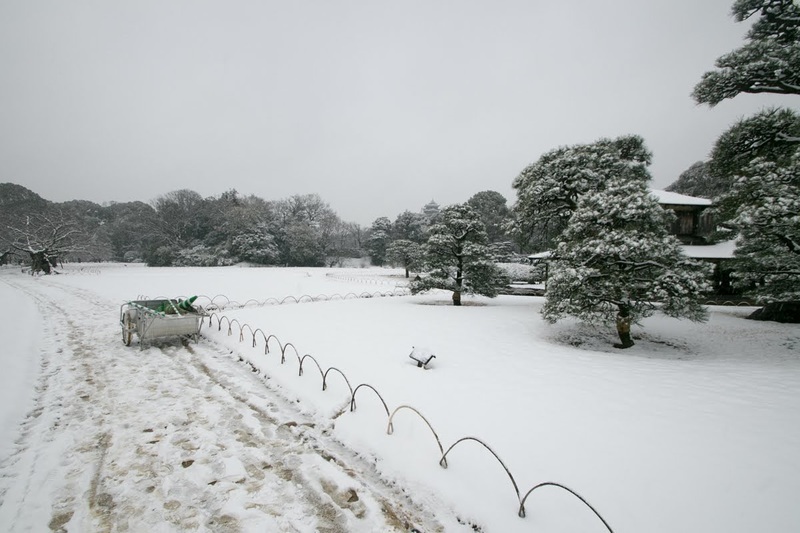 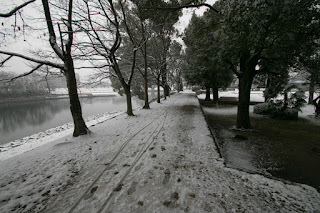 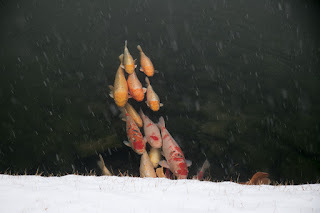 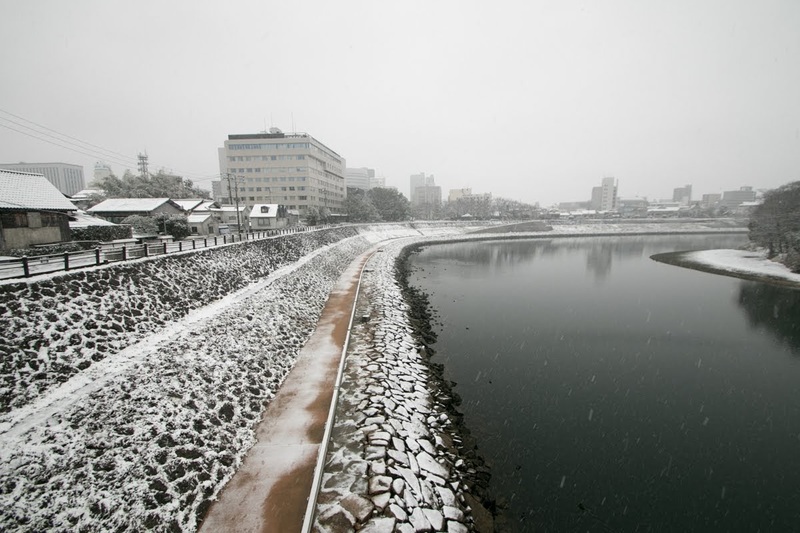 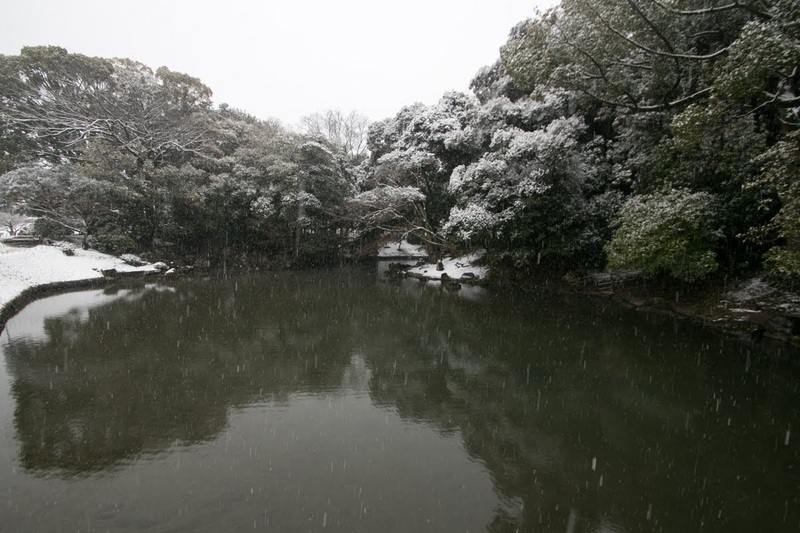 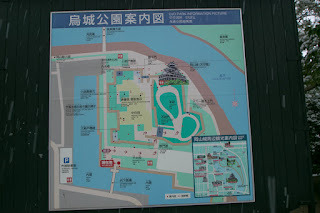 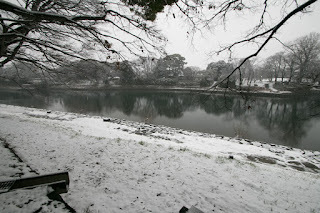 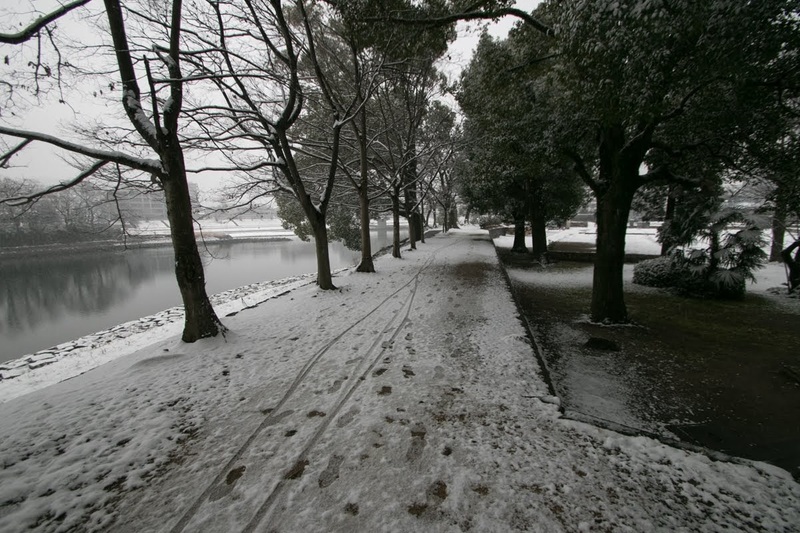 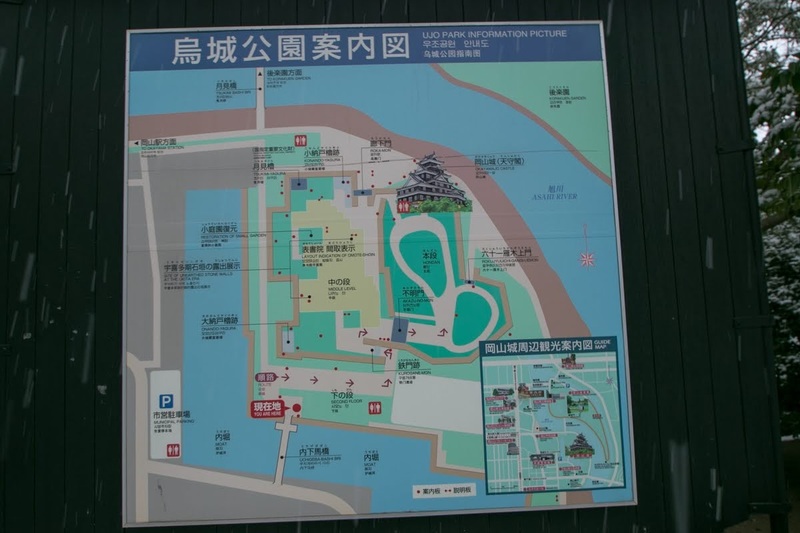 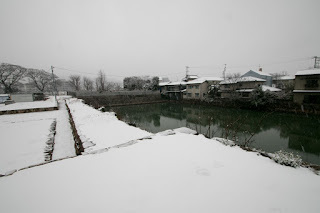 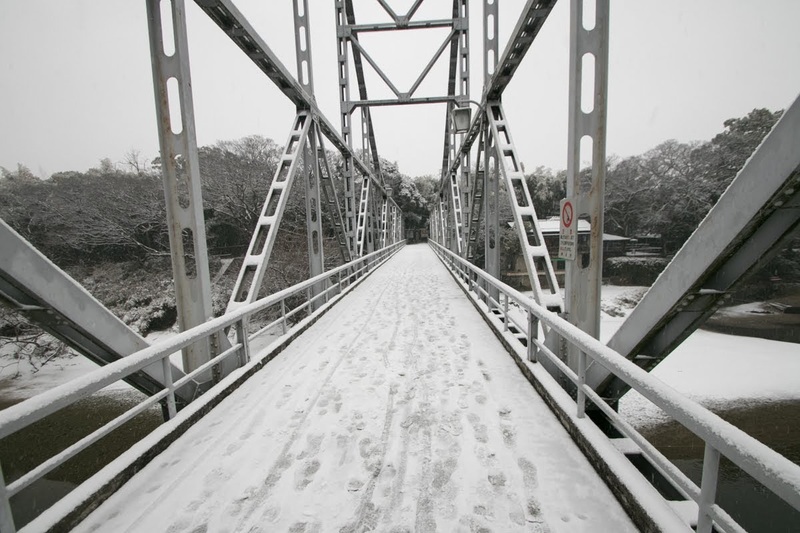 Korakuen is a large artificial island of 400 meter length surrounded by Asahigawa river and a drainage canal. 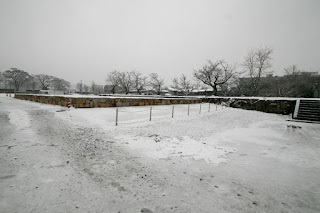 This garden was built to prevent the flood of Asahigawa river, and also might be the purpose of the fort against enemies attack from backside of the castle (Main tower directly faced Asahigawa river and might be easily attacked by cannons at the opposite of the river). 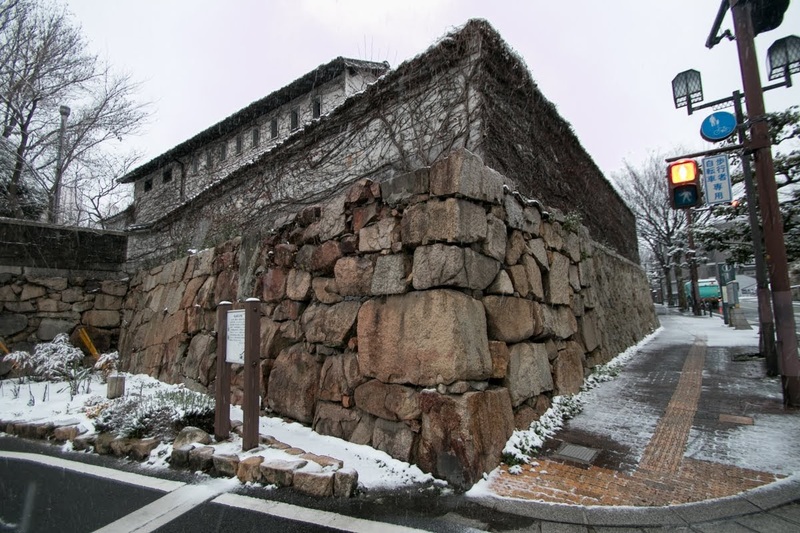 Subsequent to Meiji revolution, many buildings were broken but main tower and some turrets in the central area were preserved. But regrettably original main tower was burned down by the bombing during WW2, and currently only two turrets remain as original. 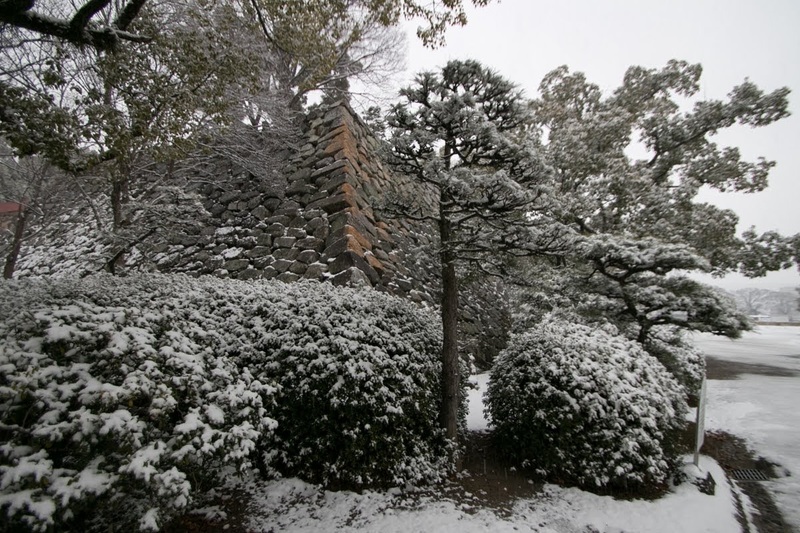 An imitation of main tower was reconstructed in 1966, and is regarded as a symbol of Okayama city along with Korakuen garden. 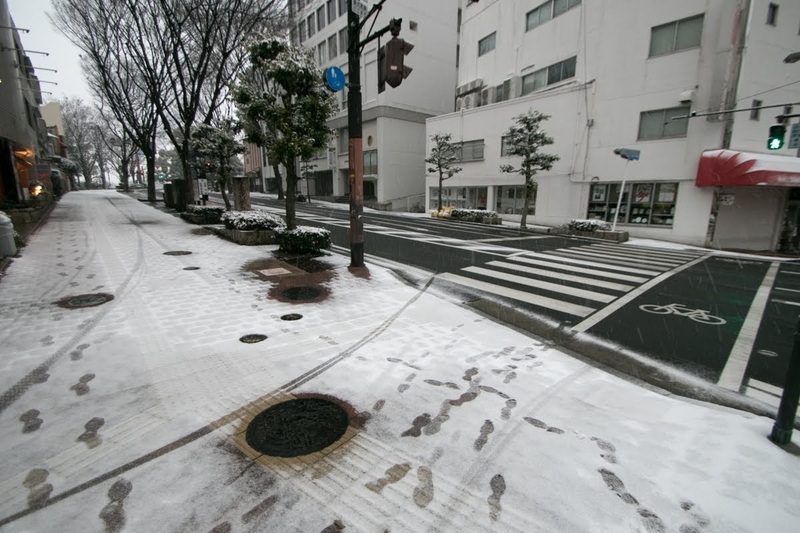 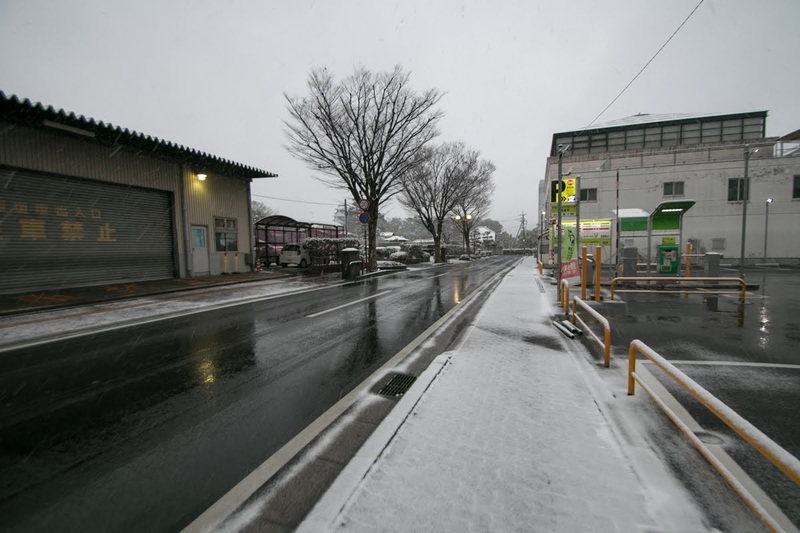 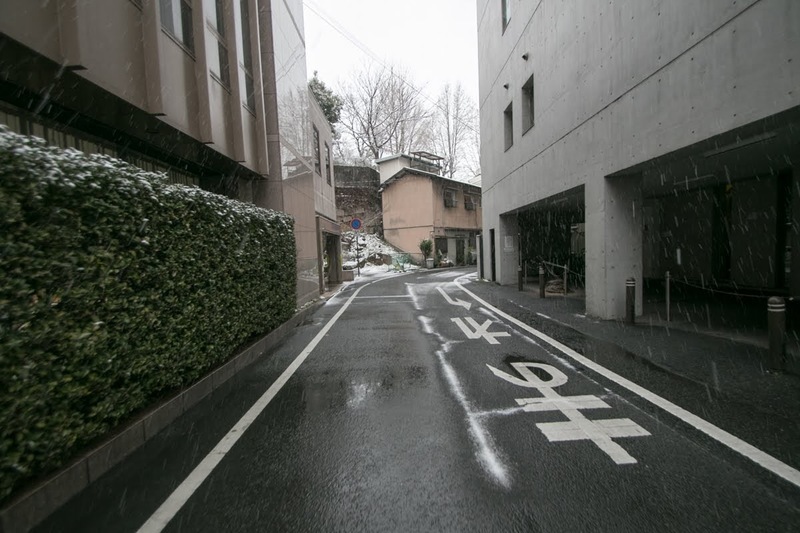 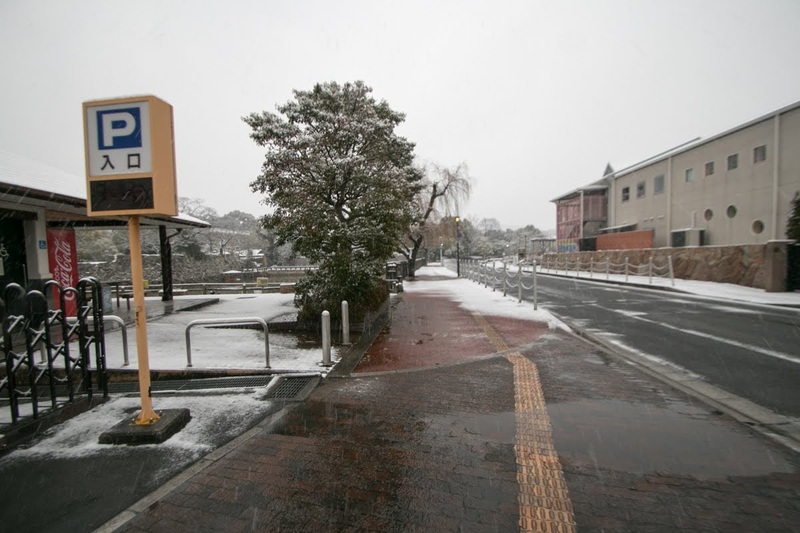 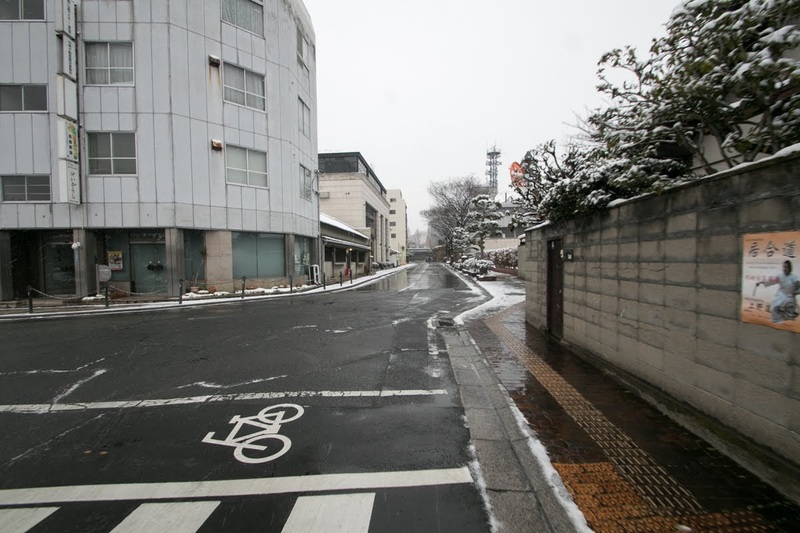 15 minutes walk from JR West Sanyo Shinkansen line / Sanyo Honsen line Okayama station. 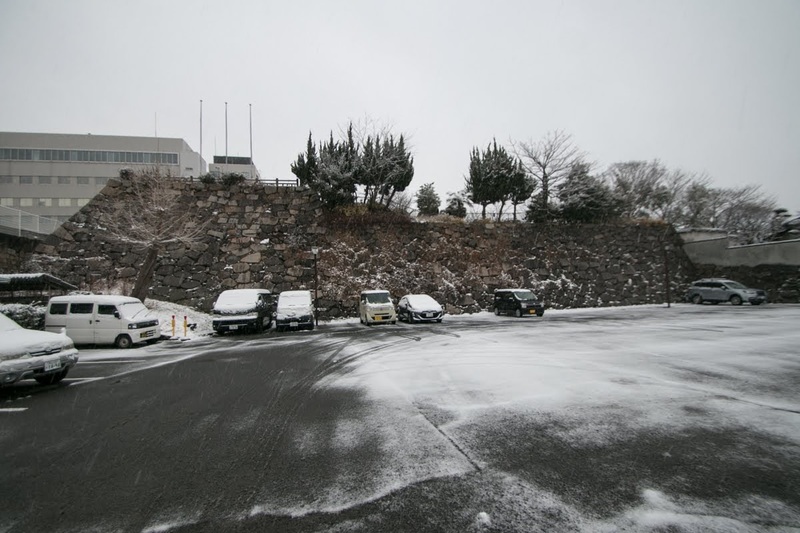 20 minutes drive from Sanyo Jidoshado Expressway Okayama interchange.